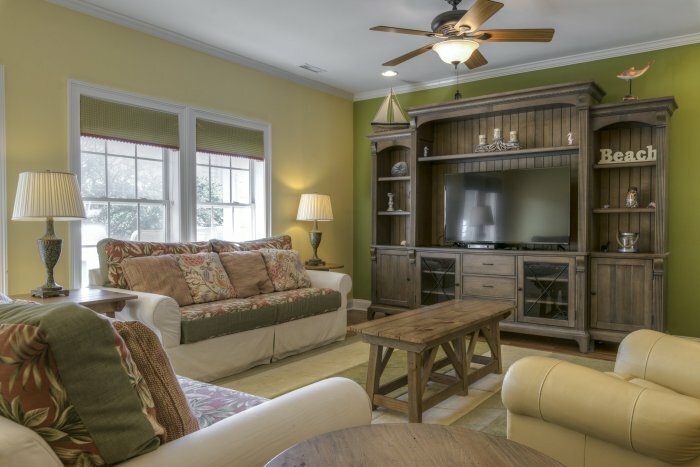 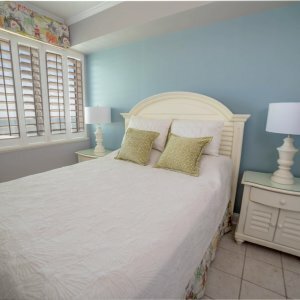 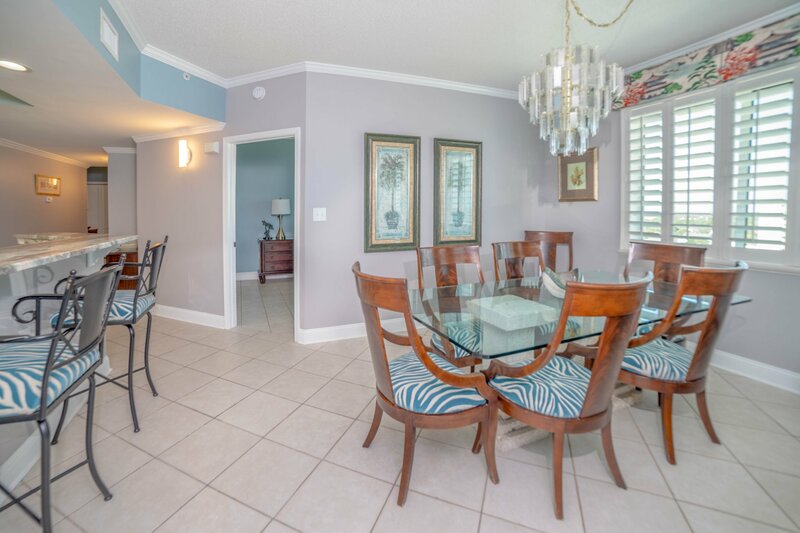 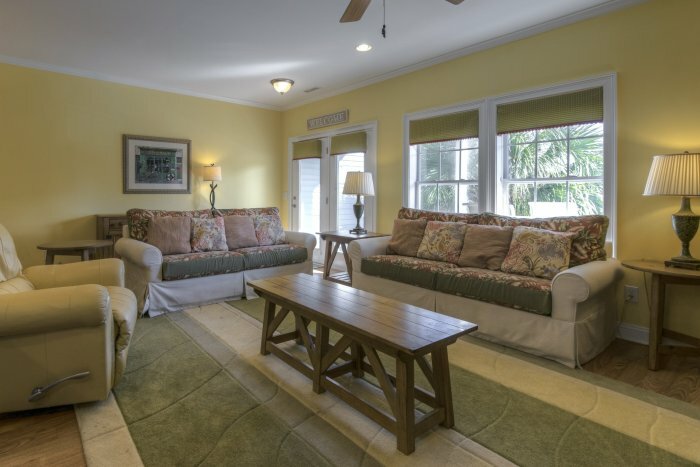 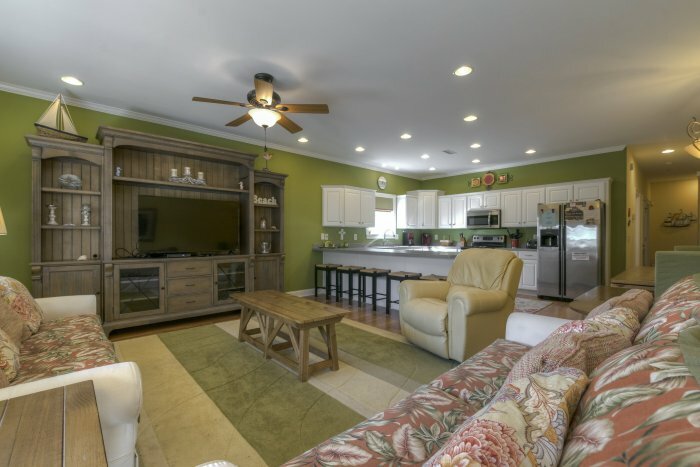 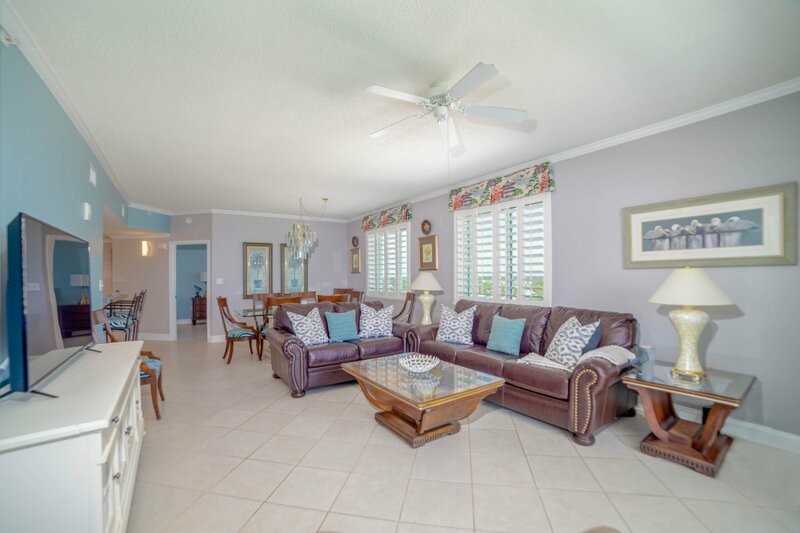 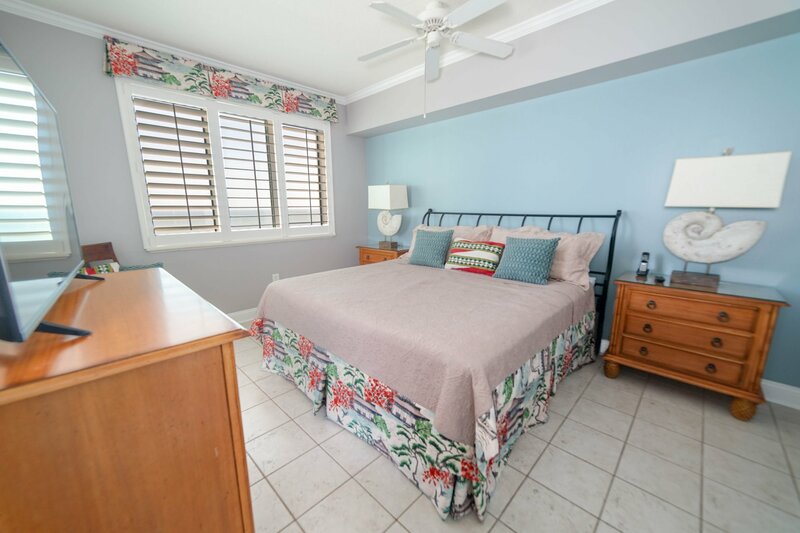 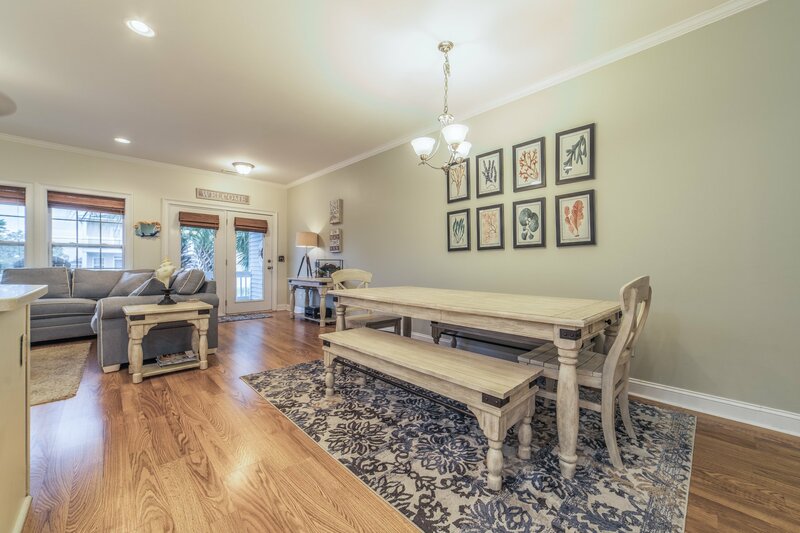 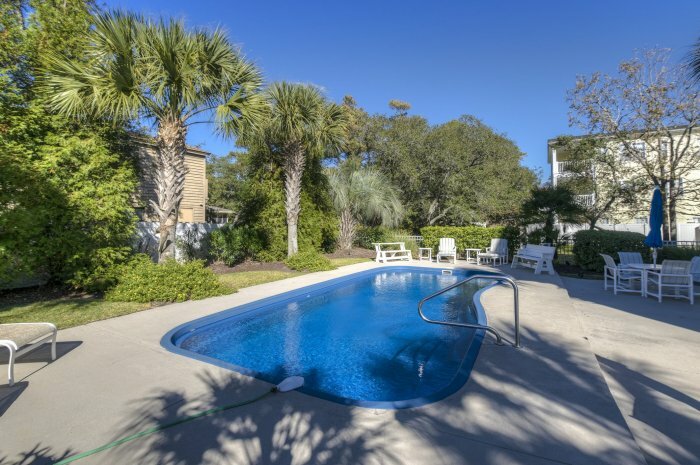 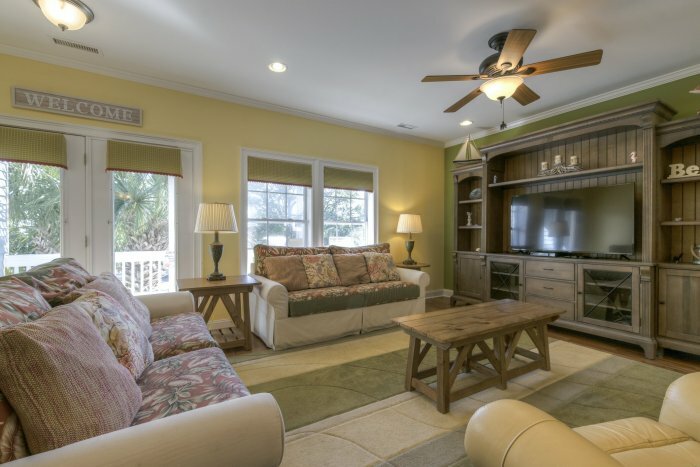 Located within a short walk to the beach, do not pass up this luxuriously decorated and maintained duplex perfect for families and golfers! 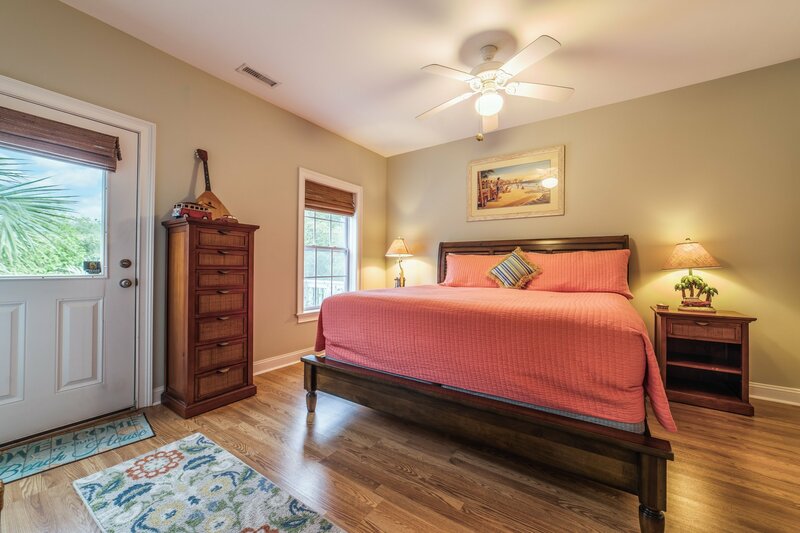 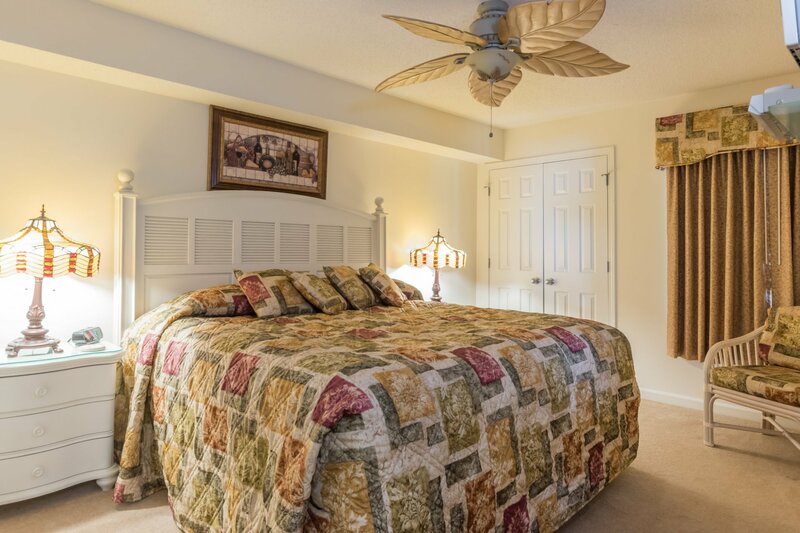 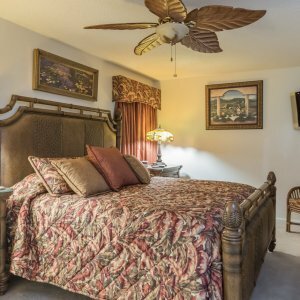 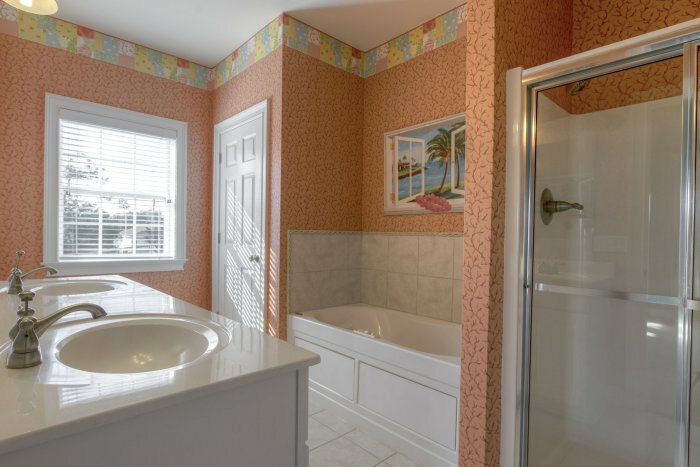 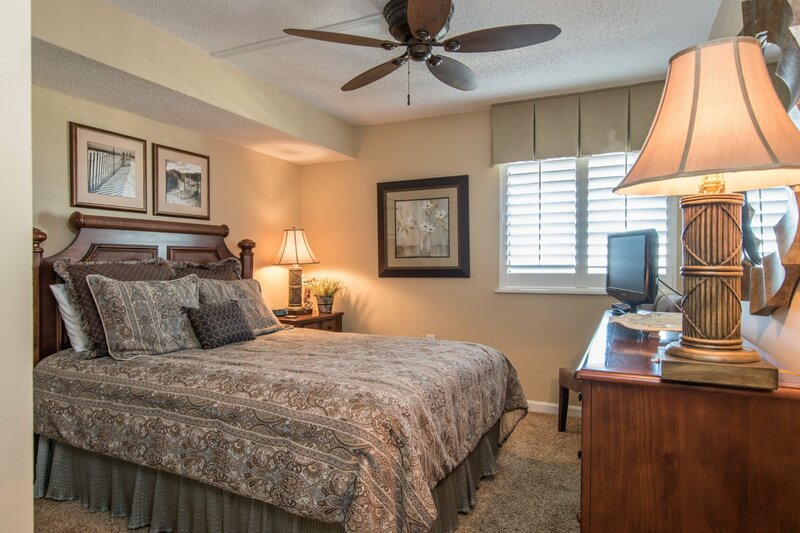 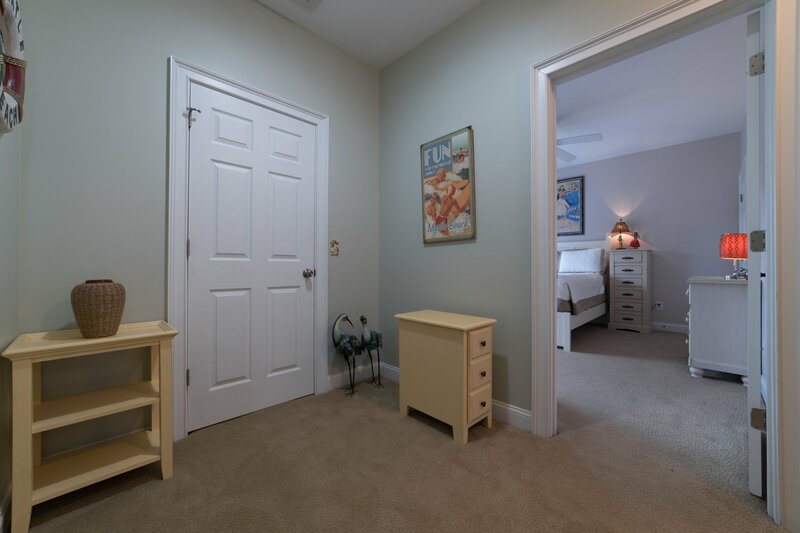 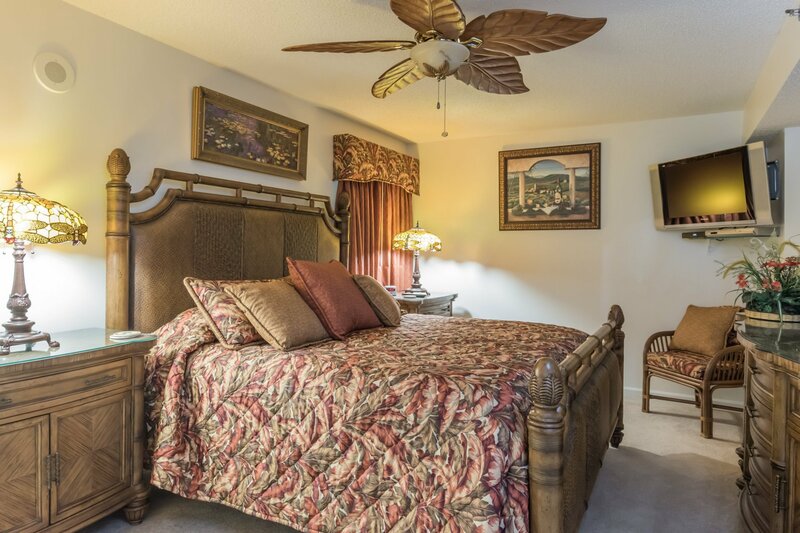 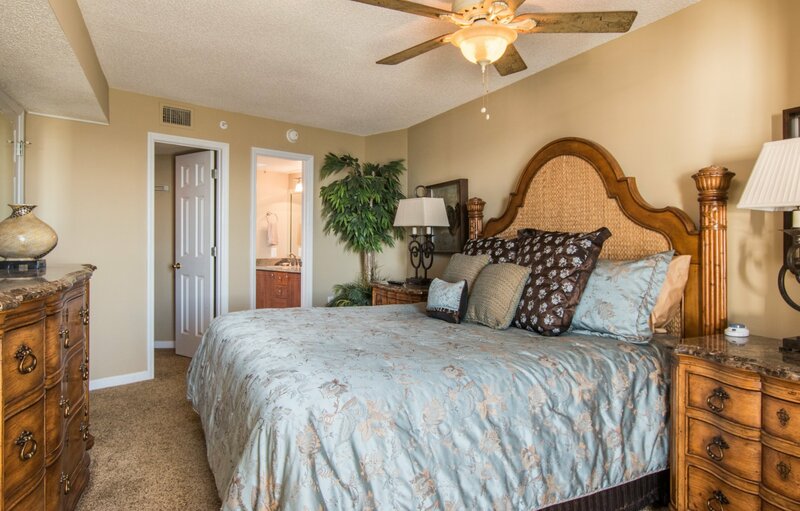 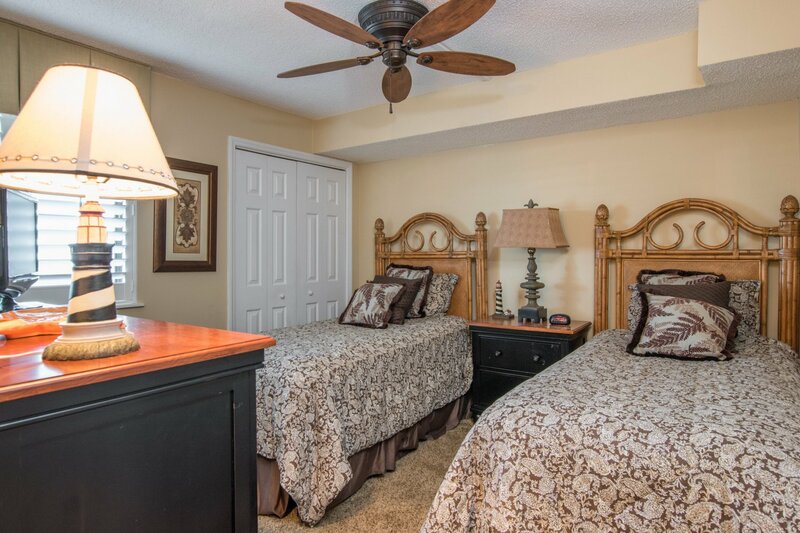 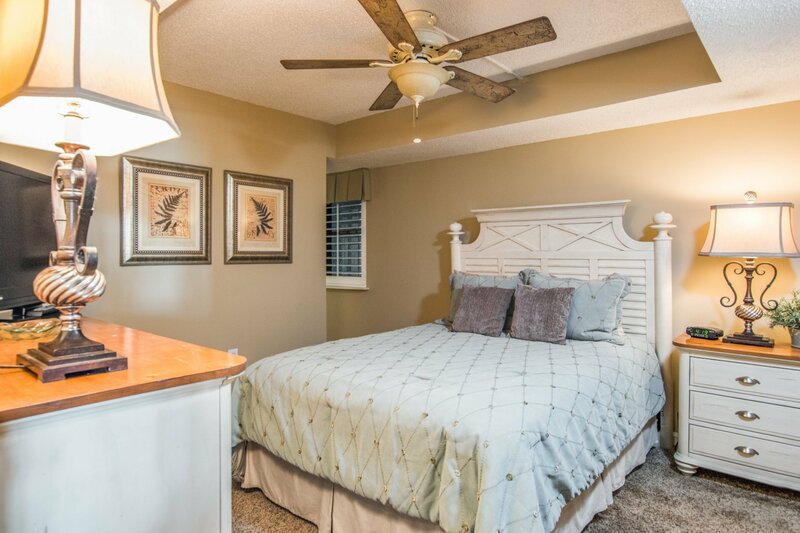 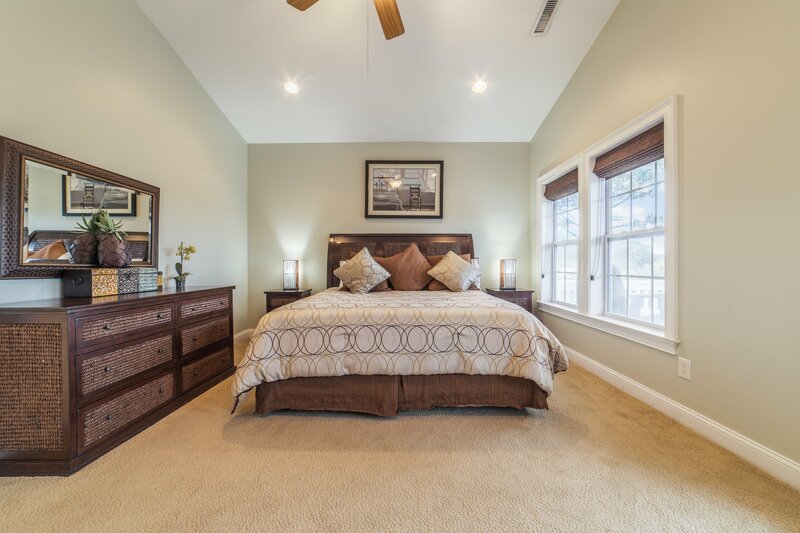 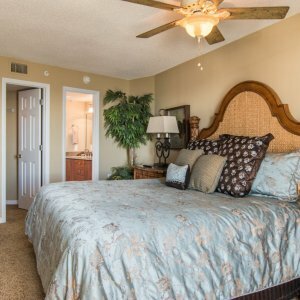 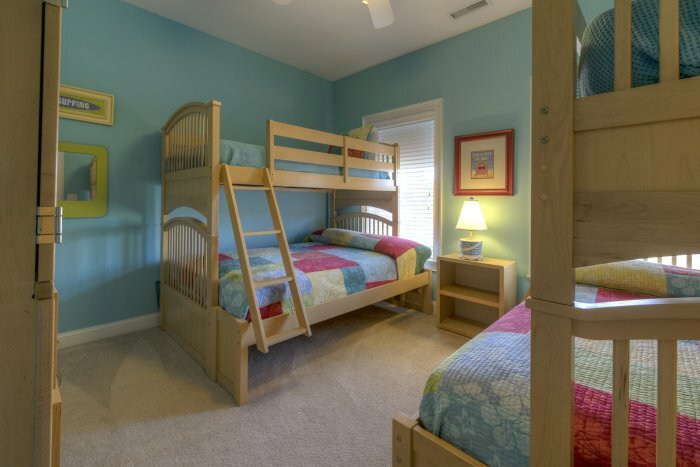 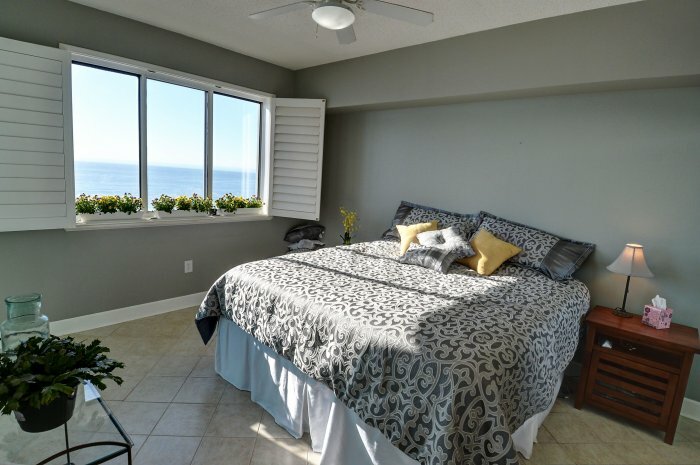 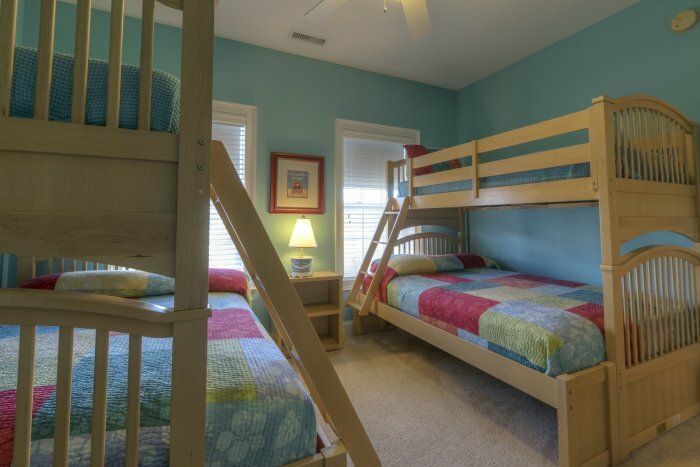 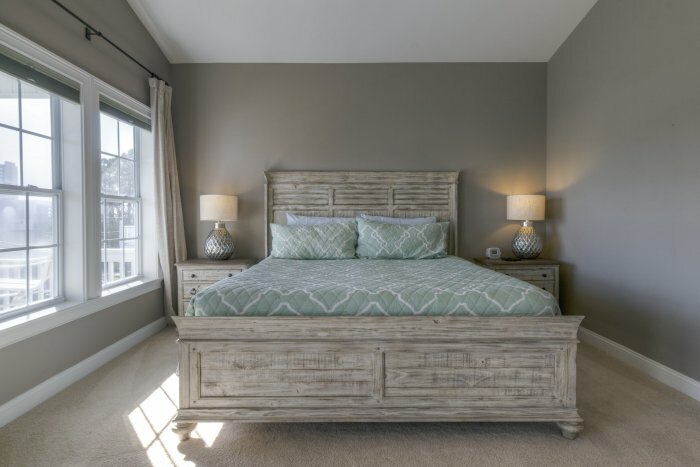 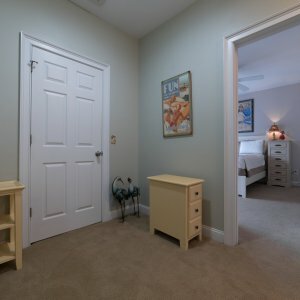 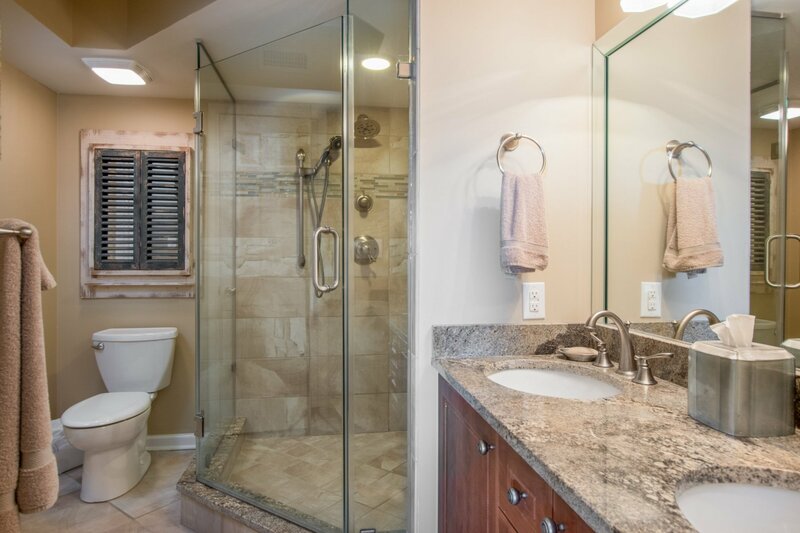 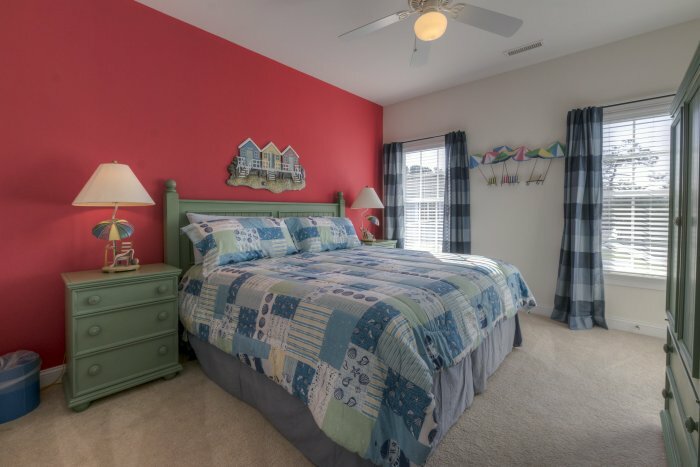 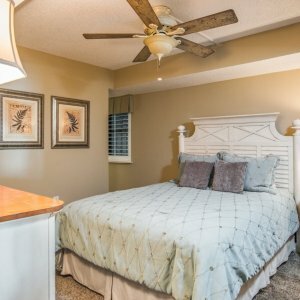 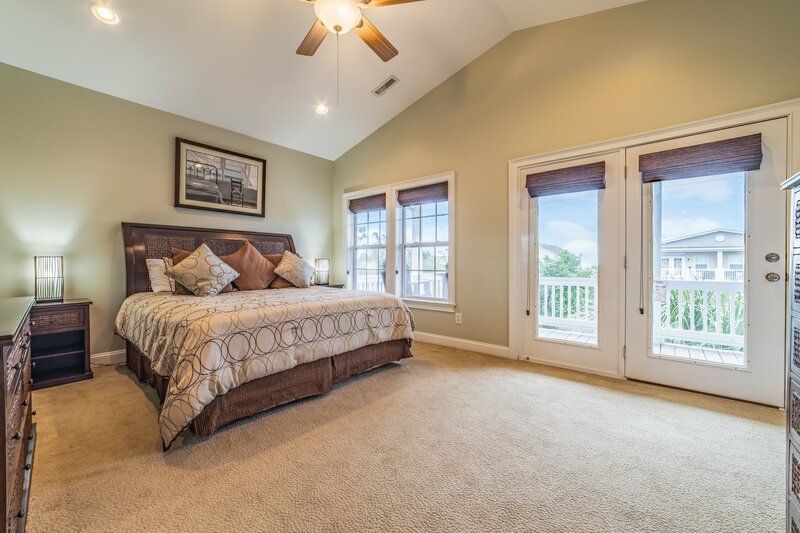 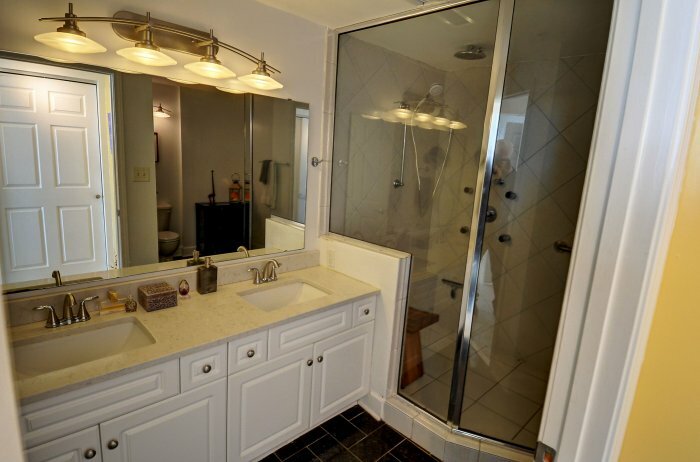 This condo offers 2 master bedrooms. 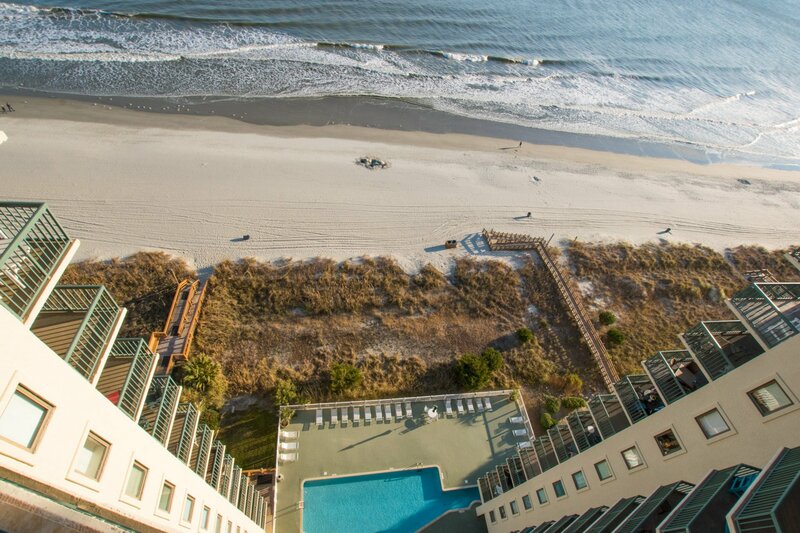 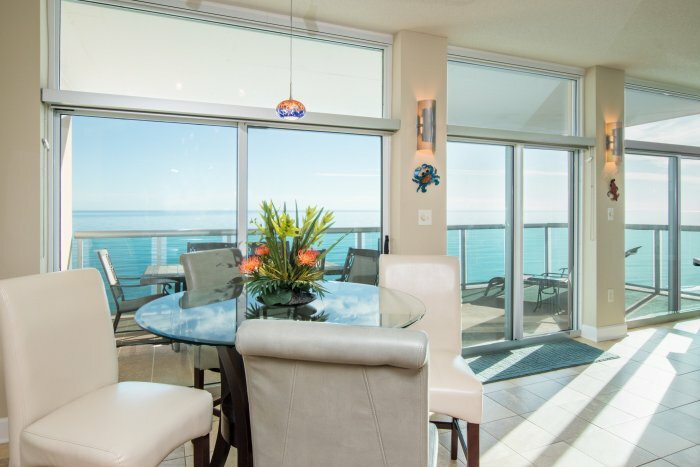 One visit and you will know why we gave this condo the Elite Designation. 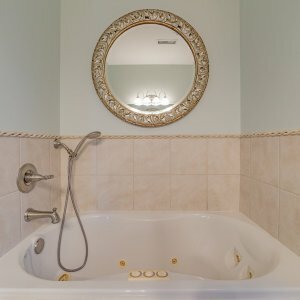 You will not find another like it. 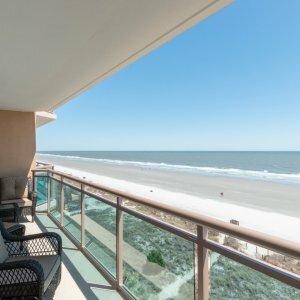 Golf cart included in rental! 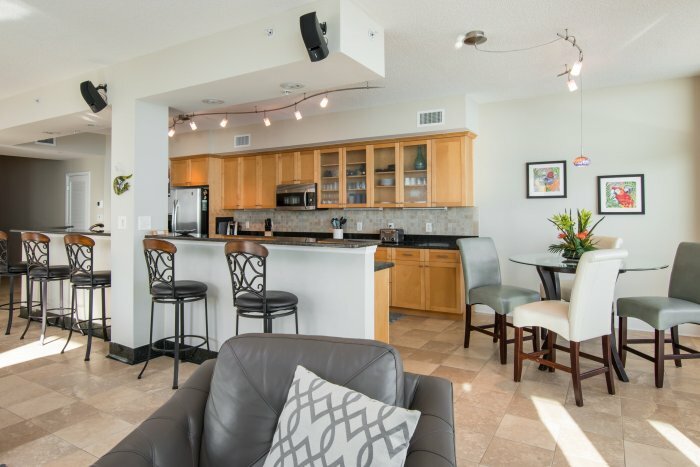 This beautiful Elite Penthouse has been completely upgraded and features 9-ft. ceilings. 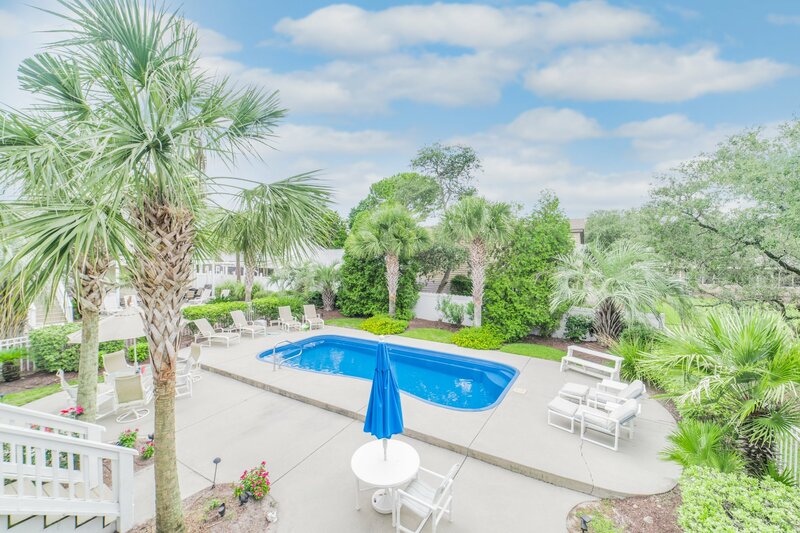 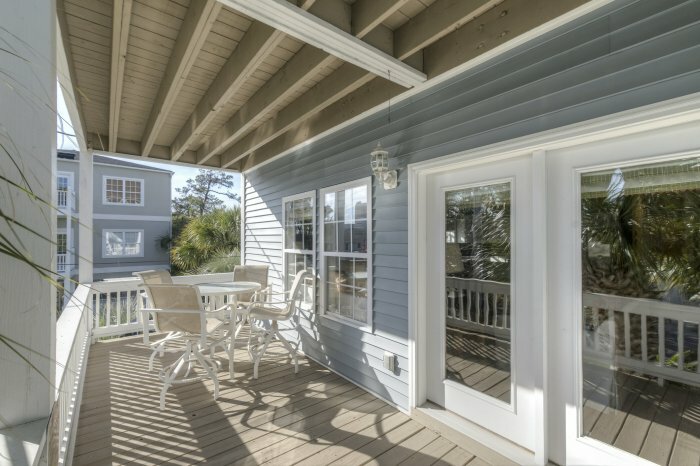 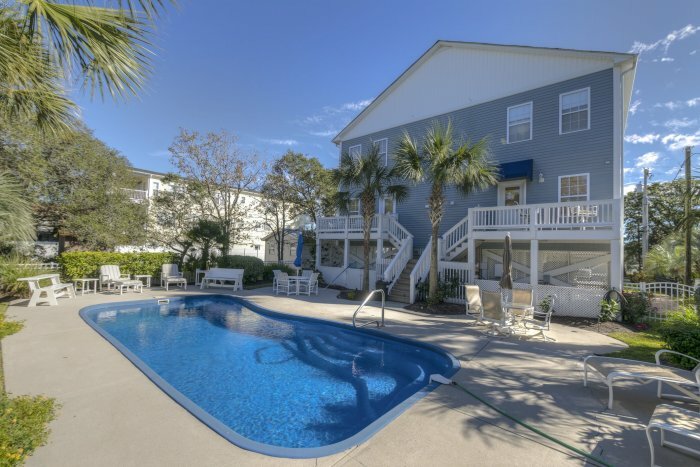 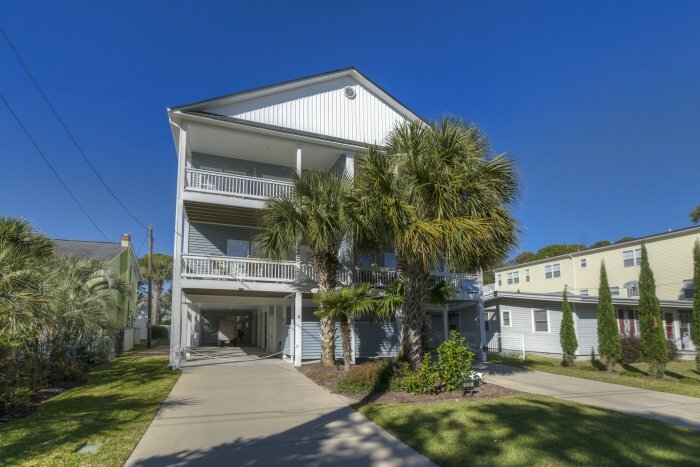 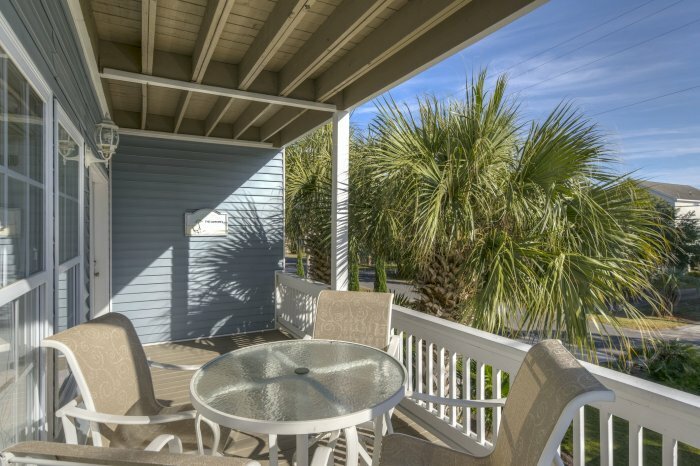 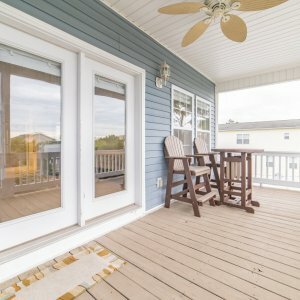 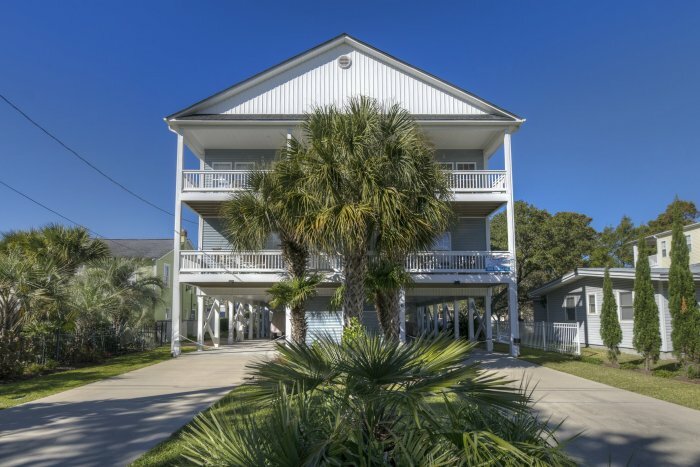 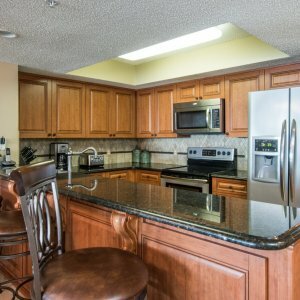 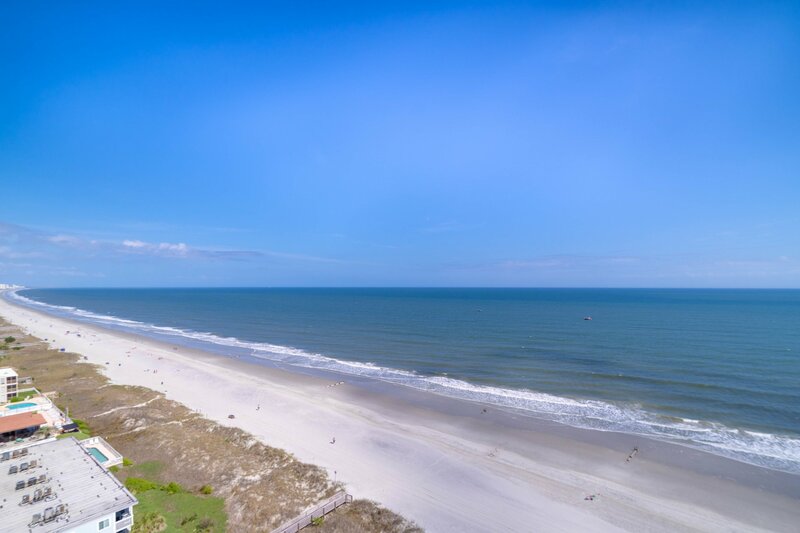 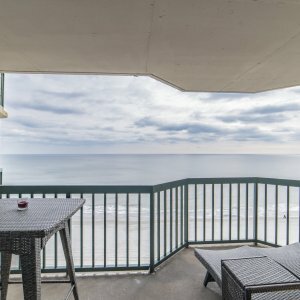 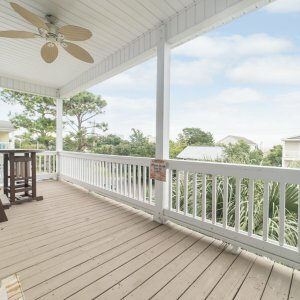 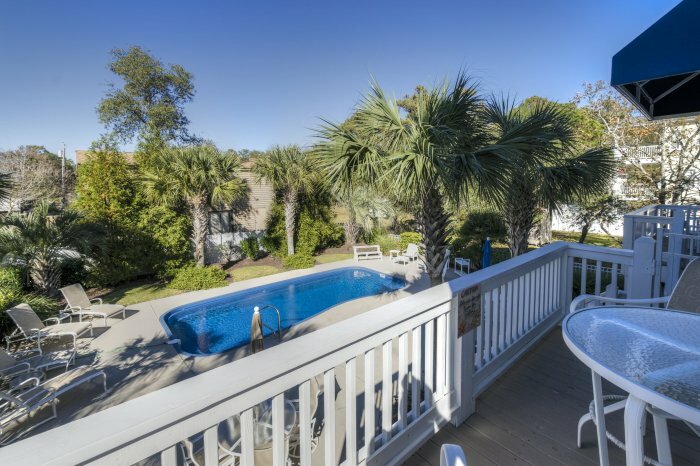 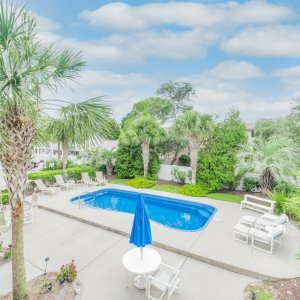 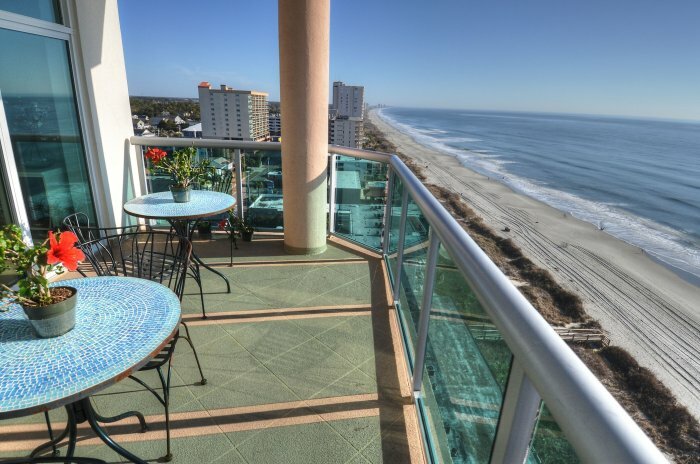 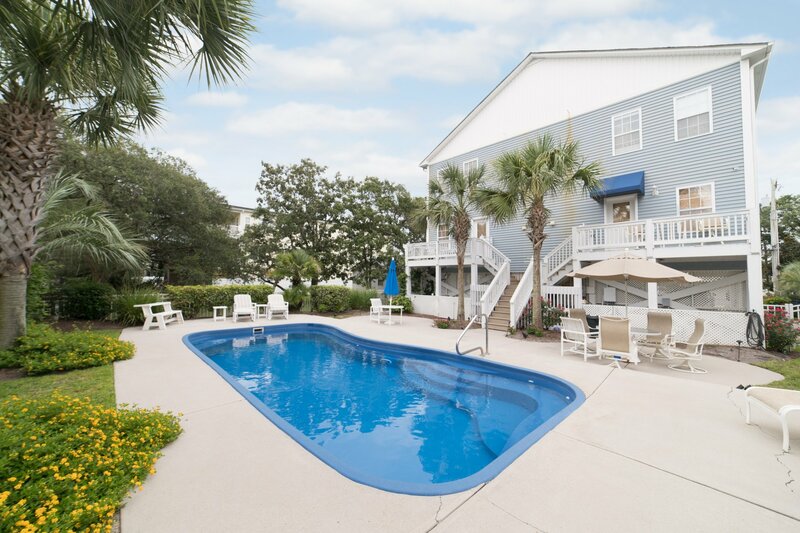 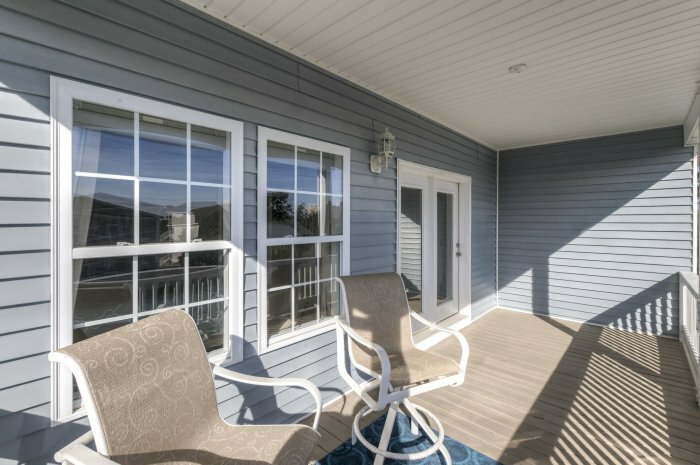 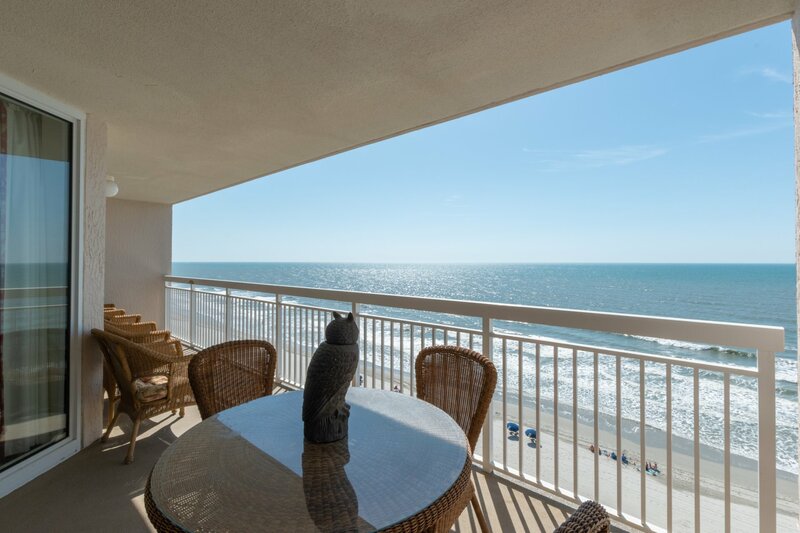 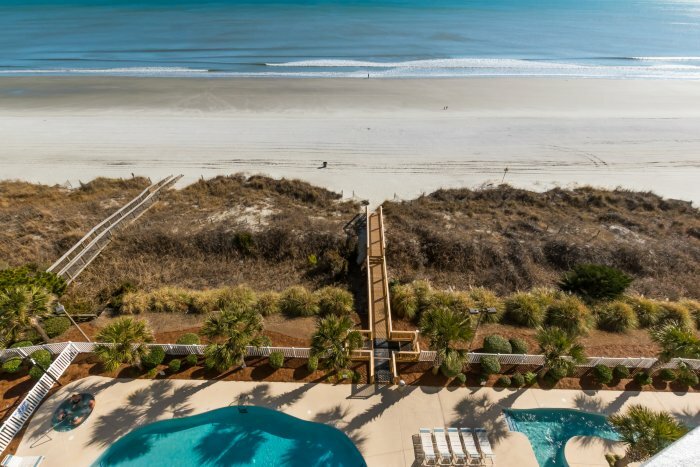 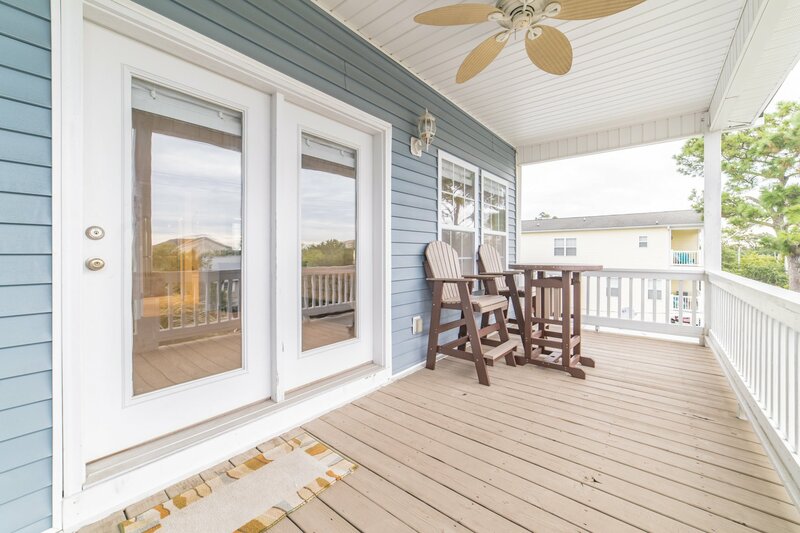 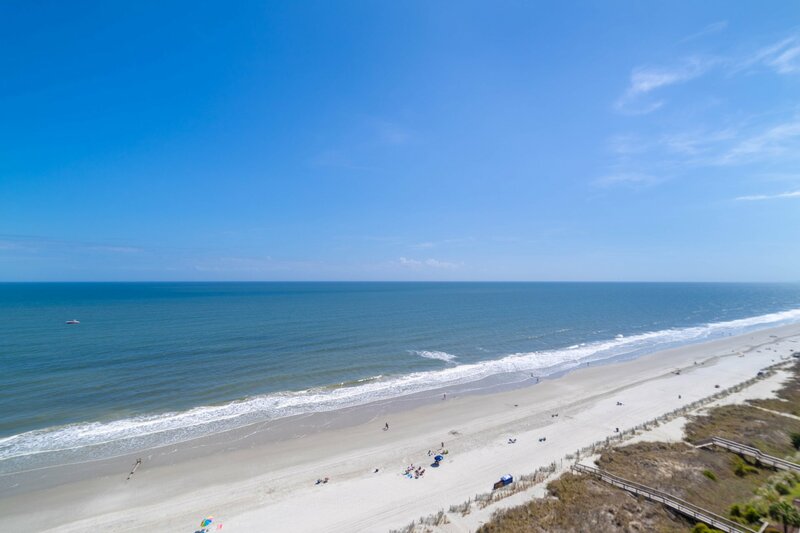 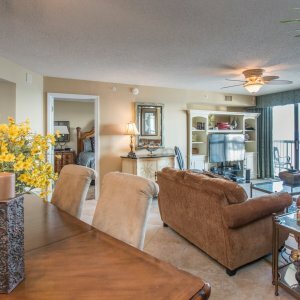 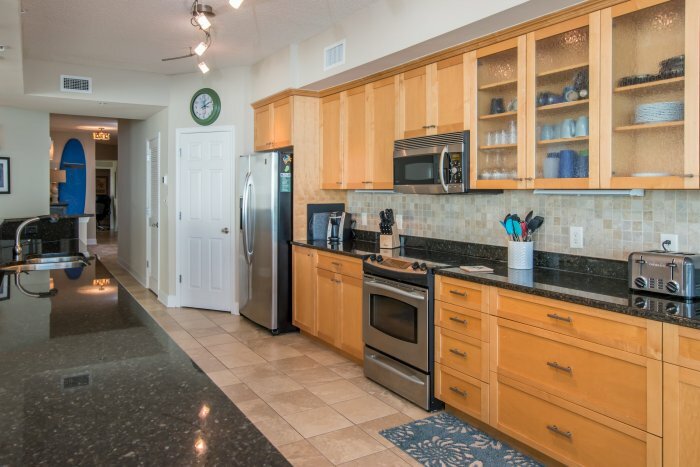 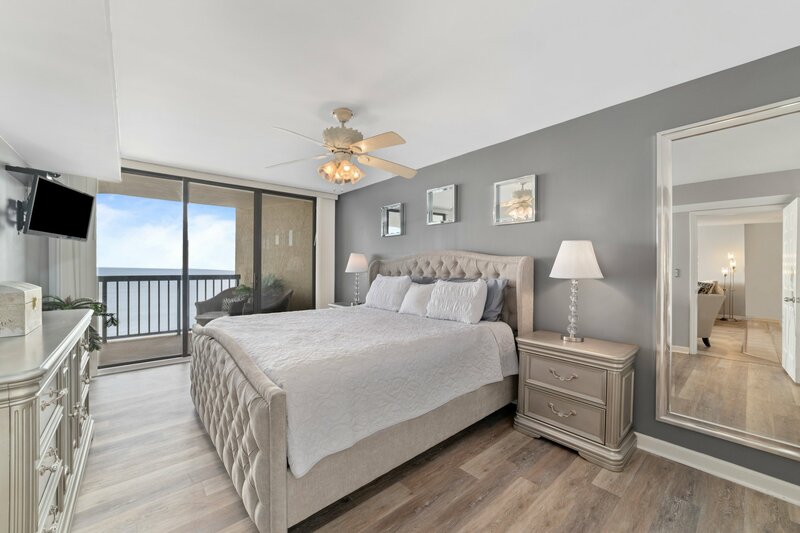 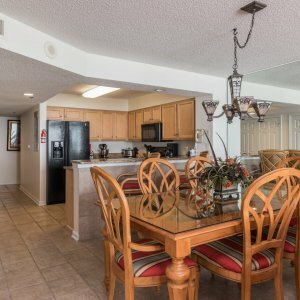 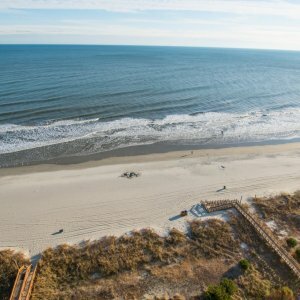 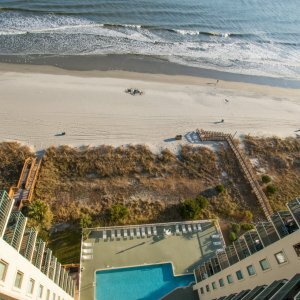 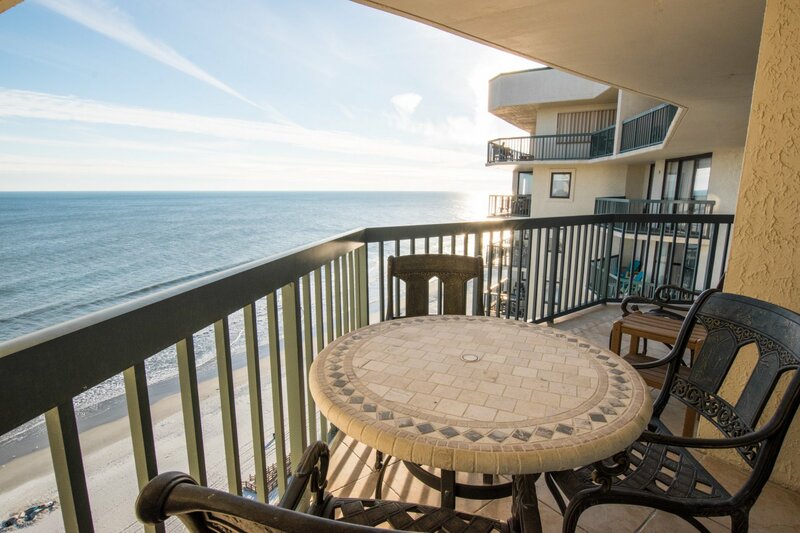 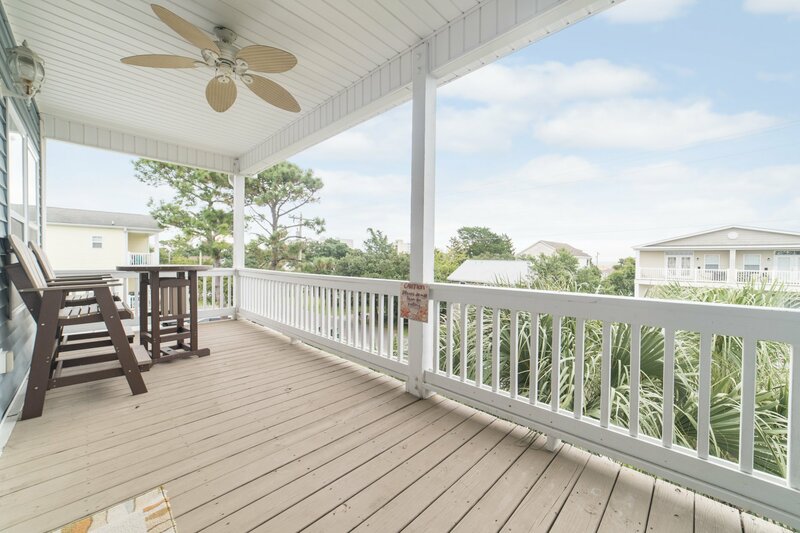 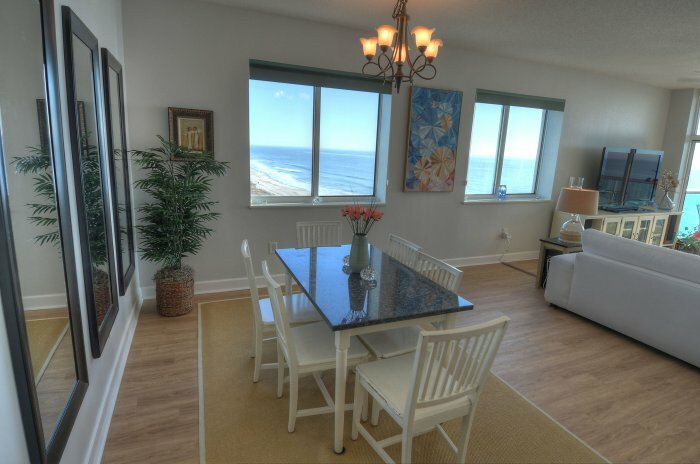 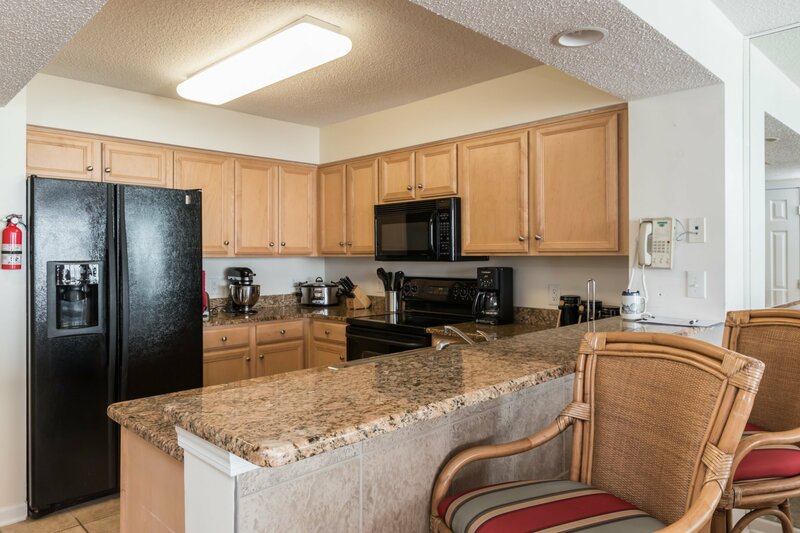 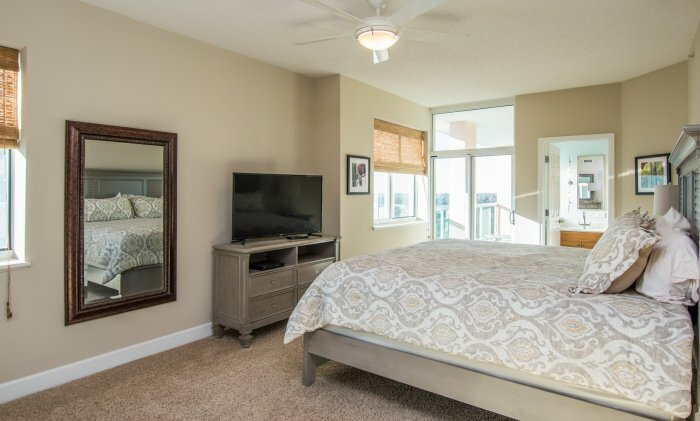 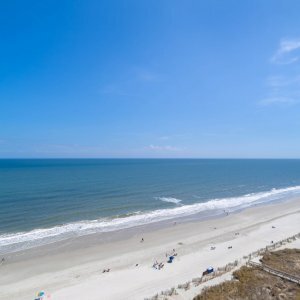 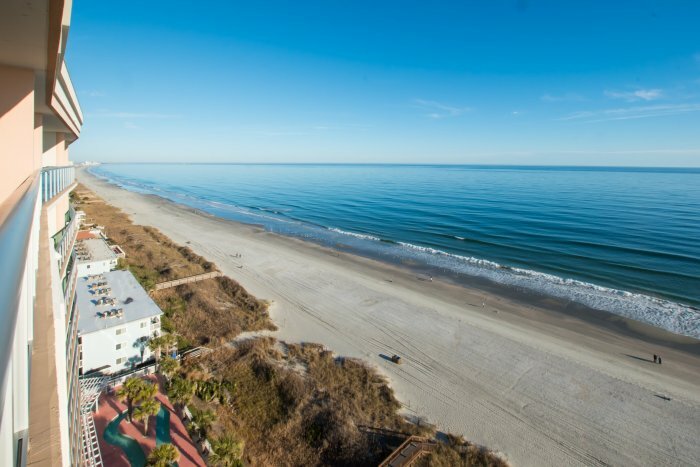 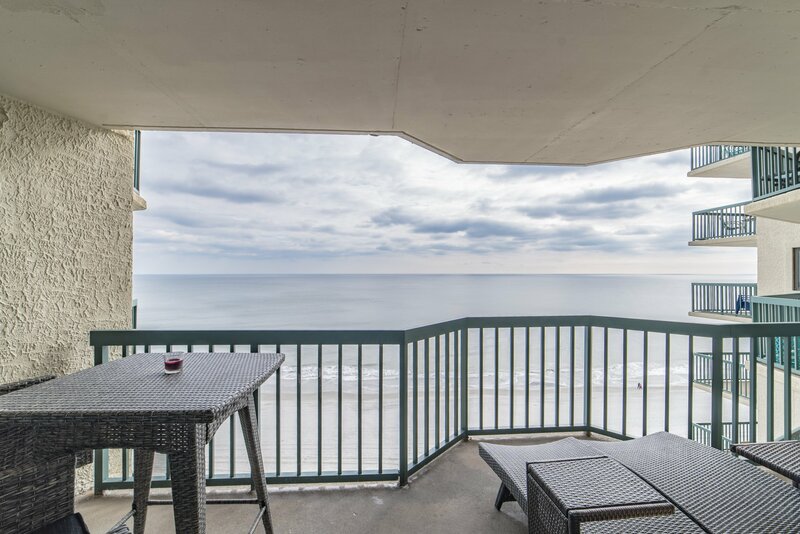 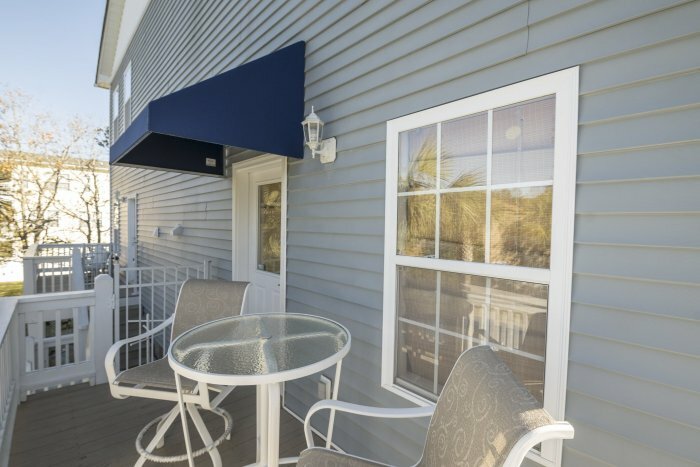 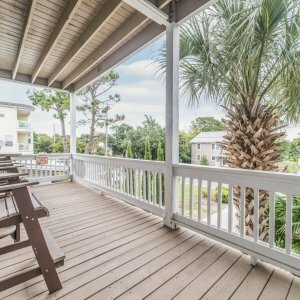 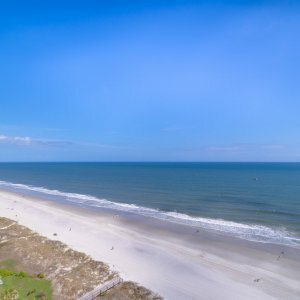 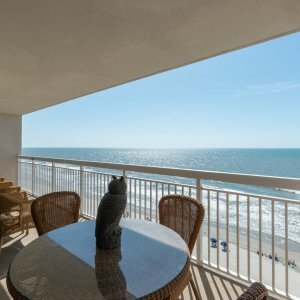 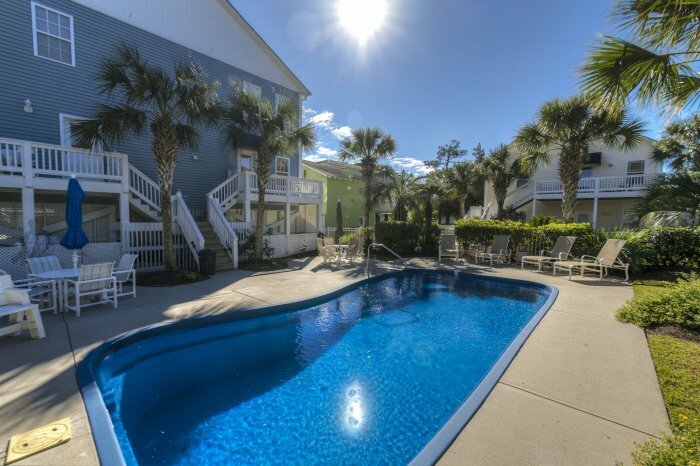 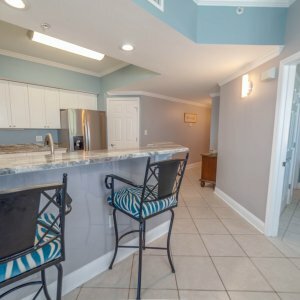 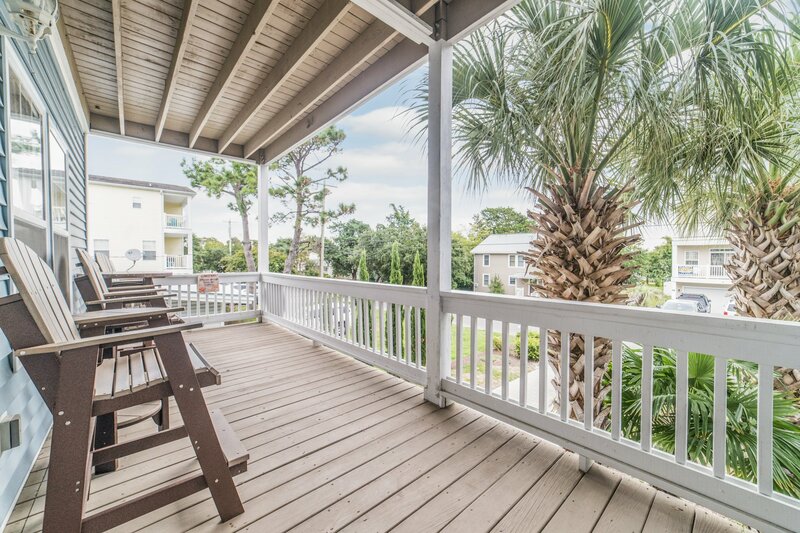 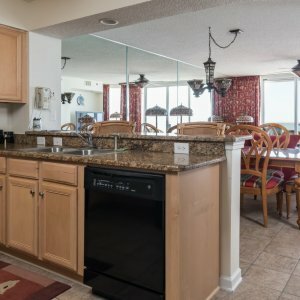 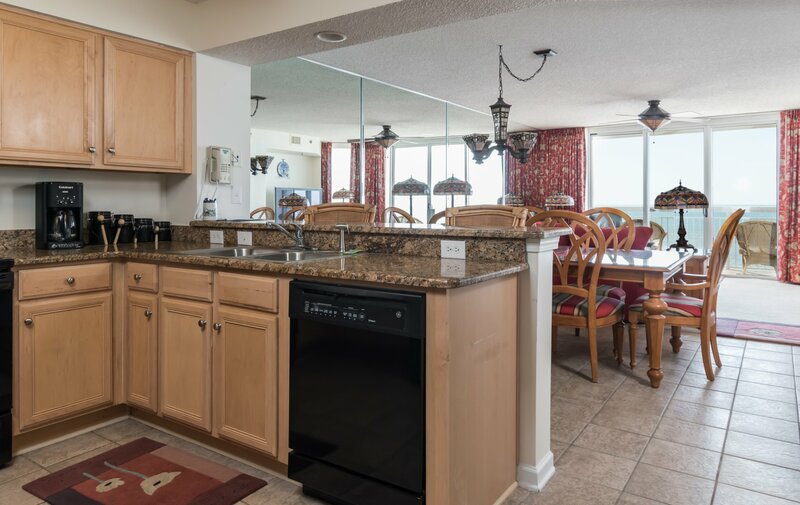 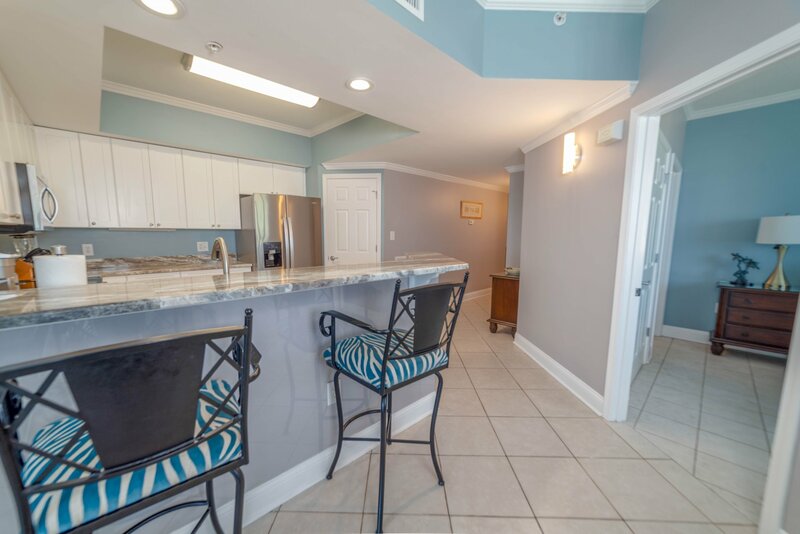 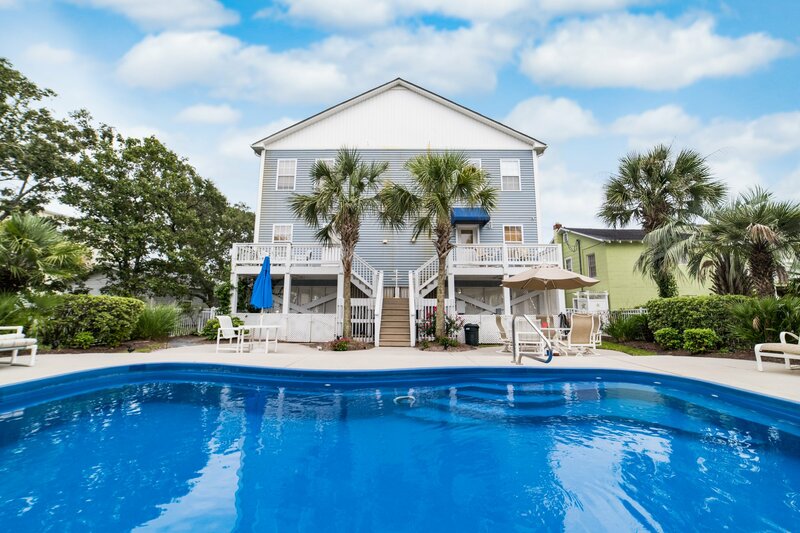 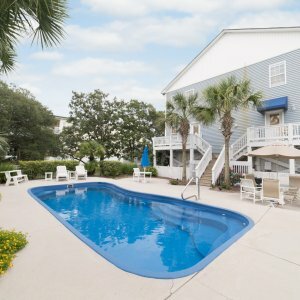 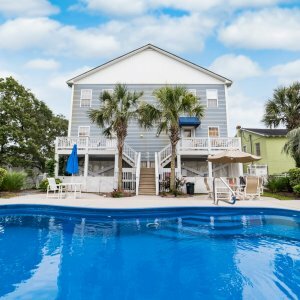 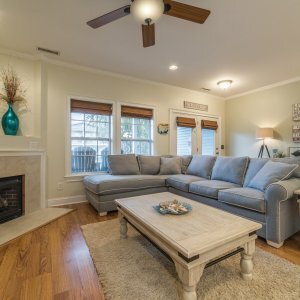 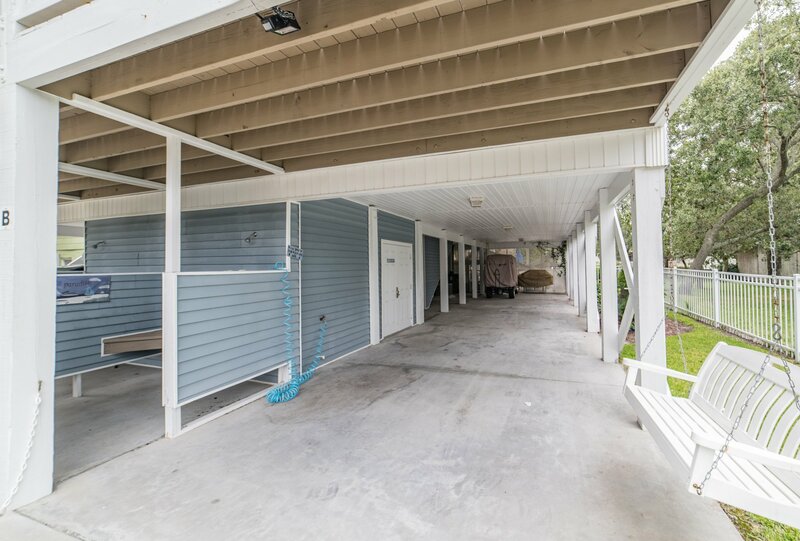 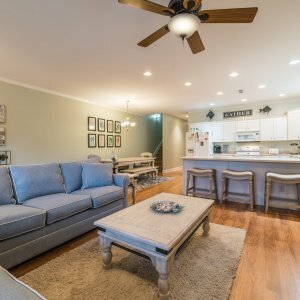 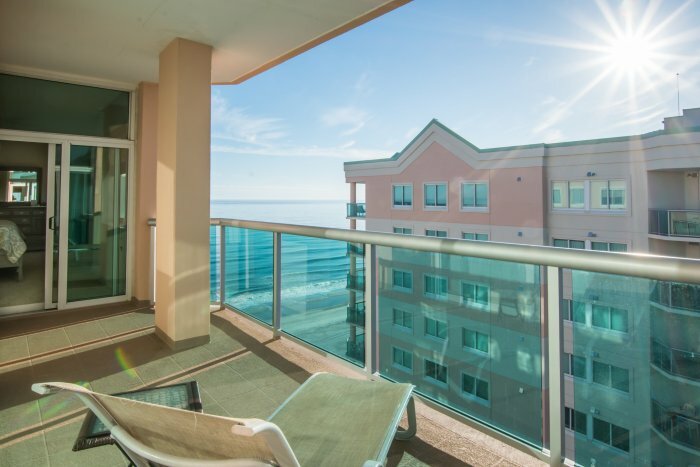 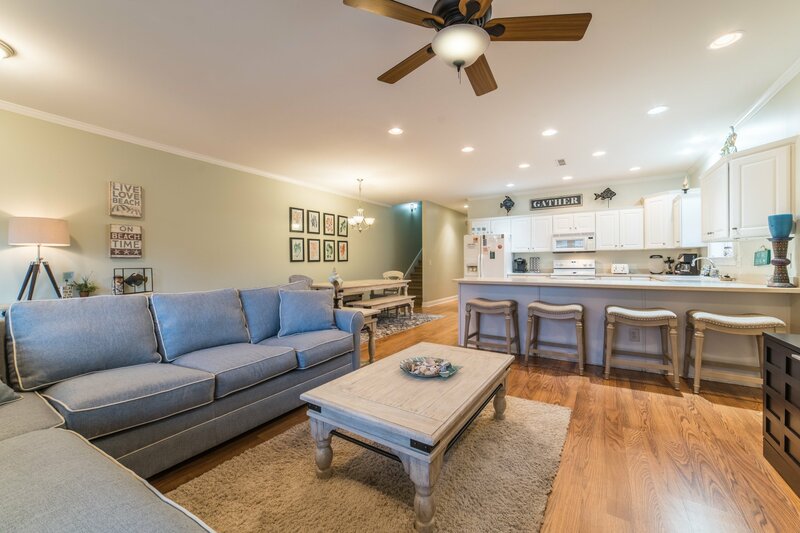 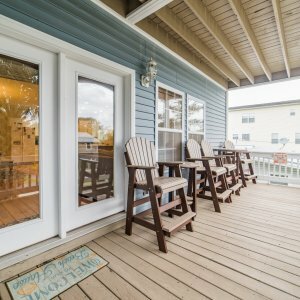 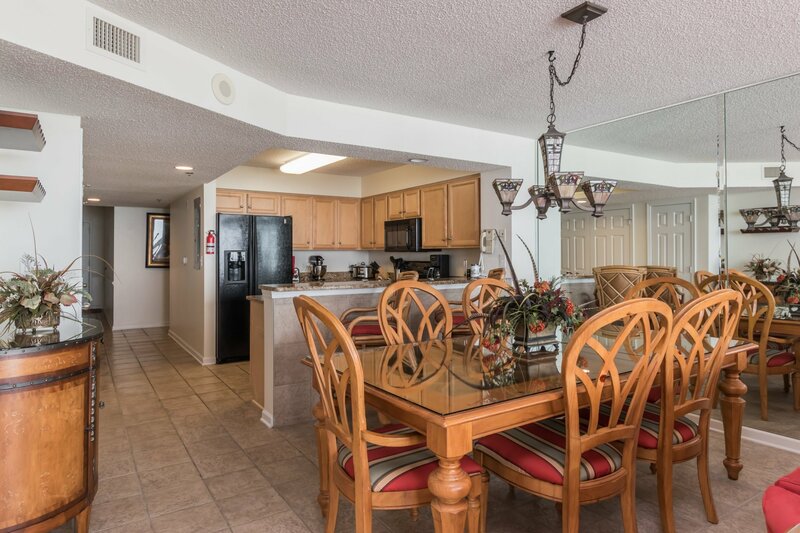 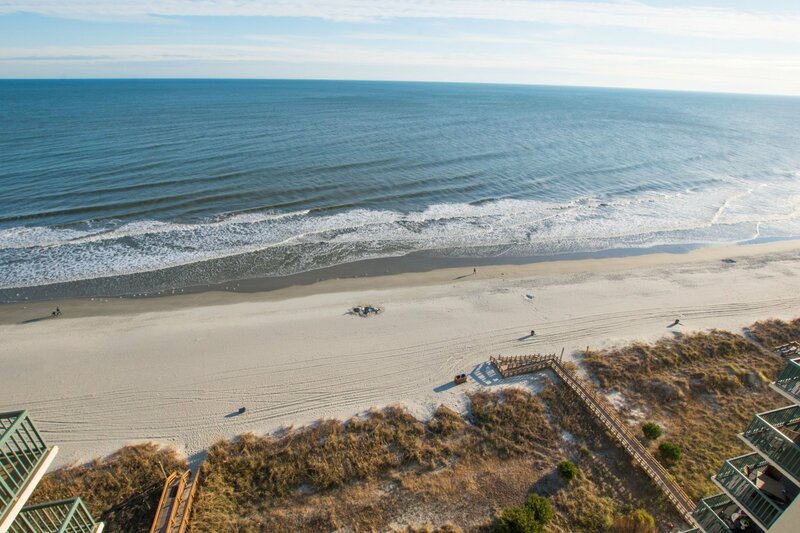 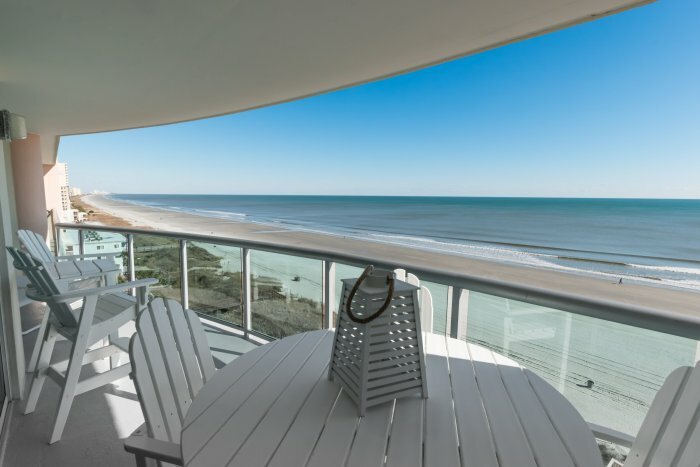 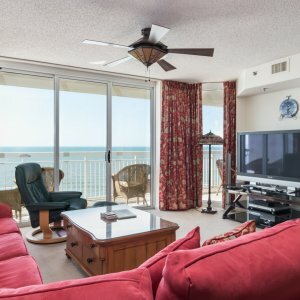 A corner unit, this condo has ocean views from all 6 windows, plus a 270 degree balcony view, spanning from Cherry Grove into Myrtle Beach. 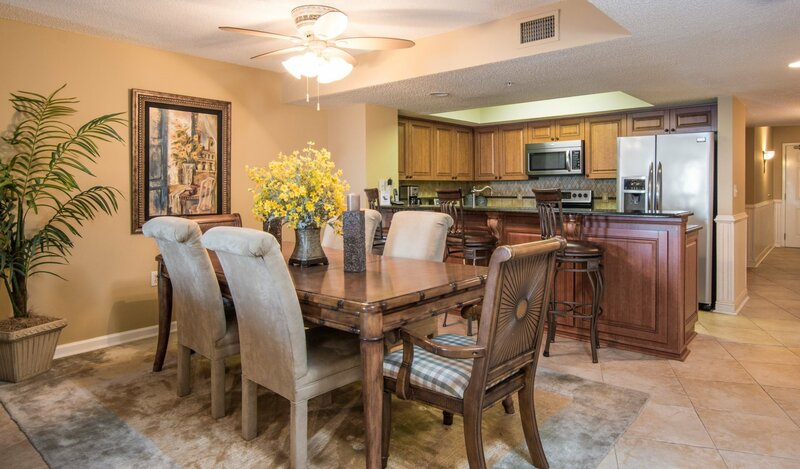 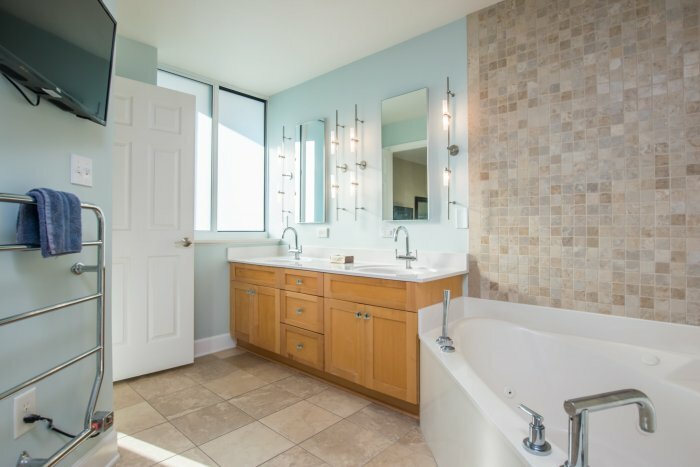 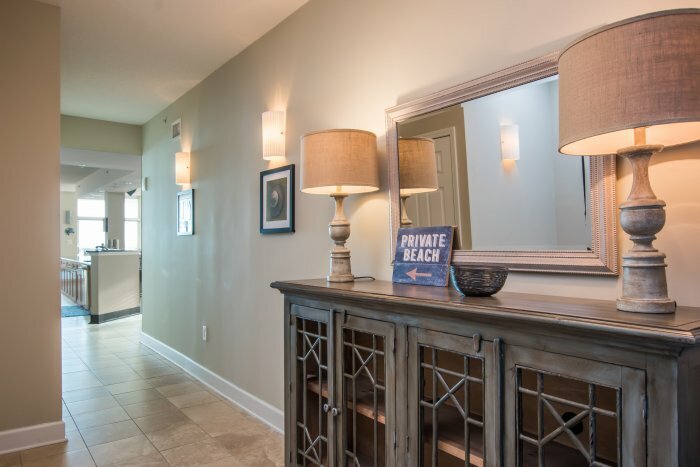 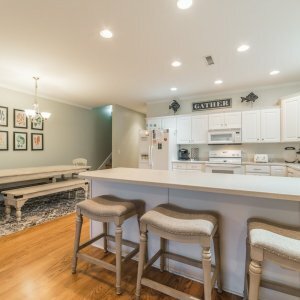 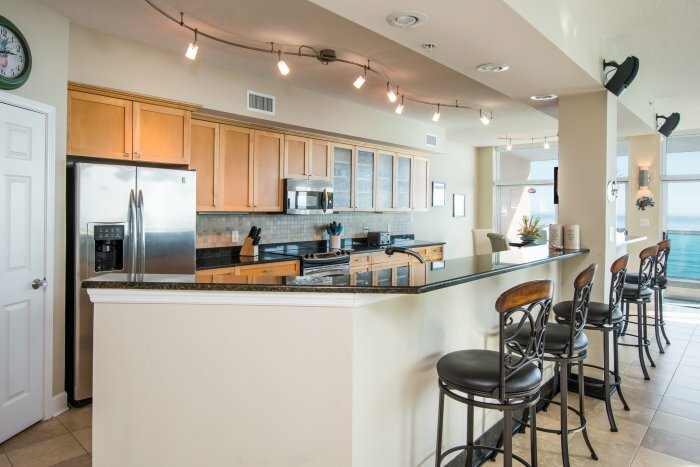 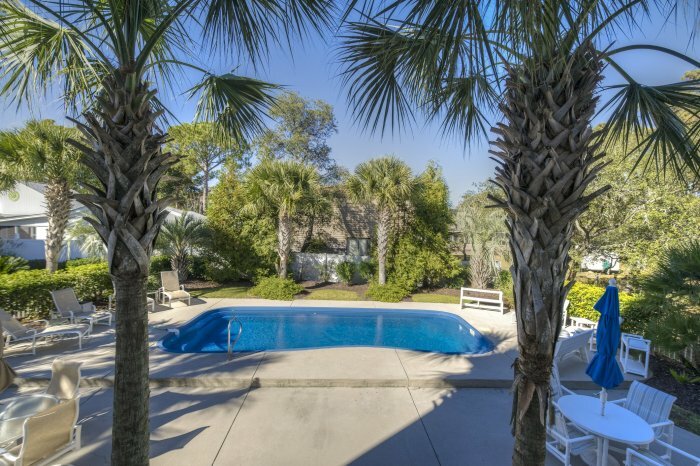 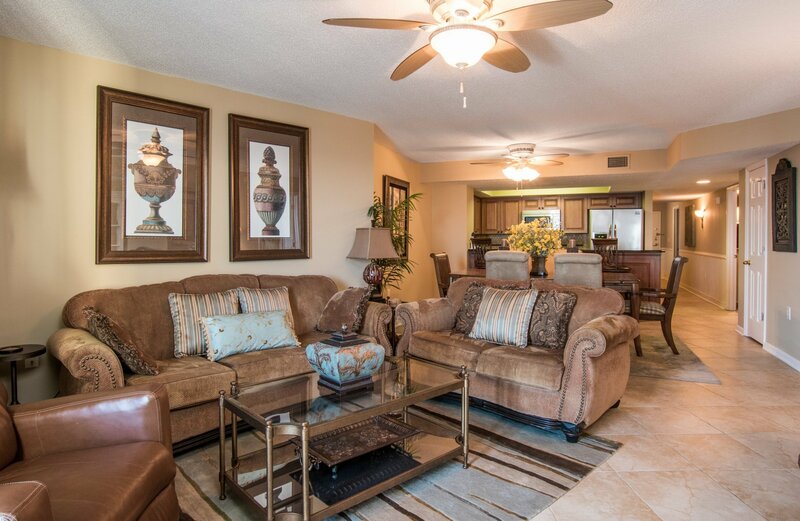 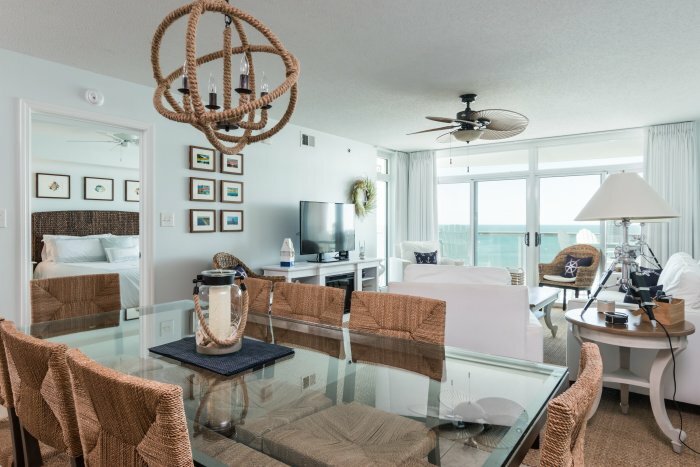 This recently updated Elite condo will make you never want to leave! 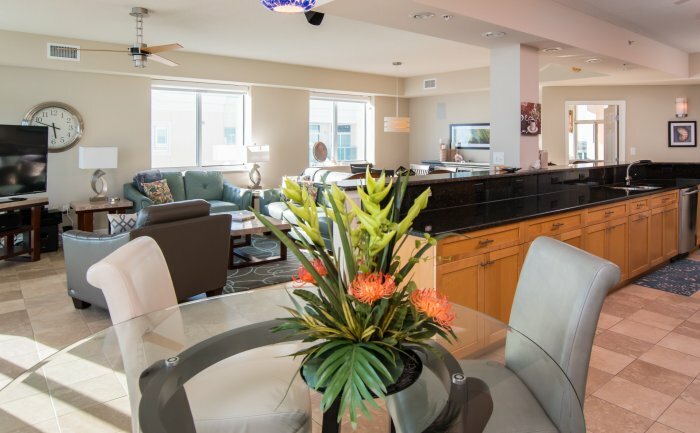 This condo features a modern design unlike any other property. 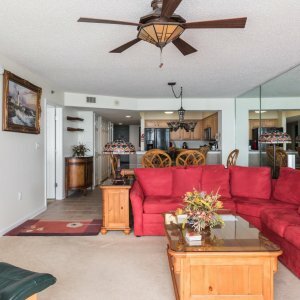 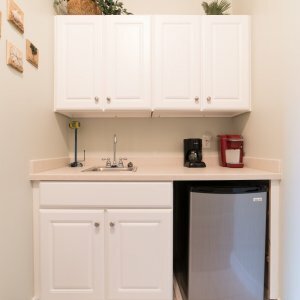 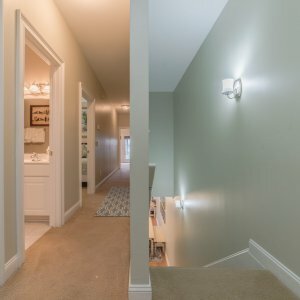 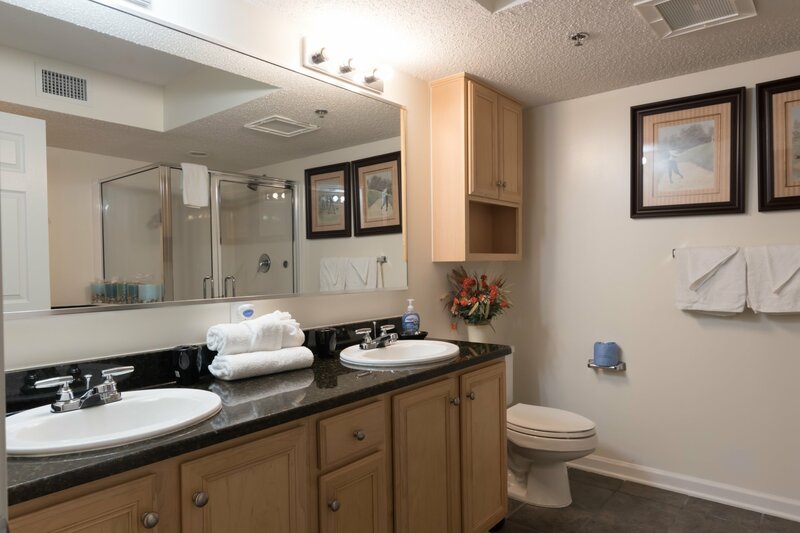 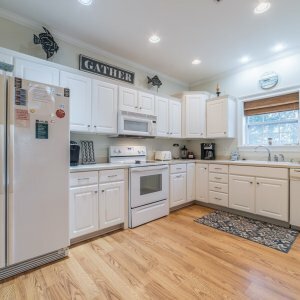 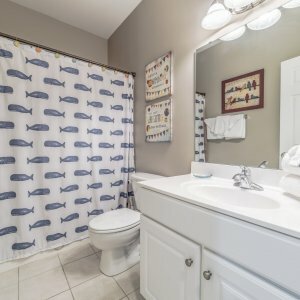 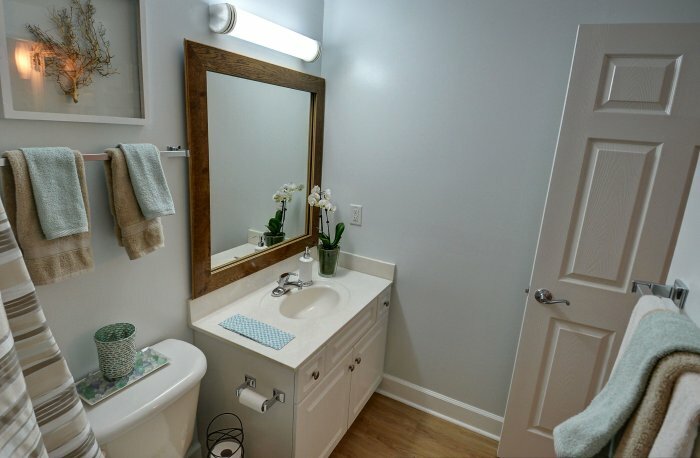 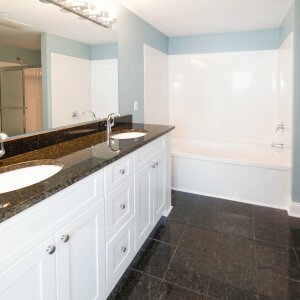 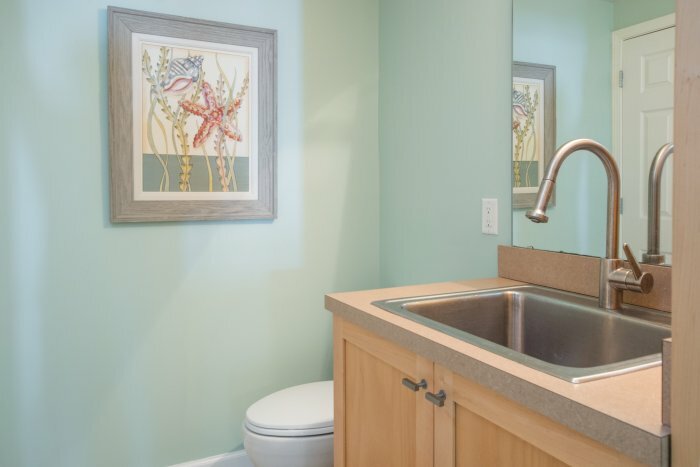 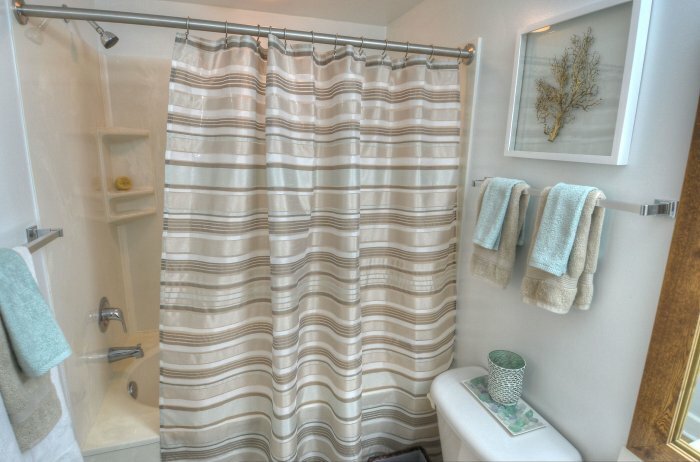 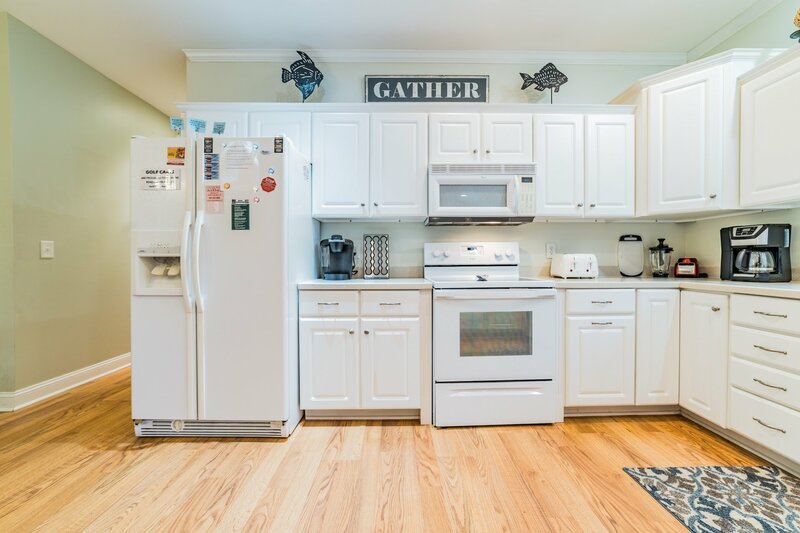 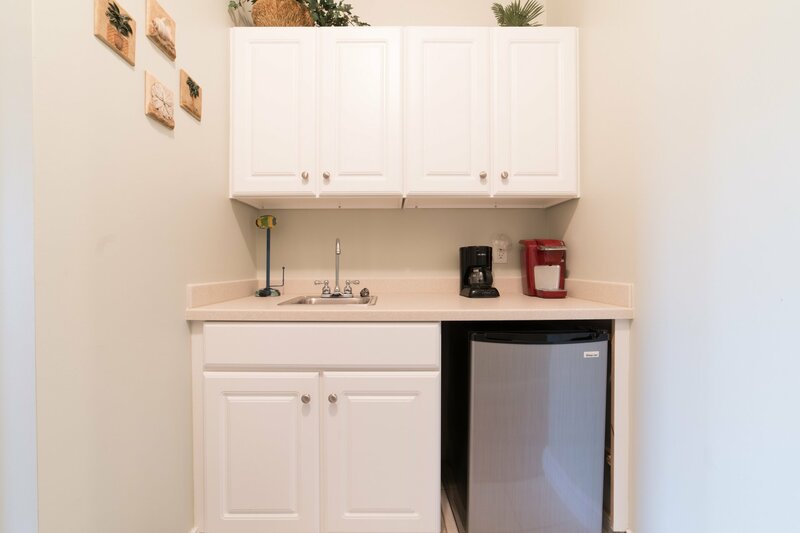 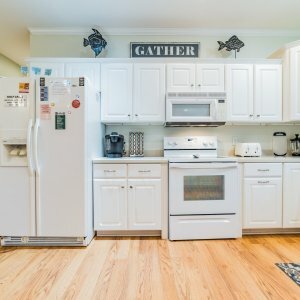 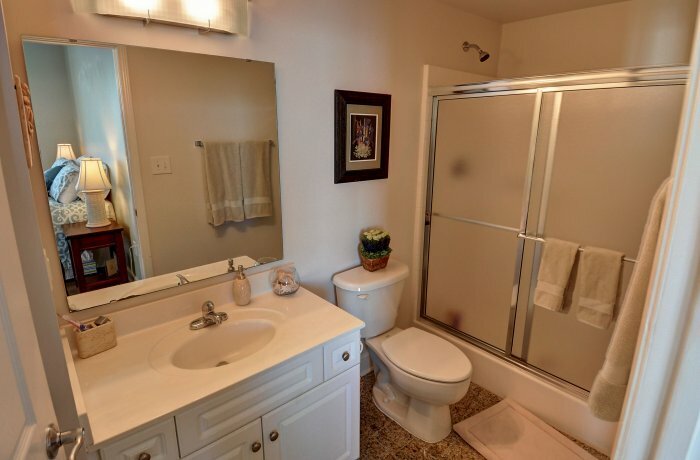 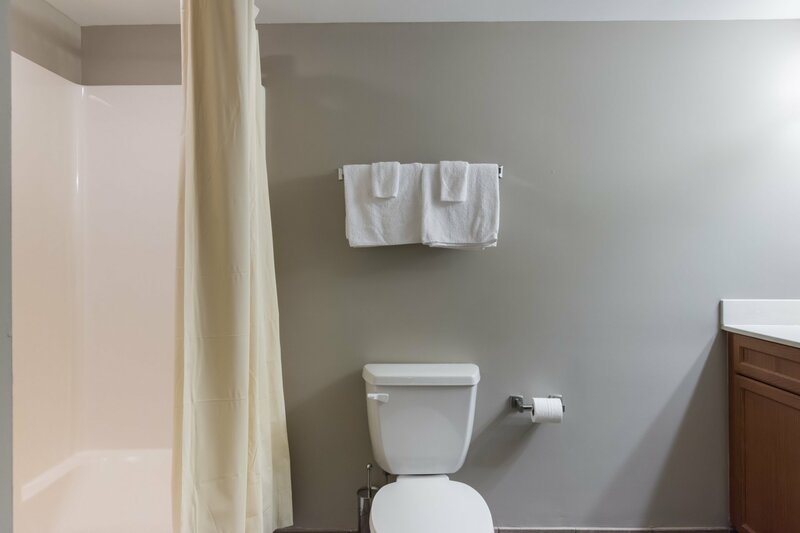 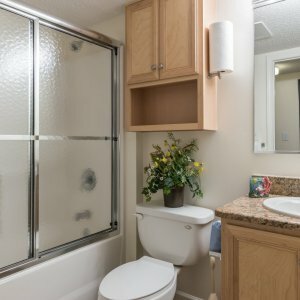 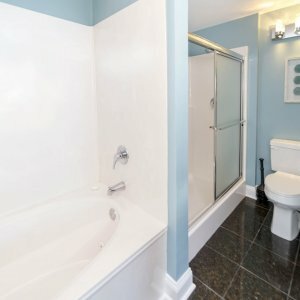 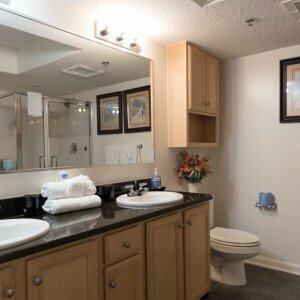 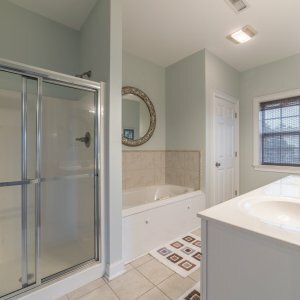 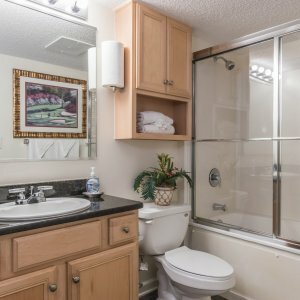 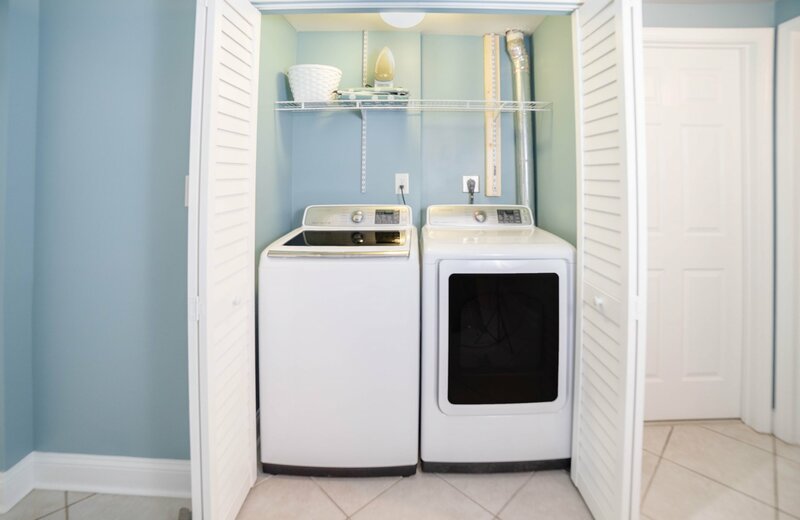 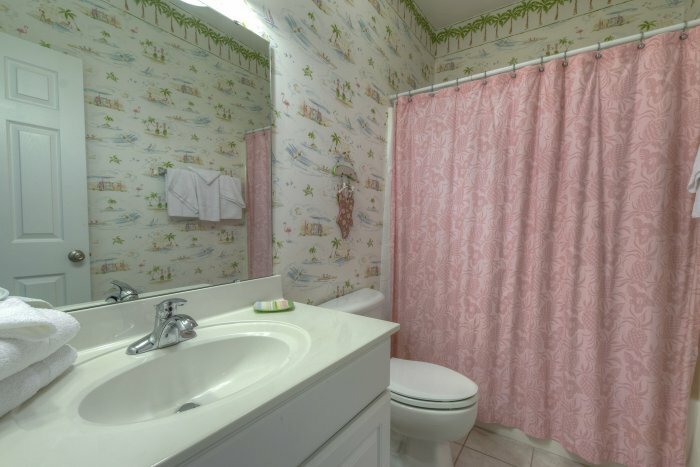 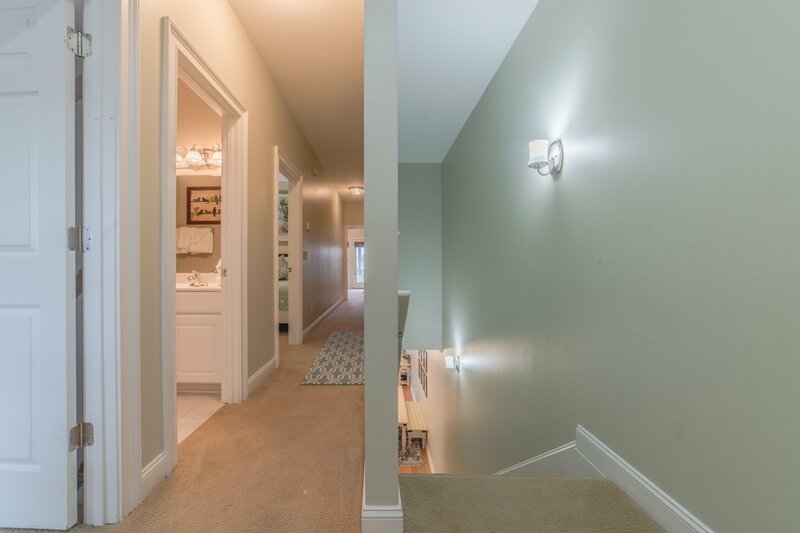 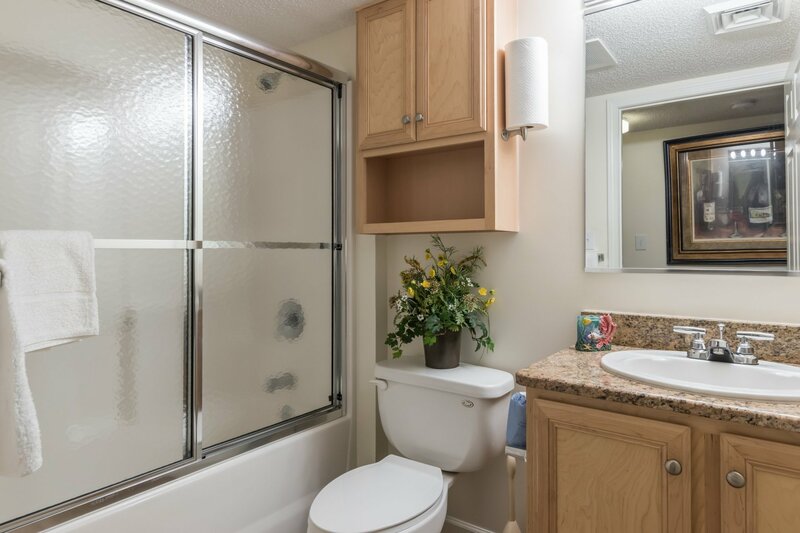 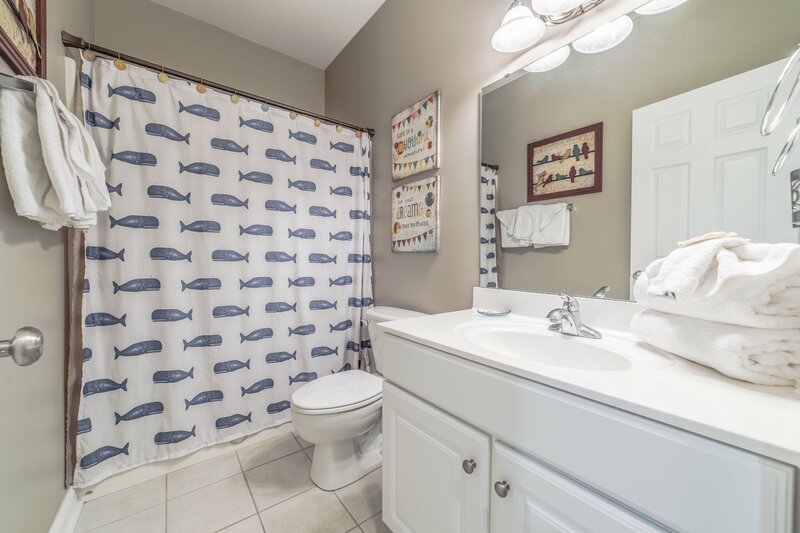 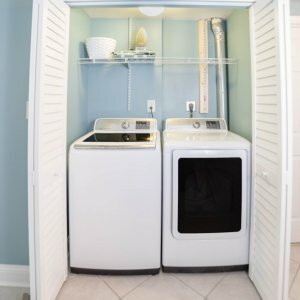 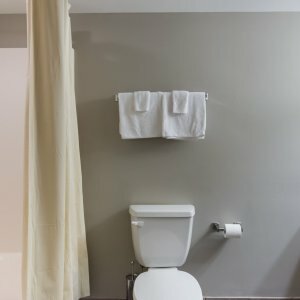 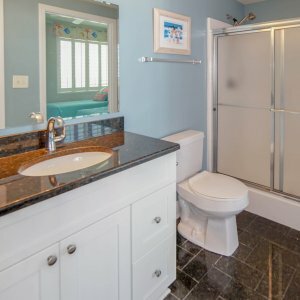 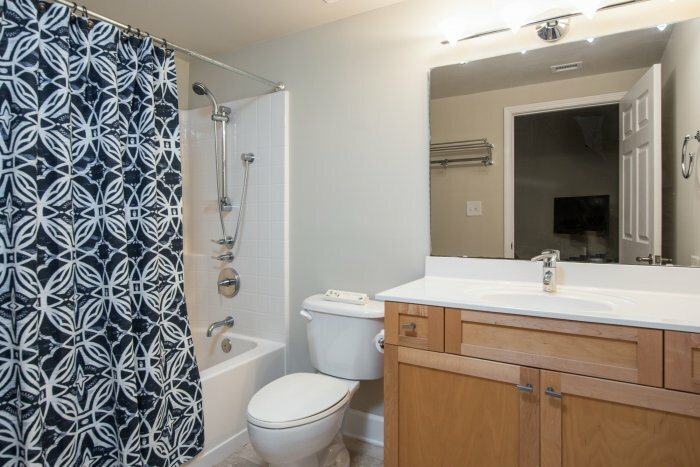 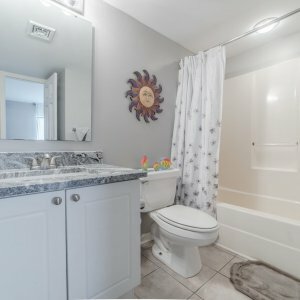 In this Condo, you will find everything new. 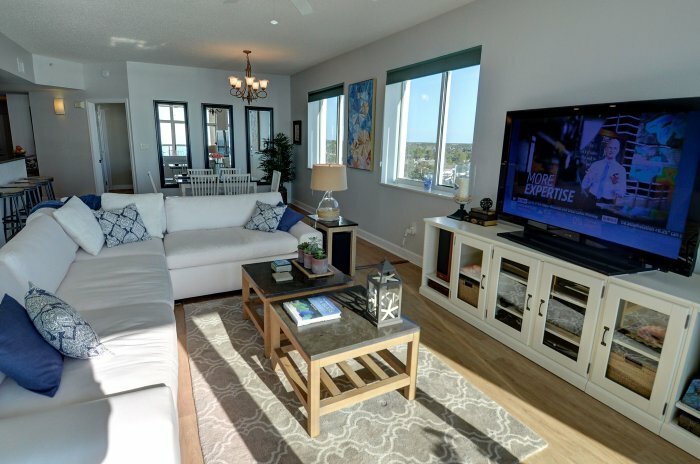 From all KitchenAid appliances, beautiful high end furnishings and smart televisions in each room. 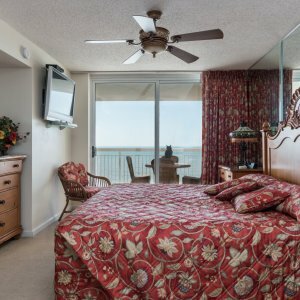 Exquisite bedding, seagrass carpeting and artwork detail this unique, upscale Elite. 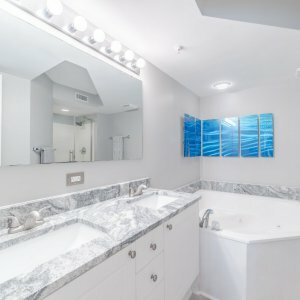 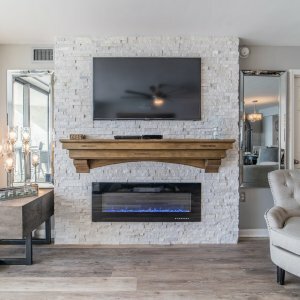 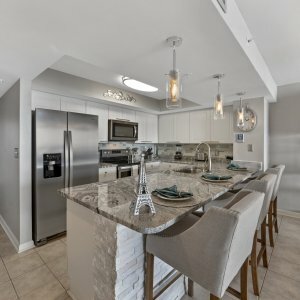 This exquisitely newly remodeled modern Condo offers 5 star luxury with all the comforts one would expect with ultra premium accommodations. 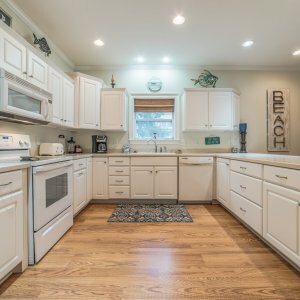 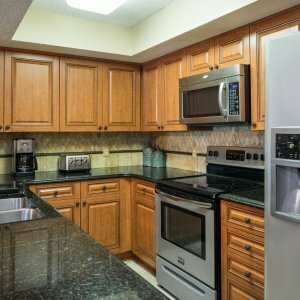 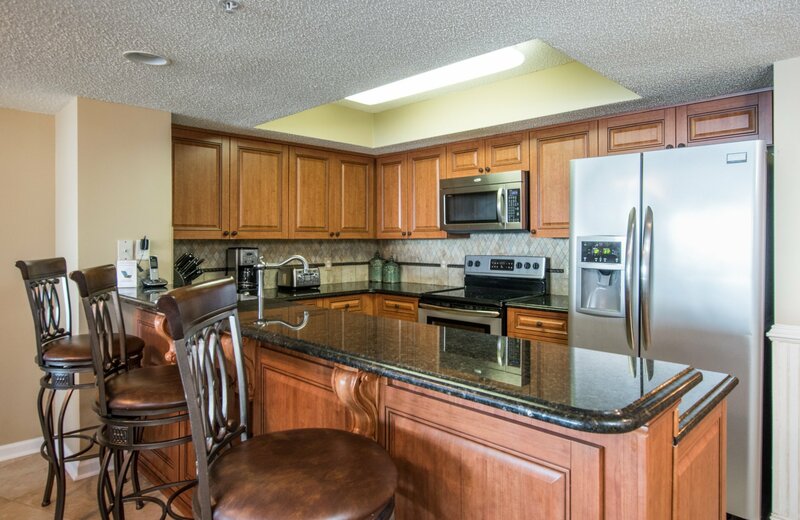 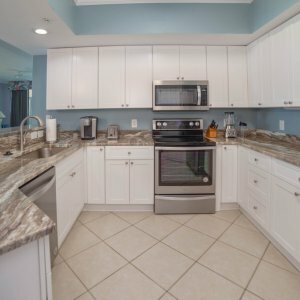 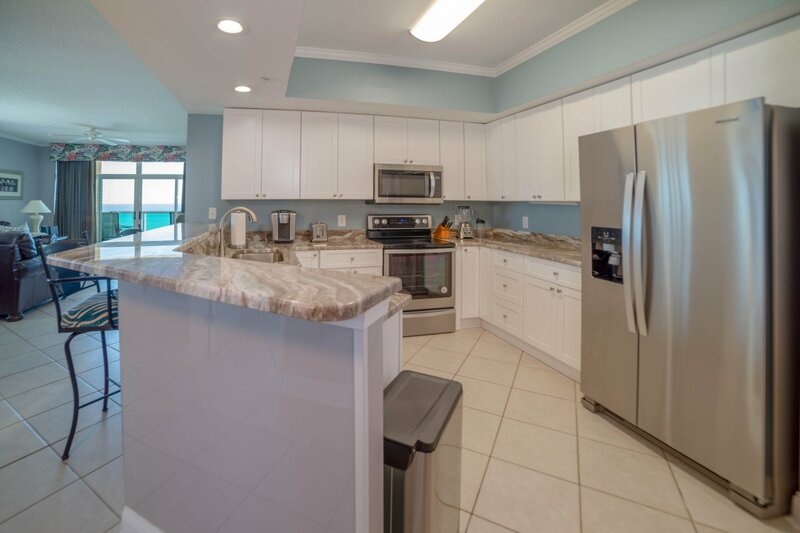 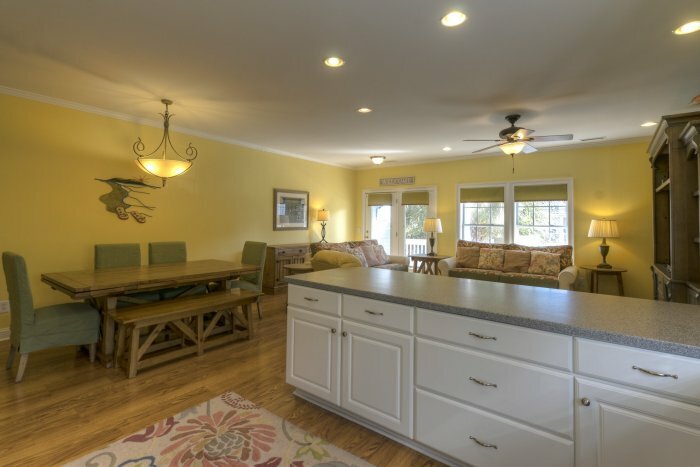 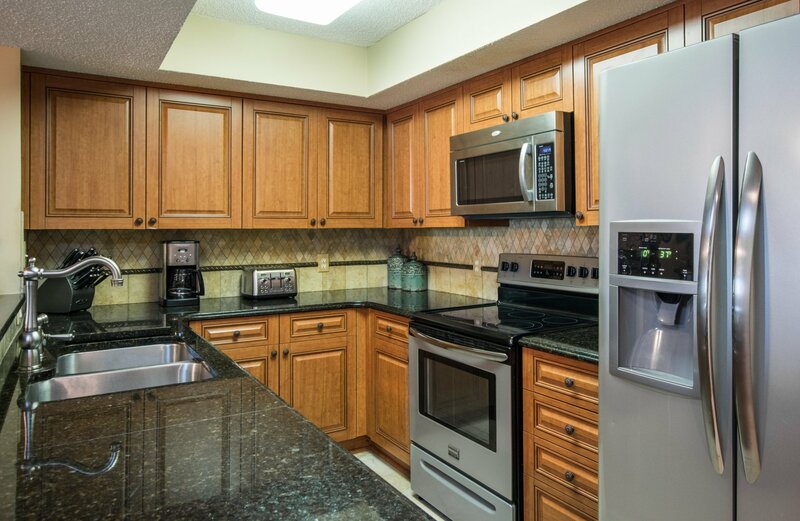 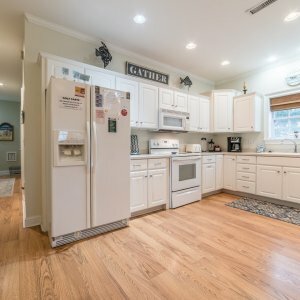 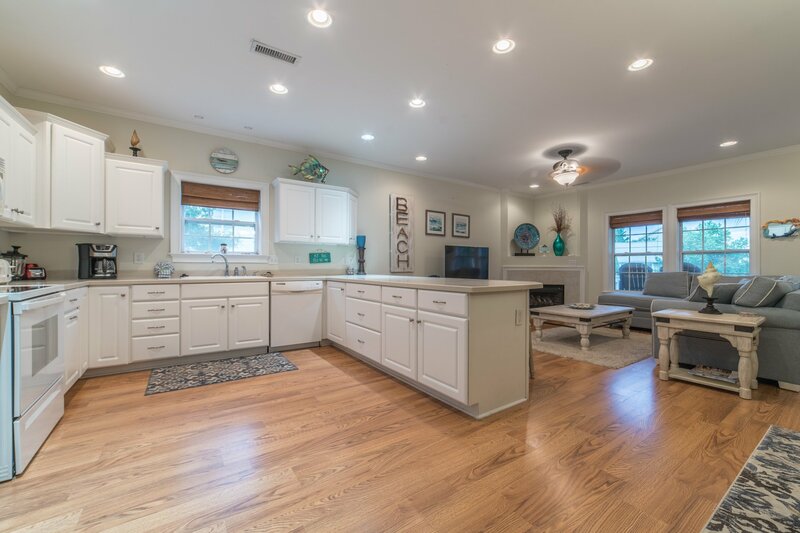 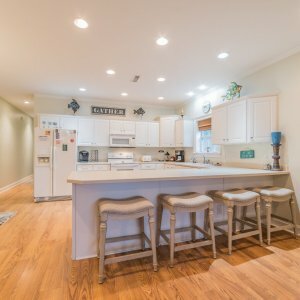 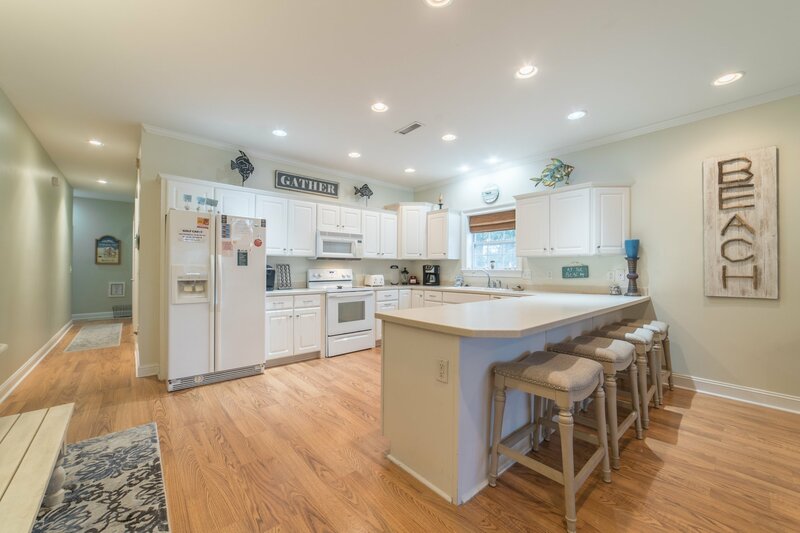 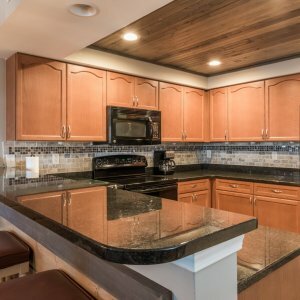 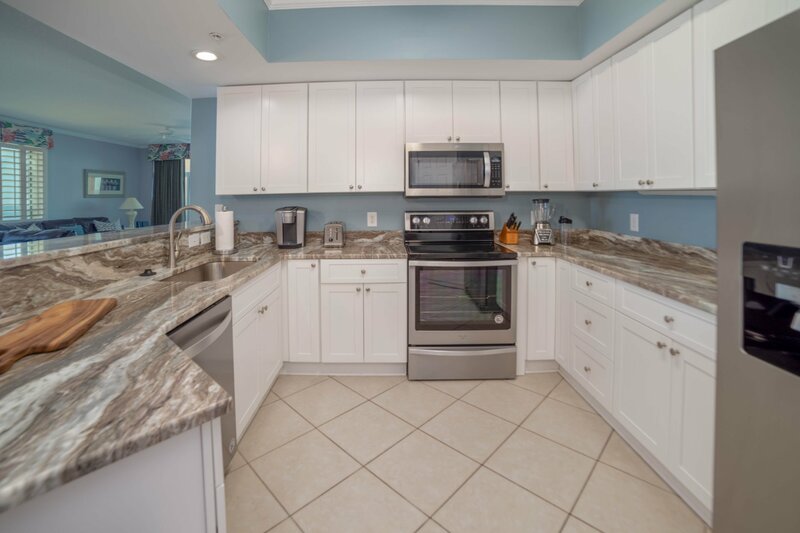 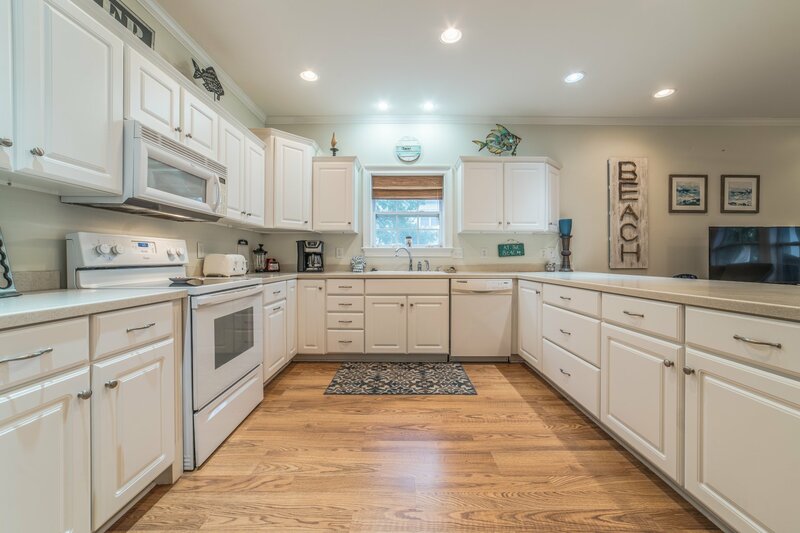 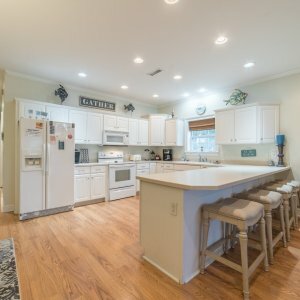 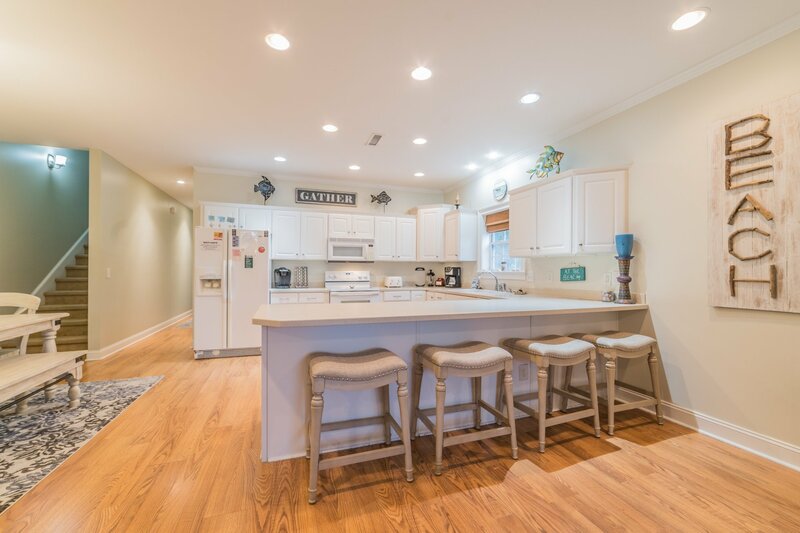 Beautiful island kitchen is adorned with gorgeous granite countertops and stainless steel appliances. 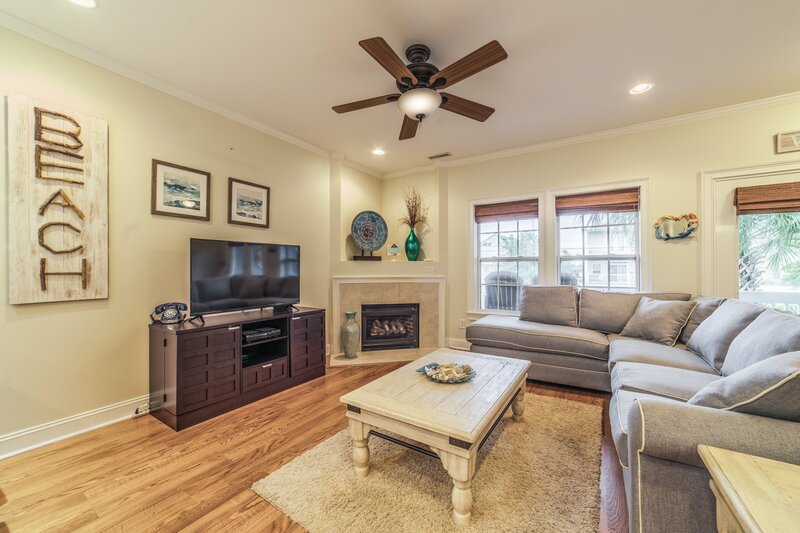 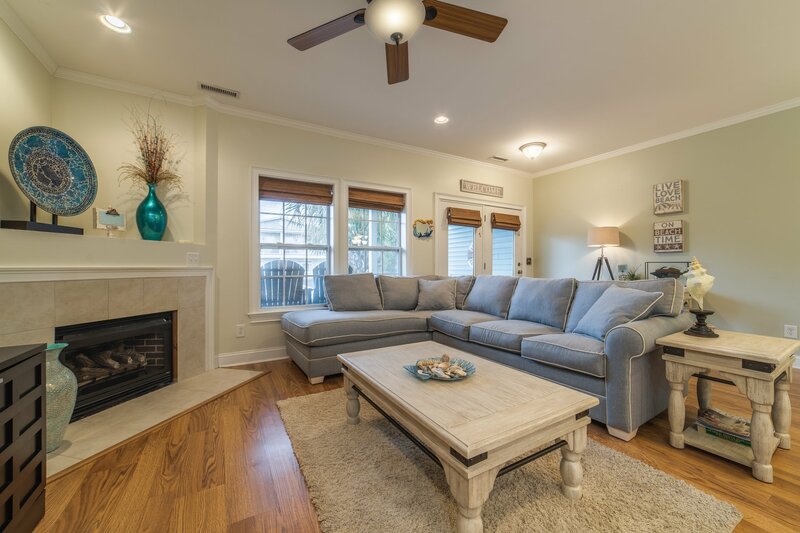 The open floor plan offers 3BR & 3BA with elegant newly acquired furnishings and a charming fireplace for a quaint and intimate getaway. 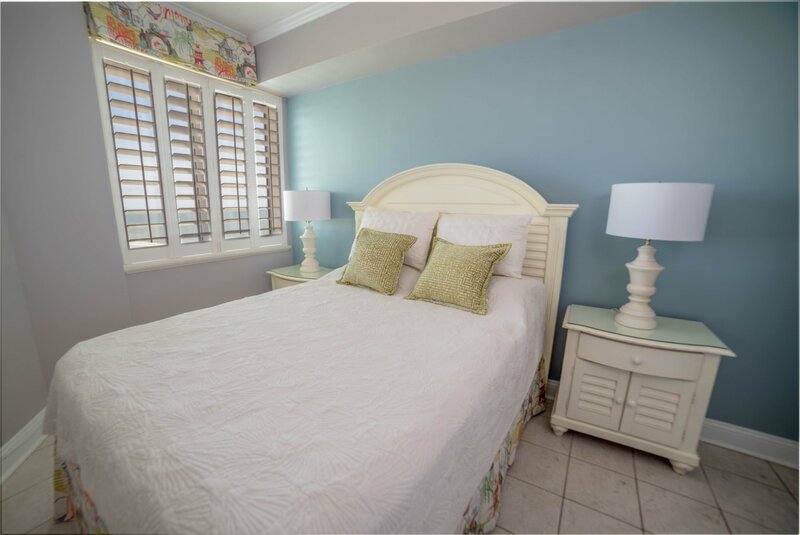 Add to this an oversized balcony with premium wicker furnishings and stunning sunrise, sunset and ocean front views that will completely entice the senses. 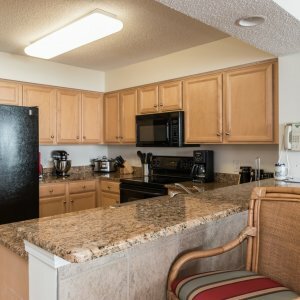 This unit will not disappoint, and you will want to return to it year after year. 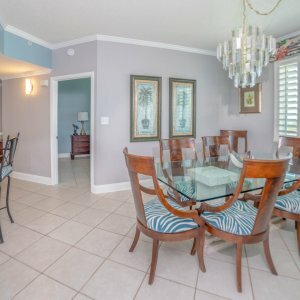 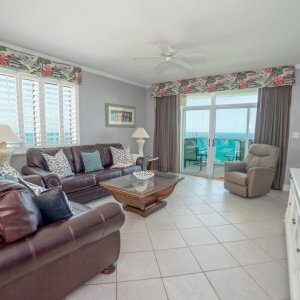 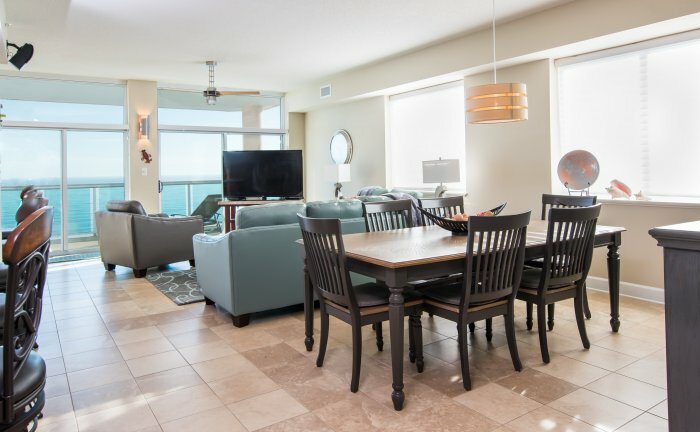 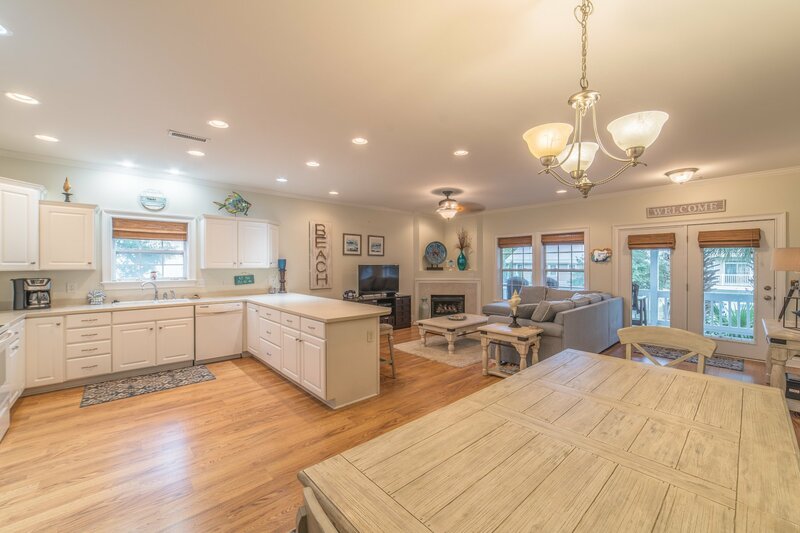 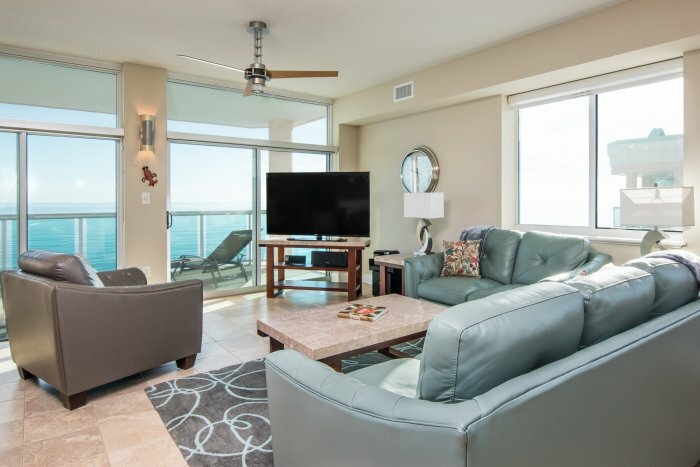 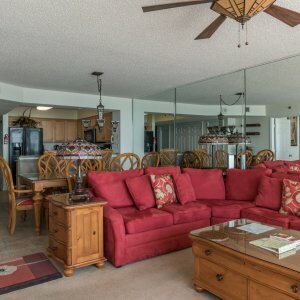 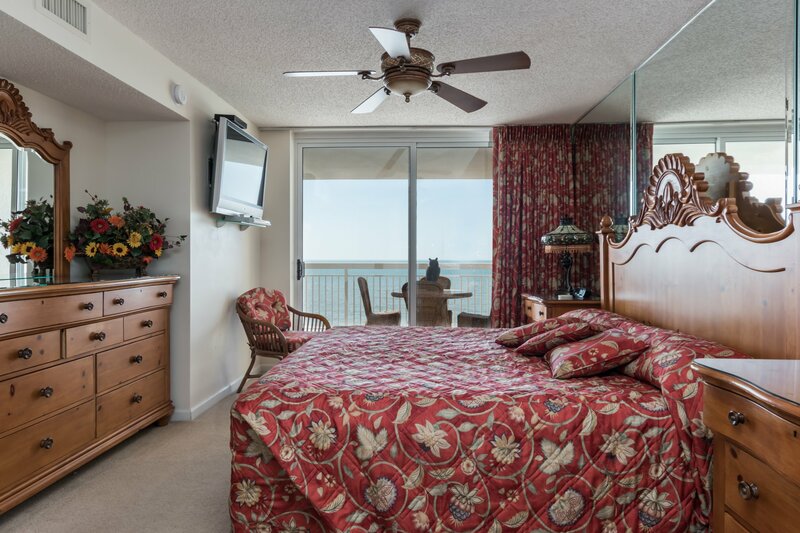 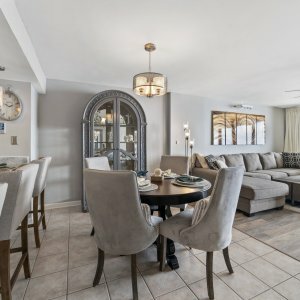 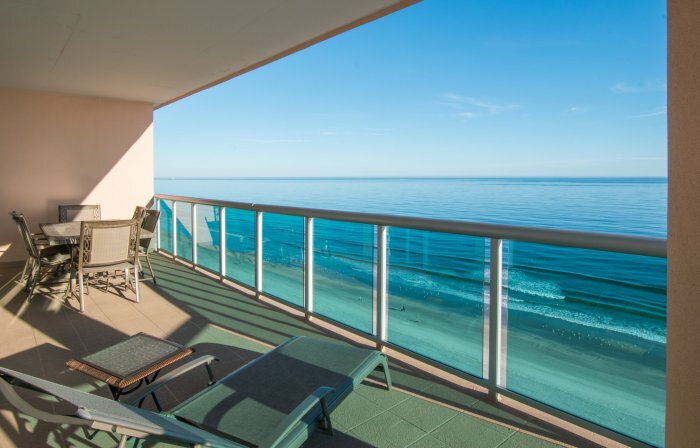 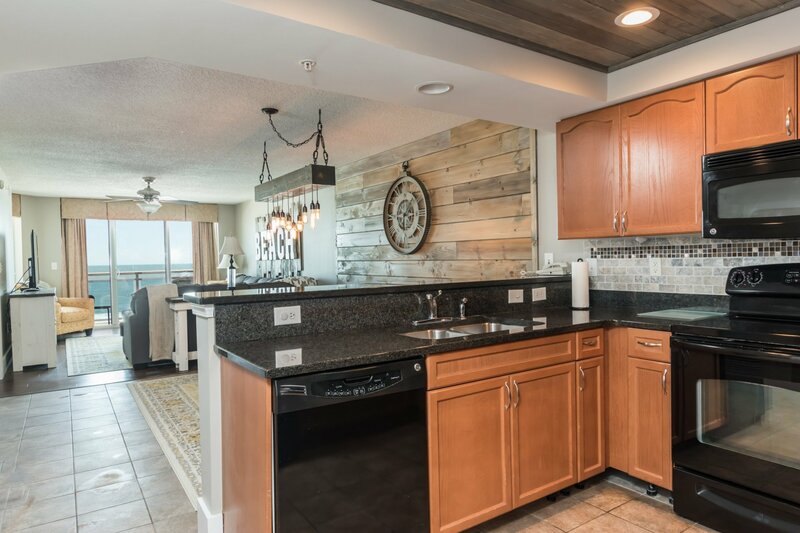 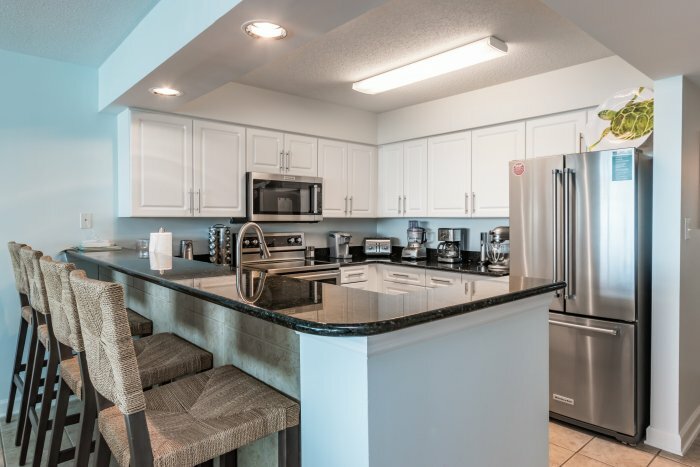 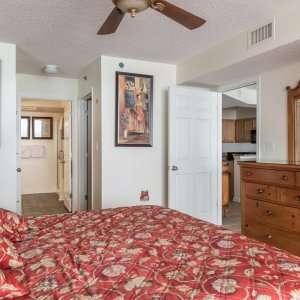 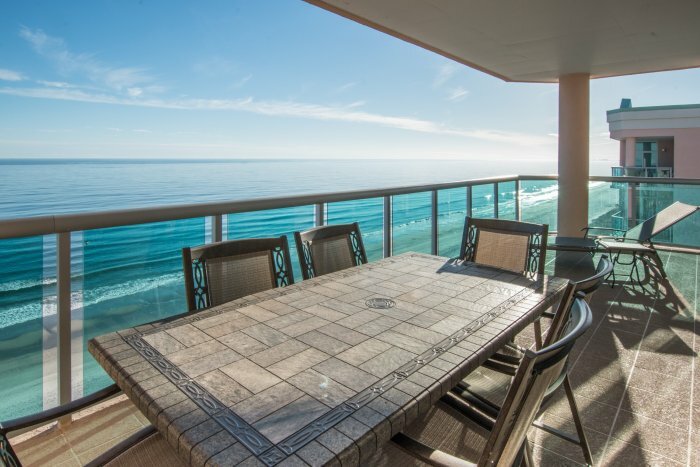 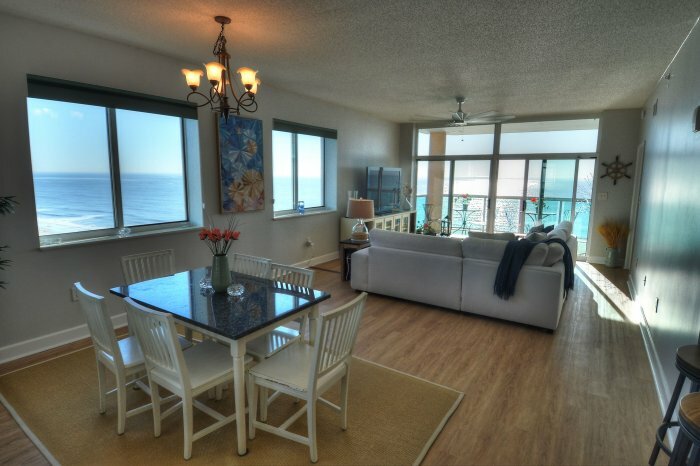 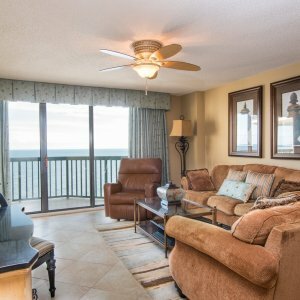 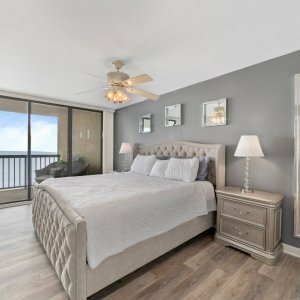 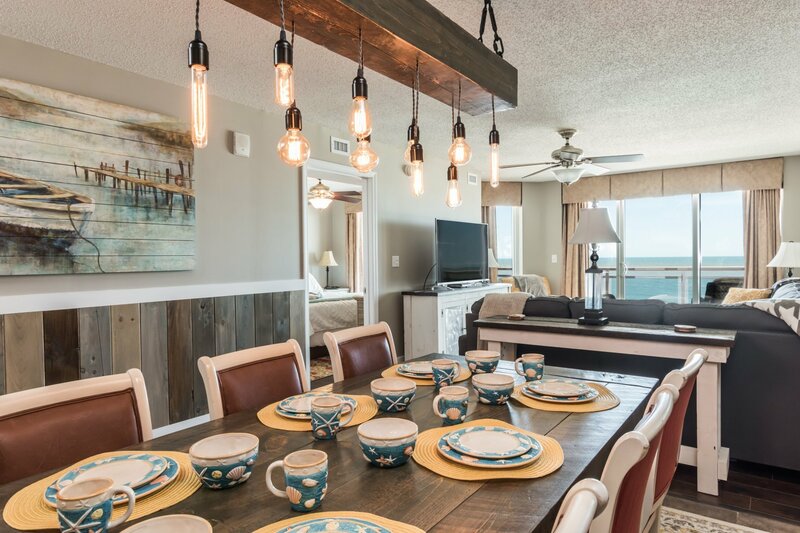 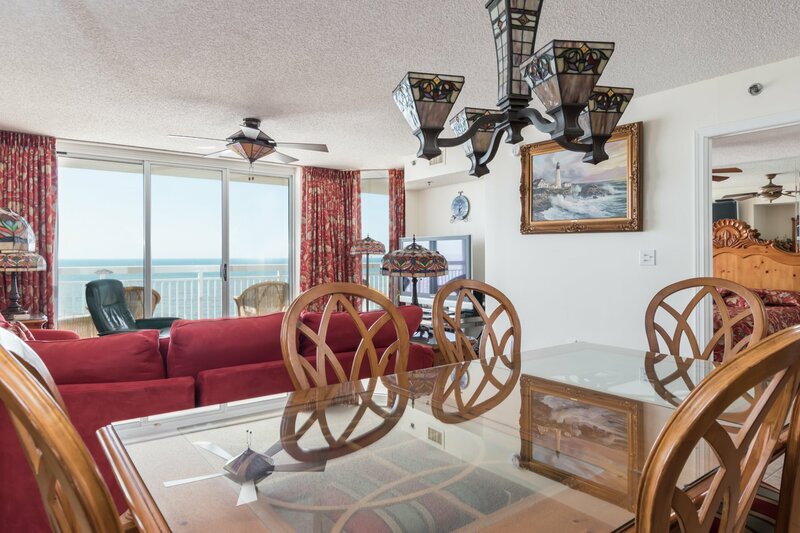 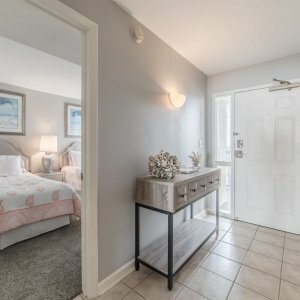 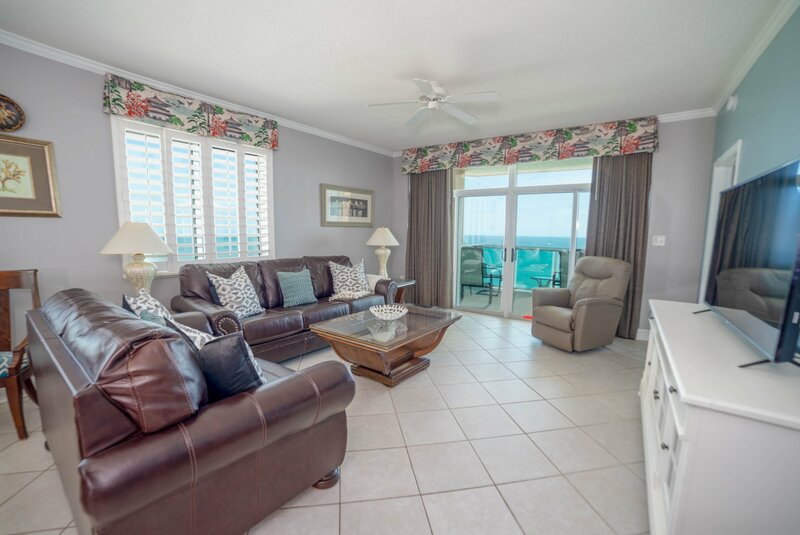 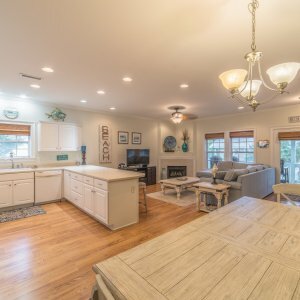 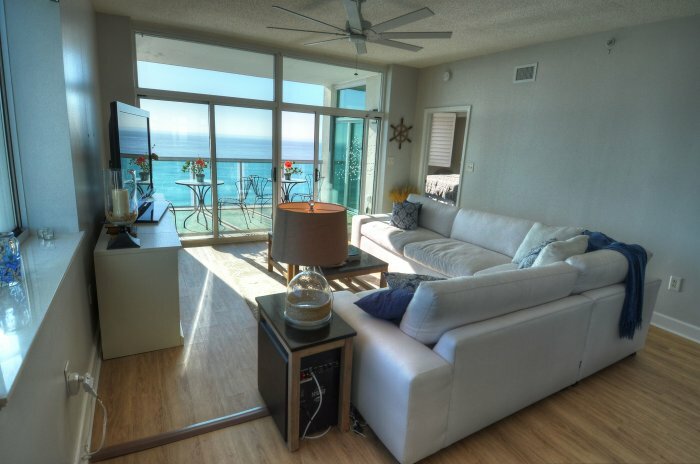 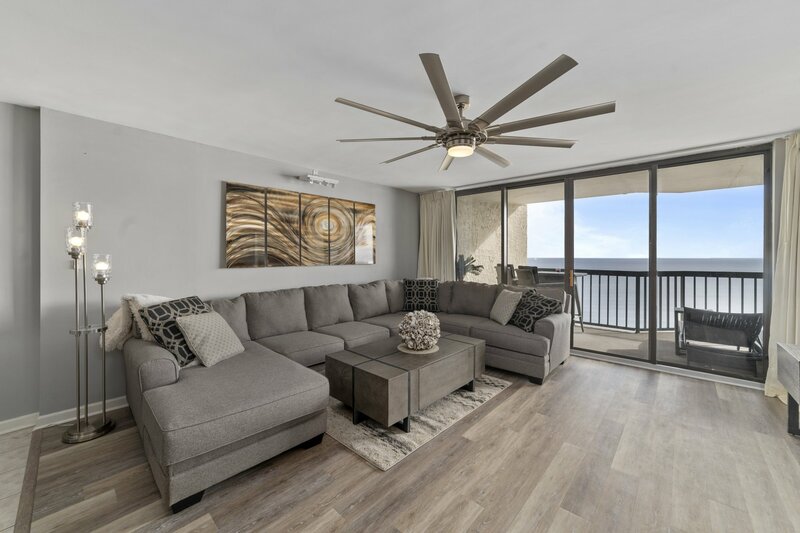 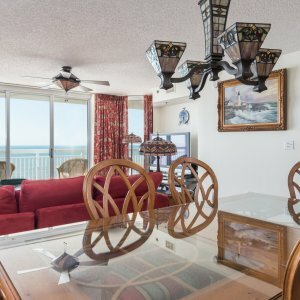 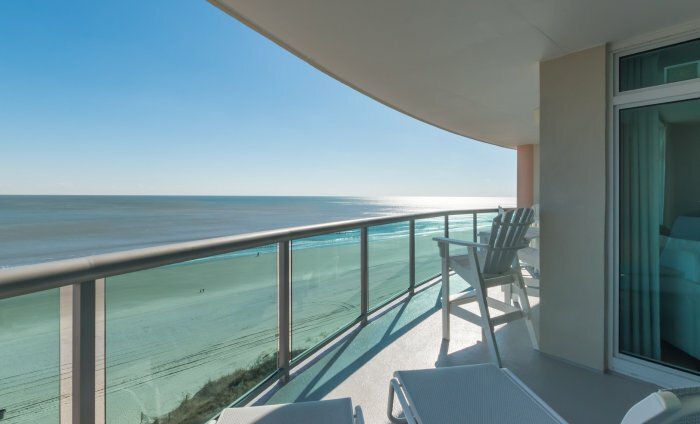 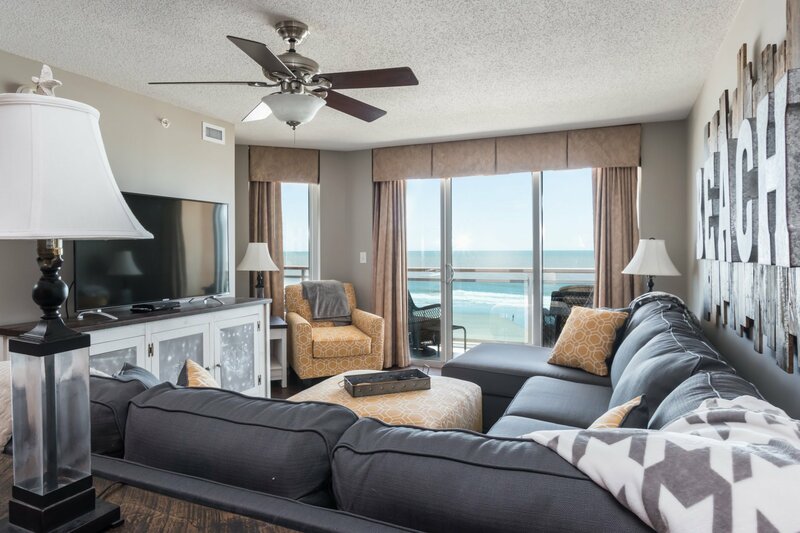 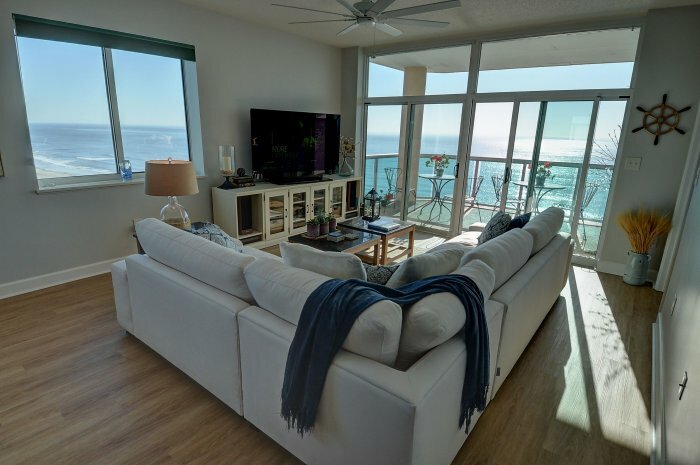 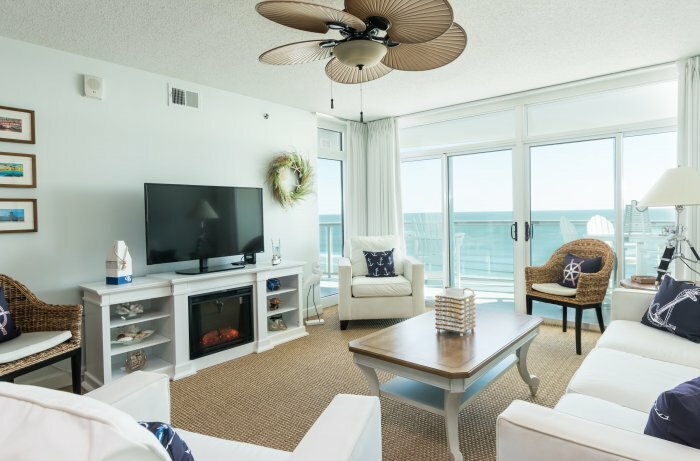 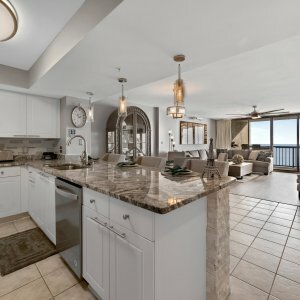 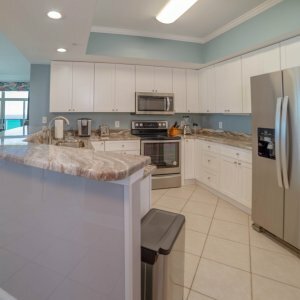 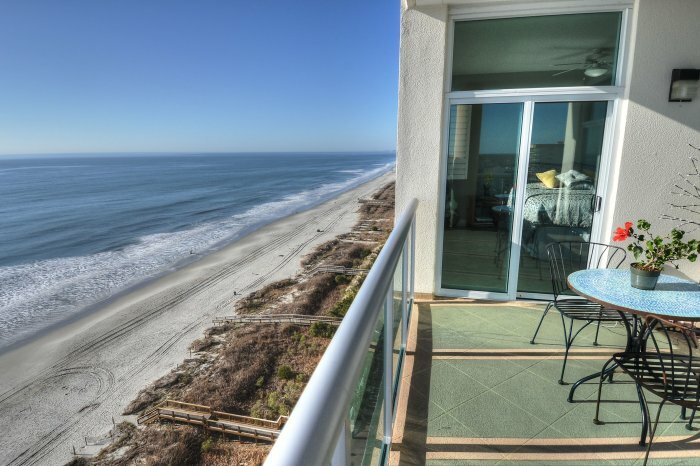 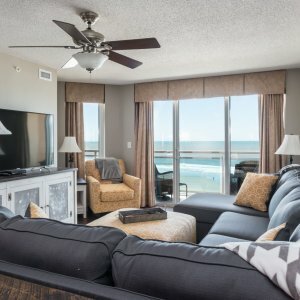 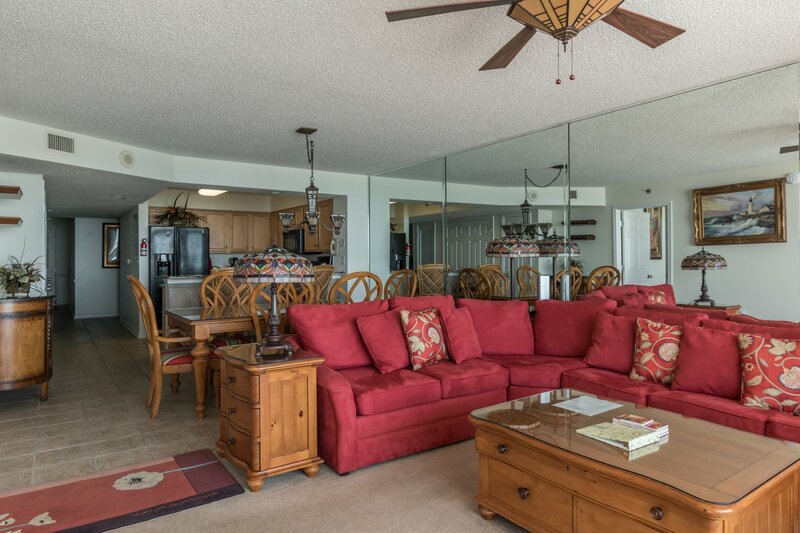 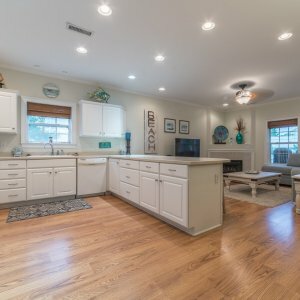 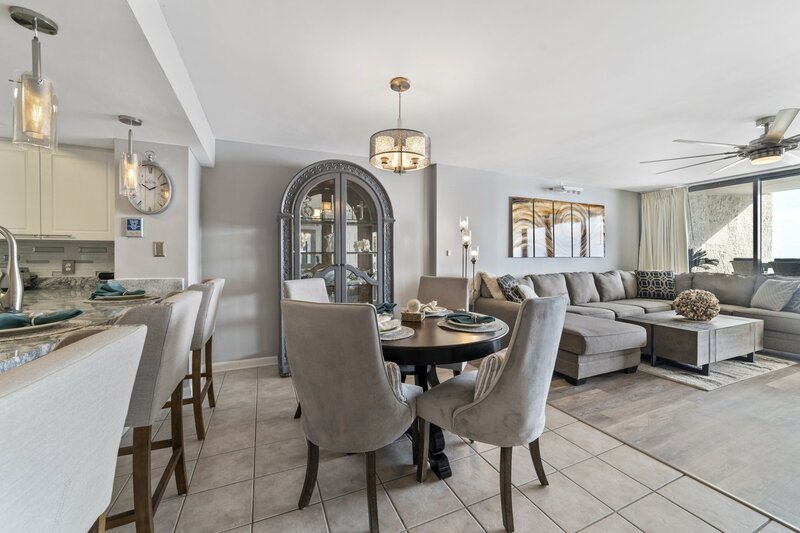 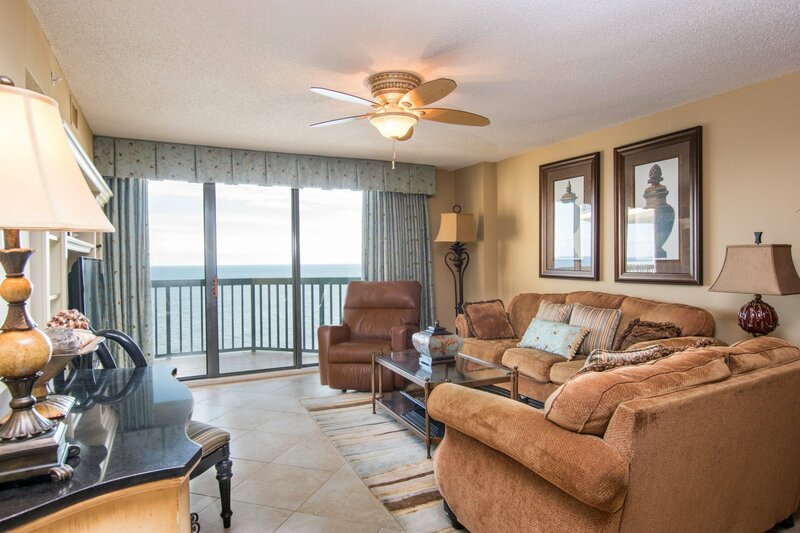 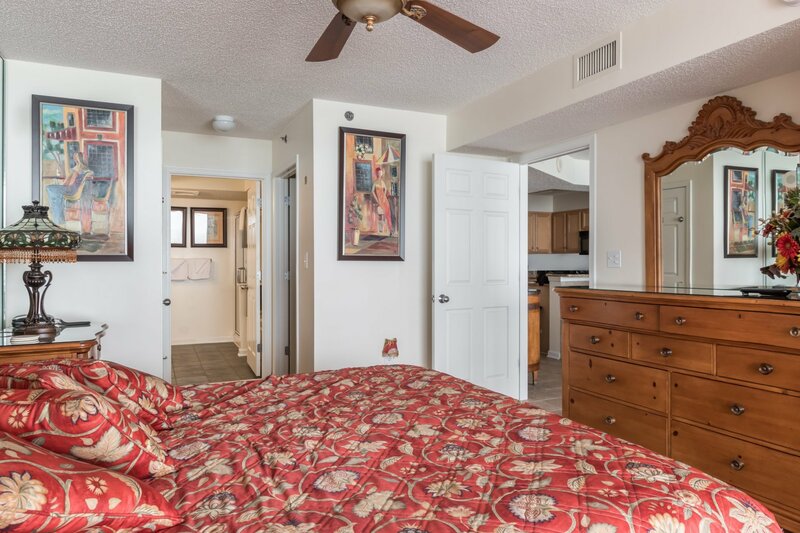 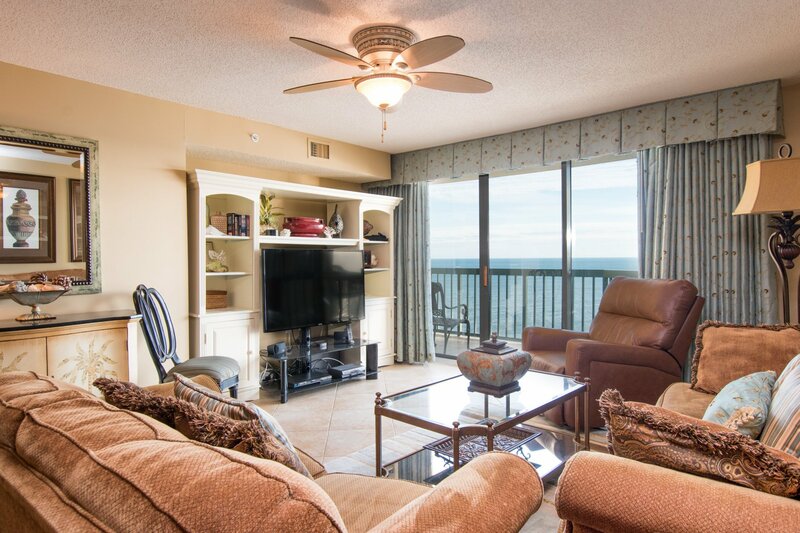 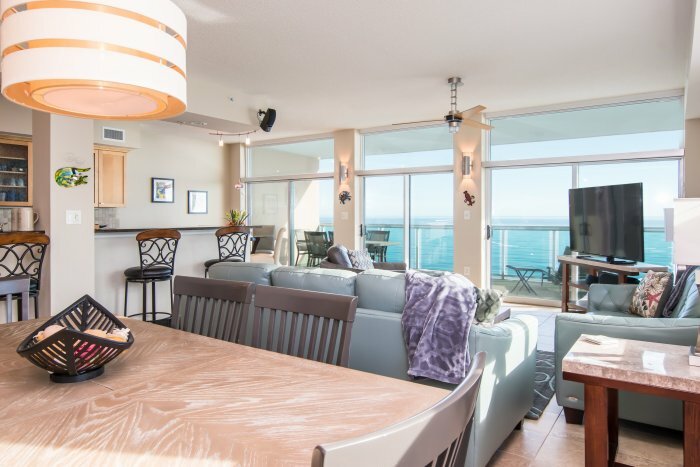 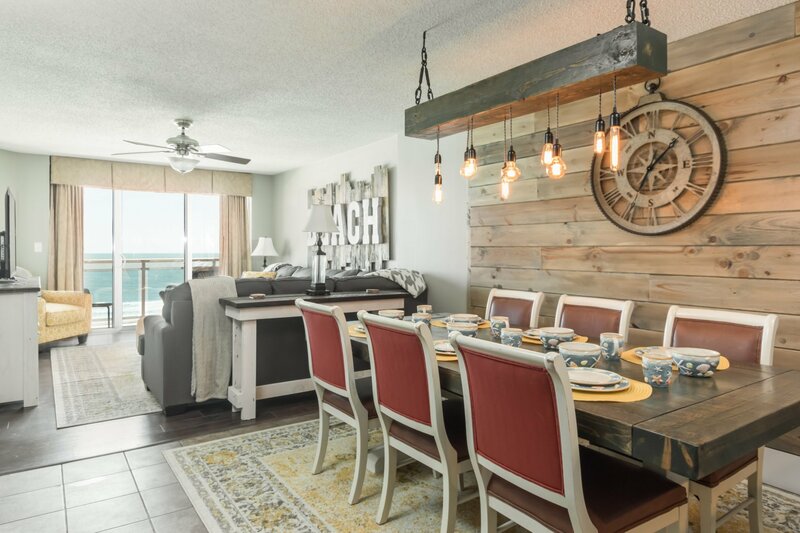 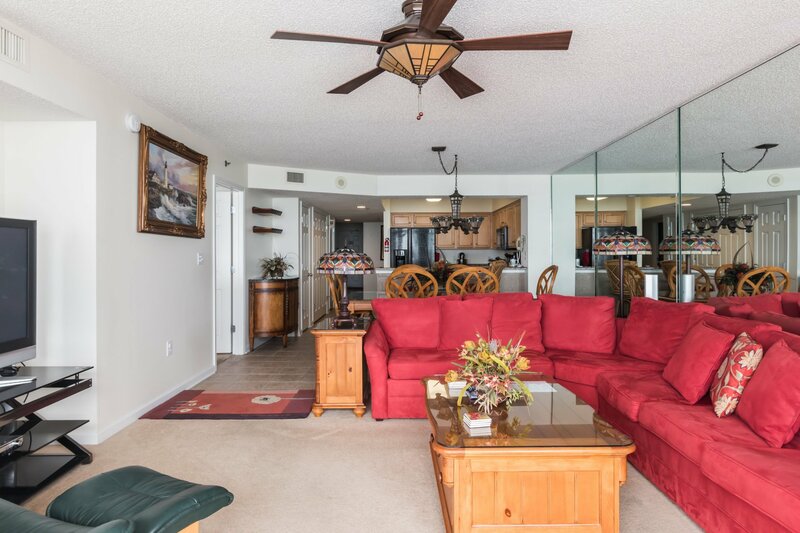 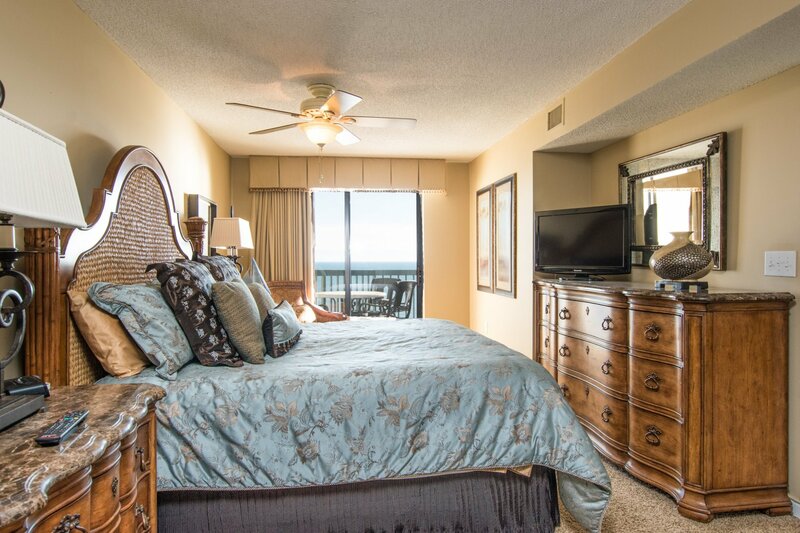 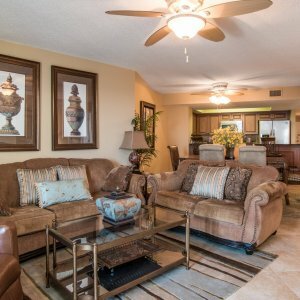 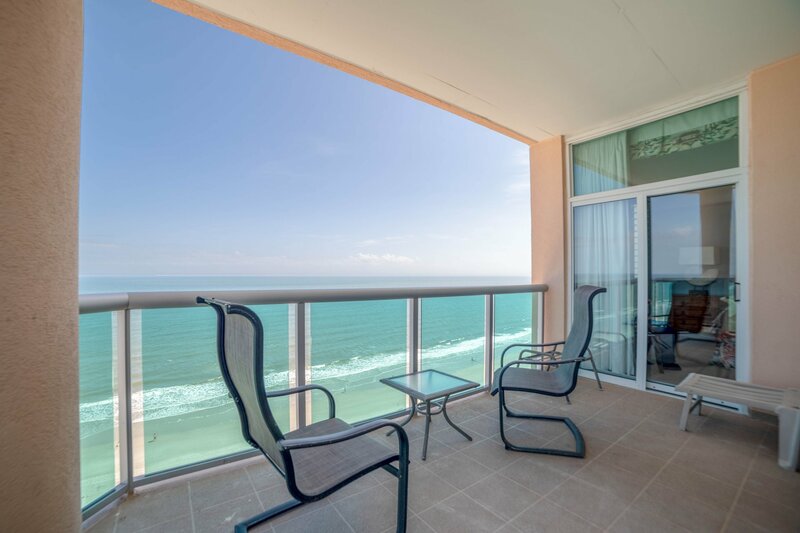 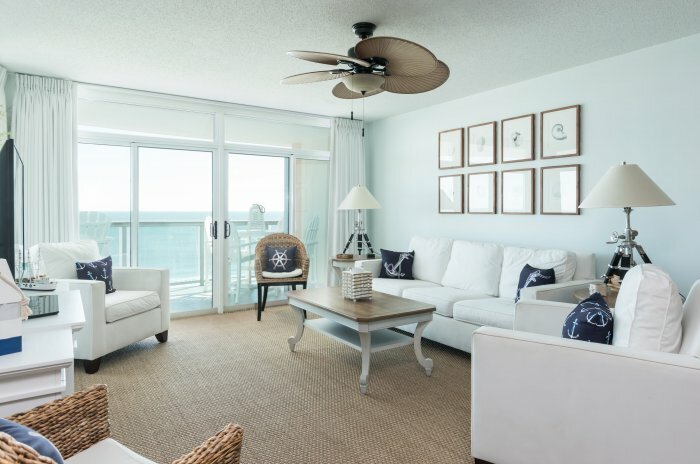 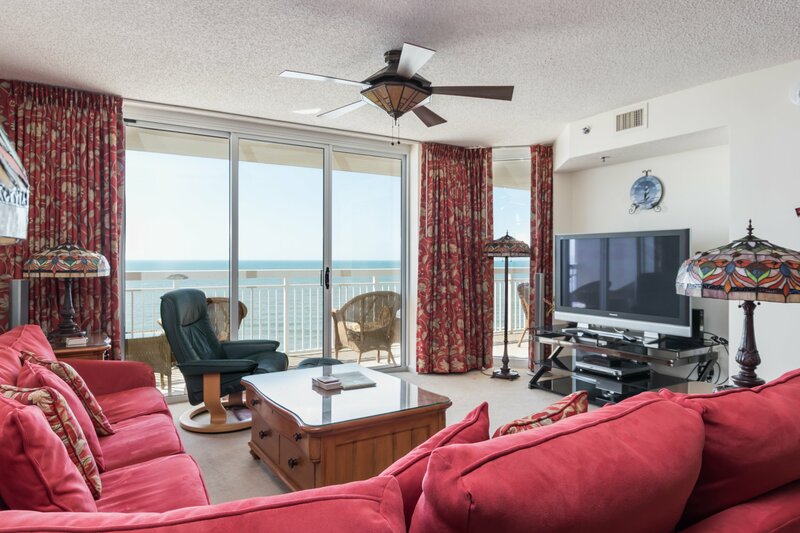 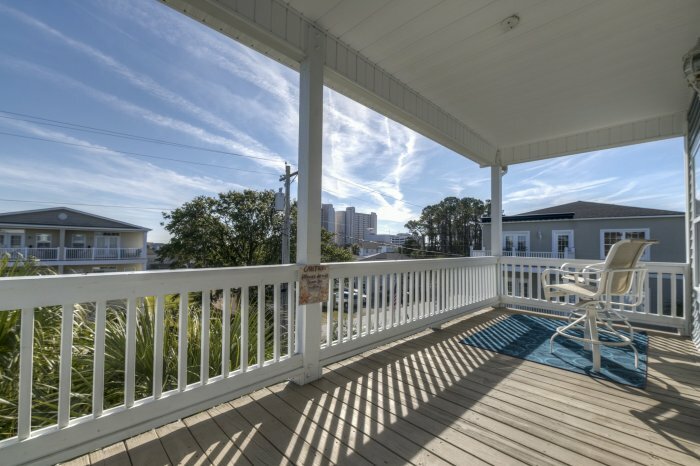 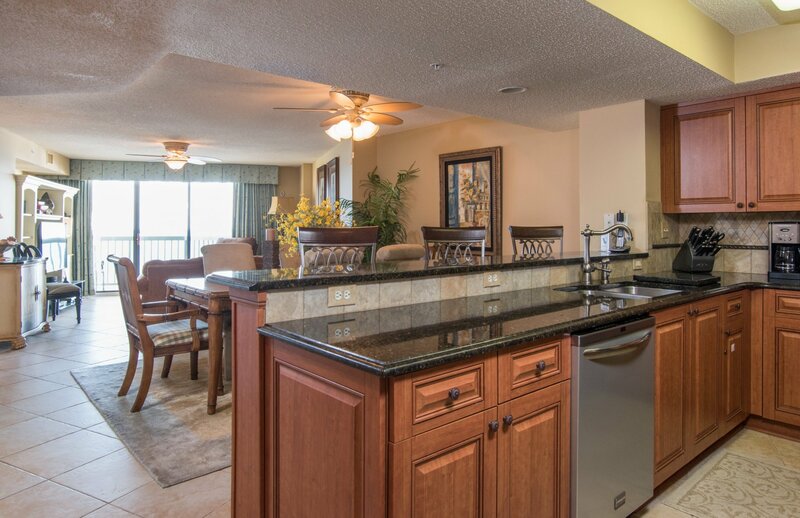 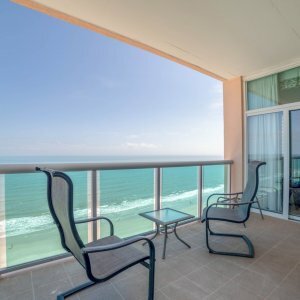 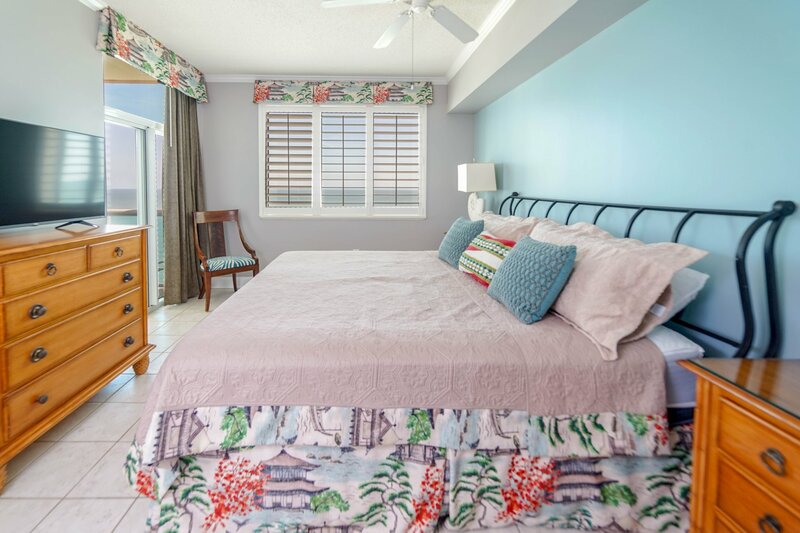 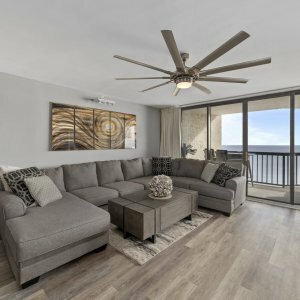 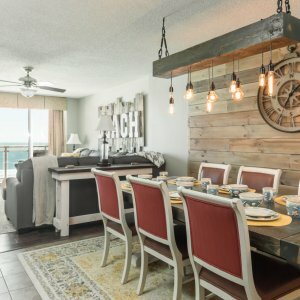 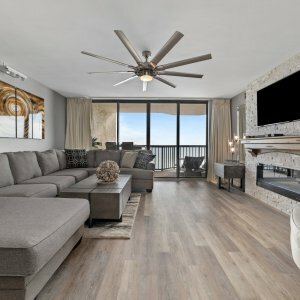 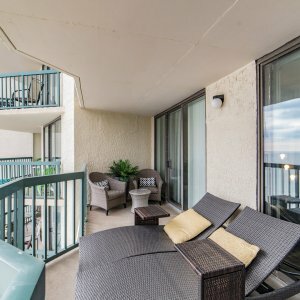 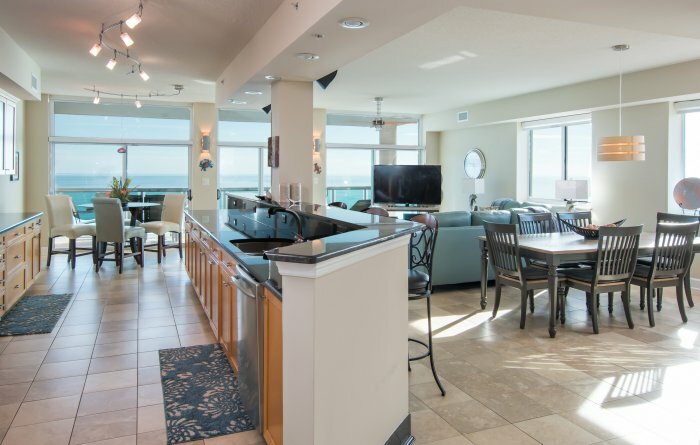 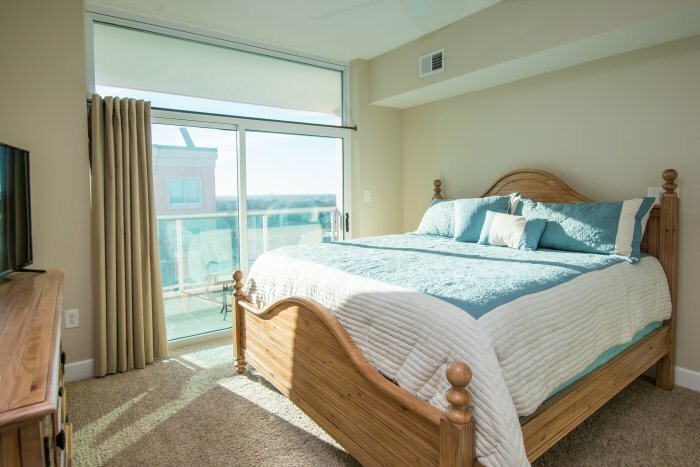 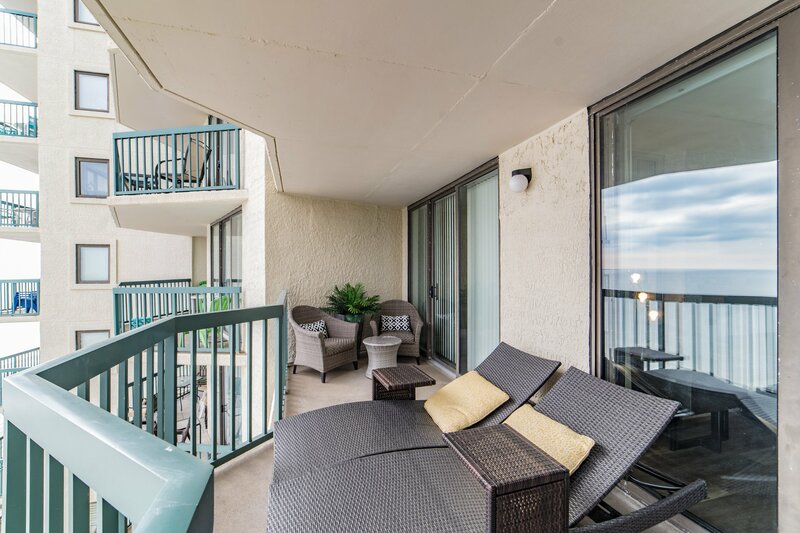 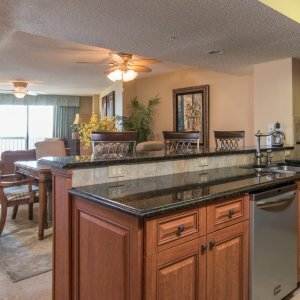 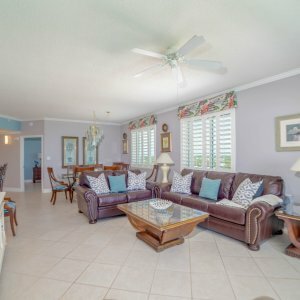 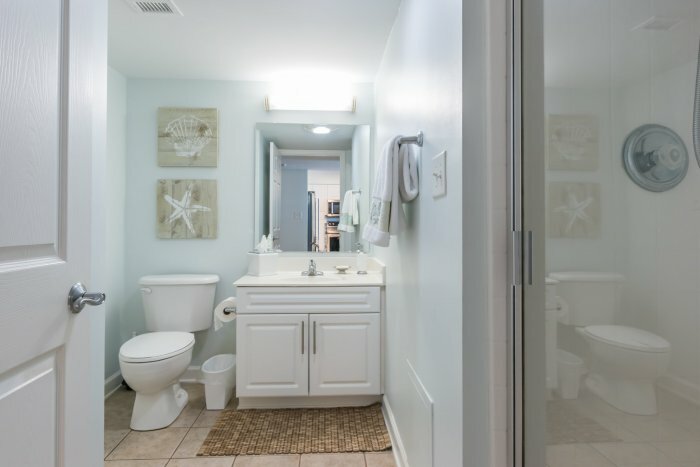 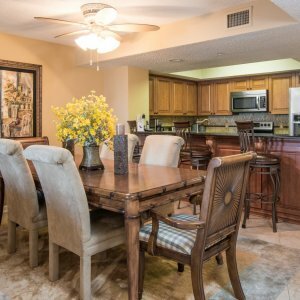 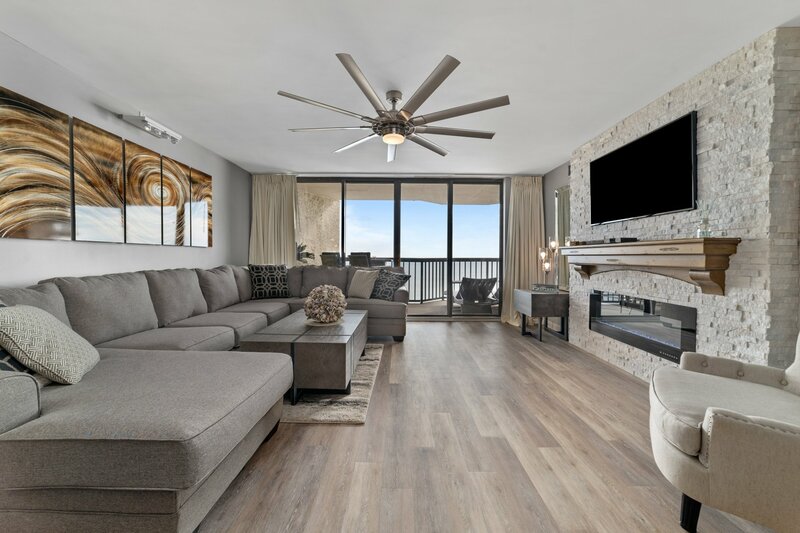 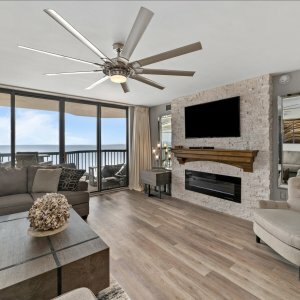 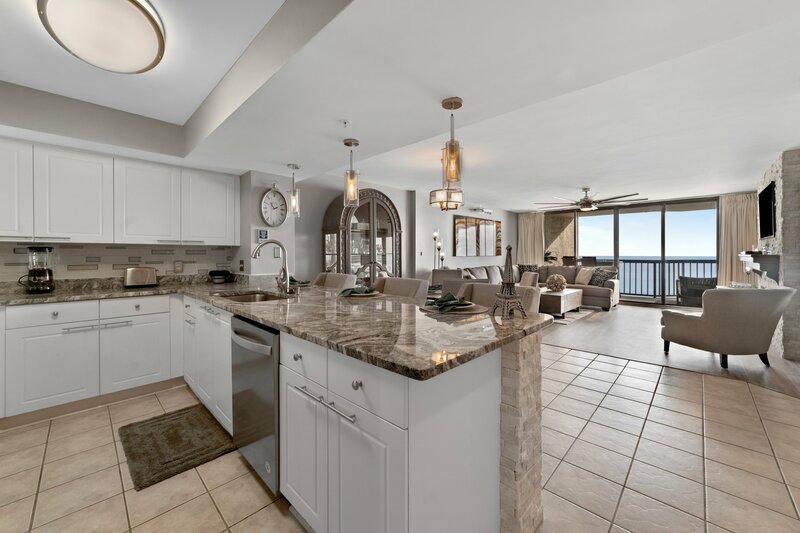 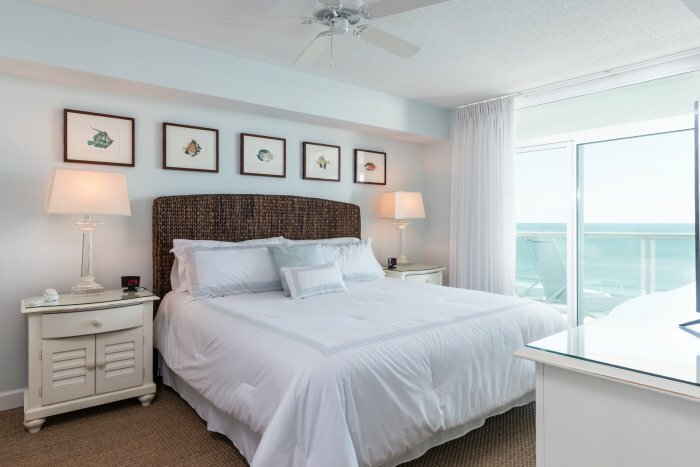 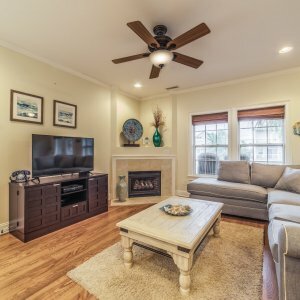 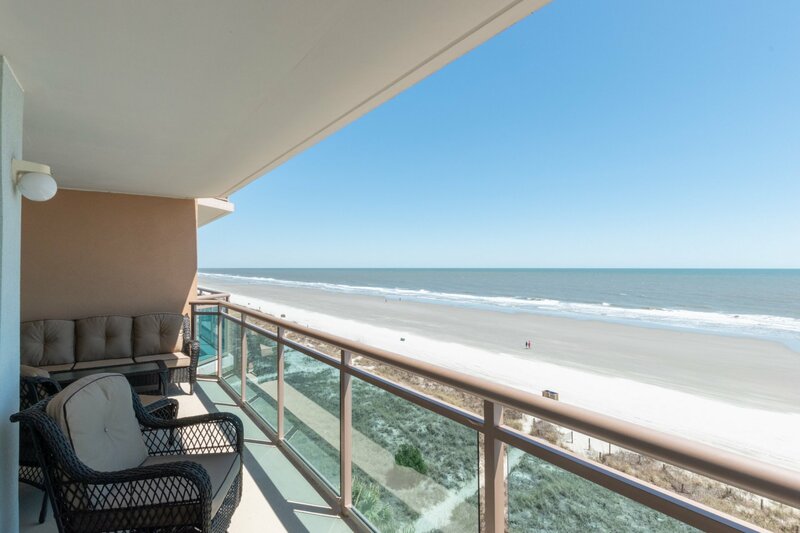 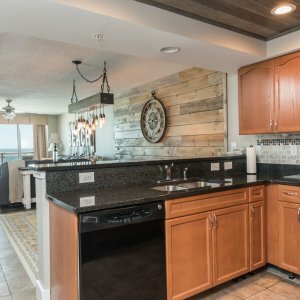 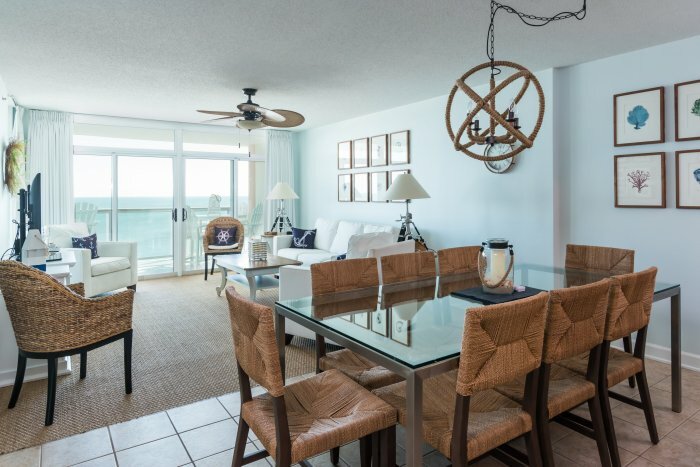 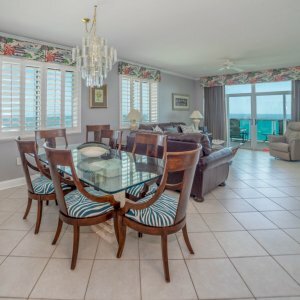 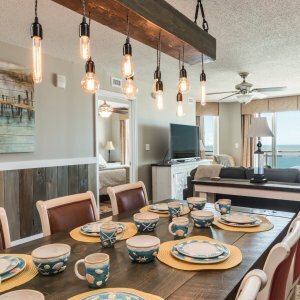 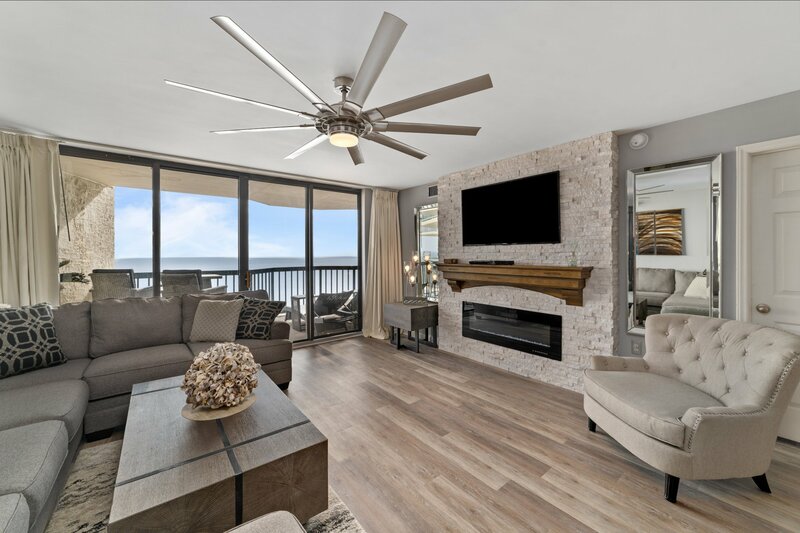 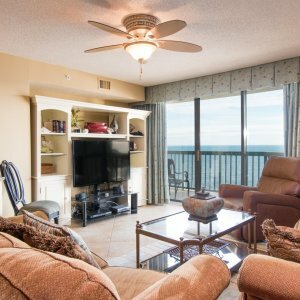 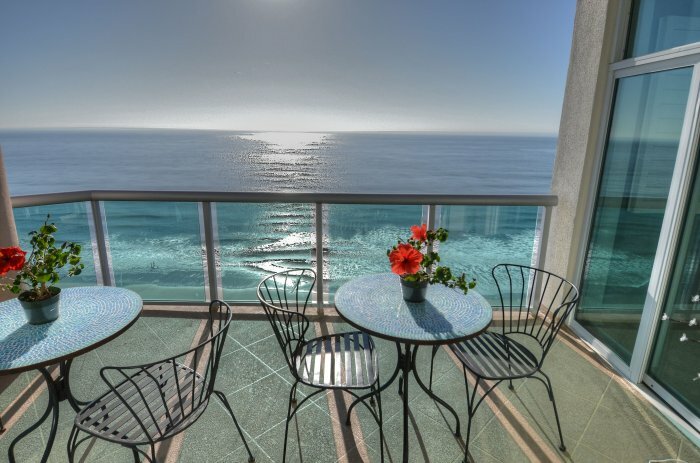 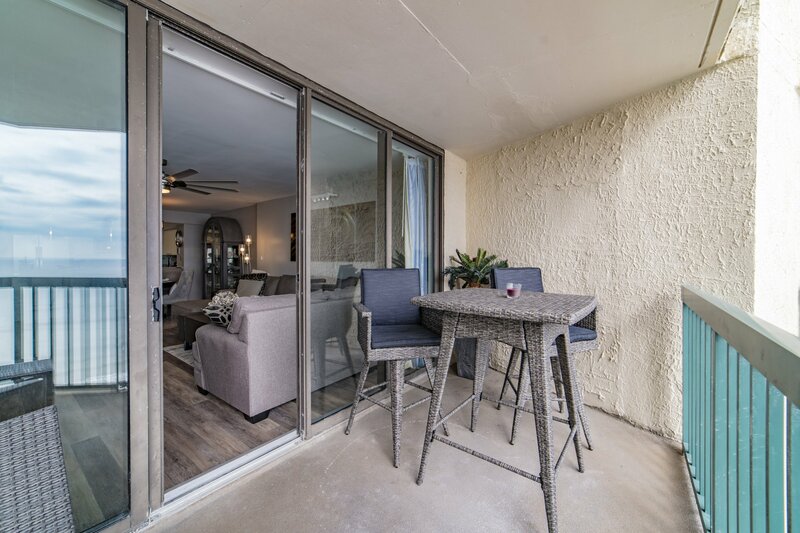 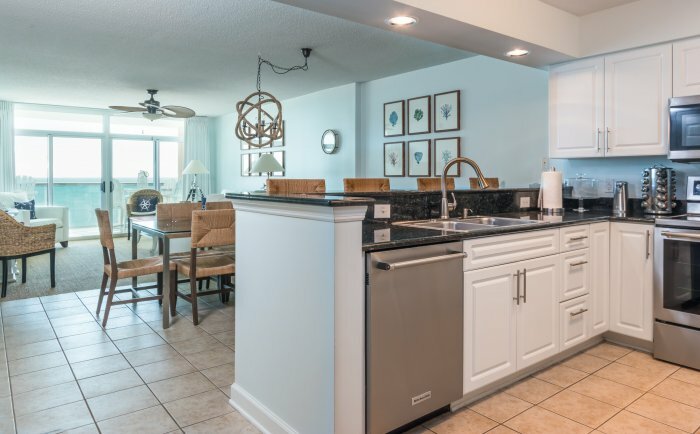 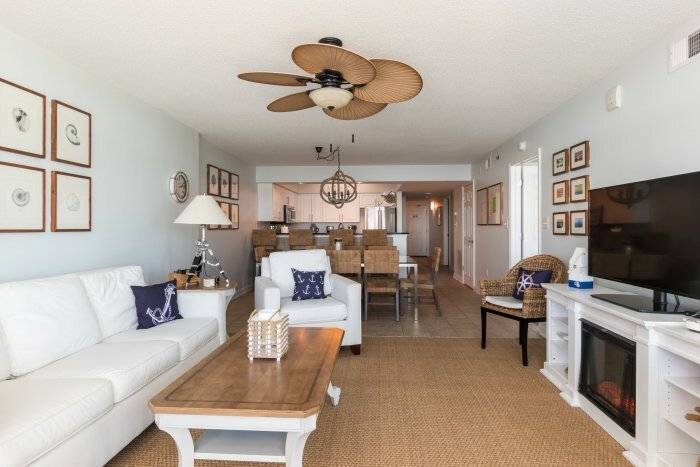 This 4 bedroom, 3 bath oceanfront condo is truly one of a kind, and features upscale furnishings and decor throughout, granite countertops, upgraded kitchen cabinets, stainless appliances, and luxurious bedding! 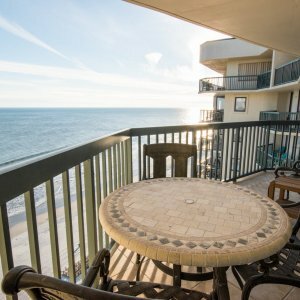 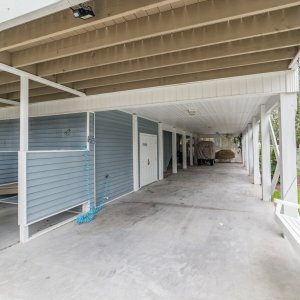 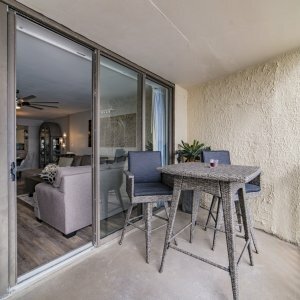 For your convenience, the owner of this condo provides 2 beach chairs and an umbrella for your use on the beach every day! 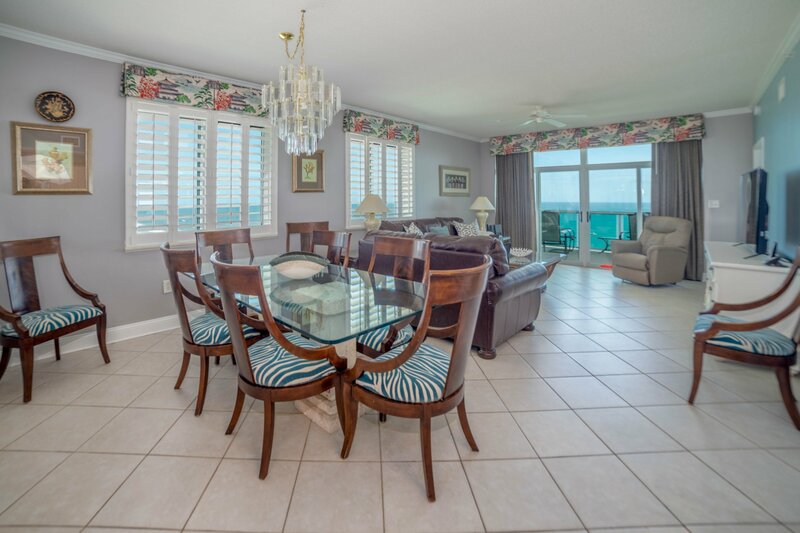 Located within a short walk to the beach, do not pass up this luxuriously decorated and maintained duplex perfect for families and golfers! 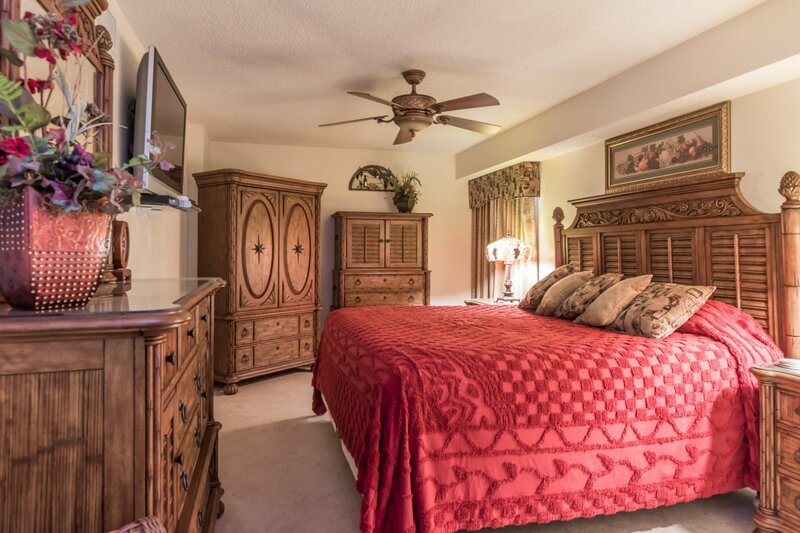 This condo offers 2 master bedrooms. 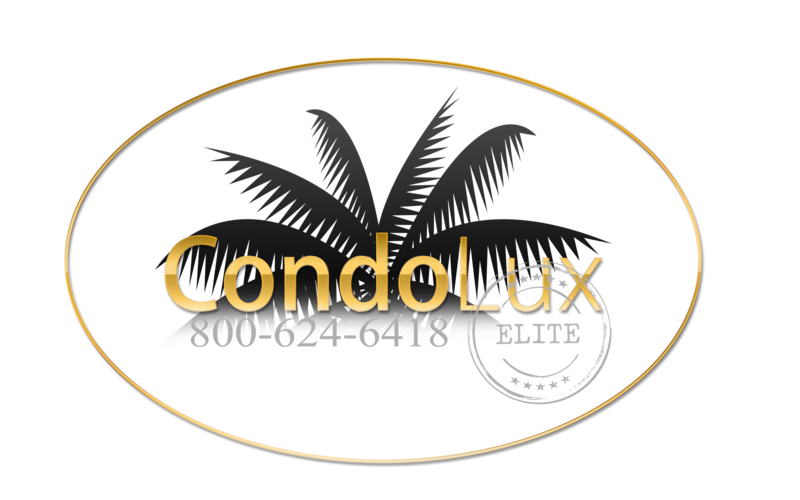 One visit and you will know why we gave this condo the Elite Designation. 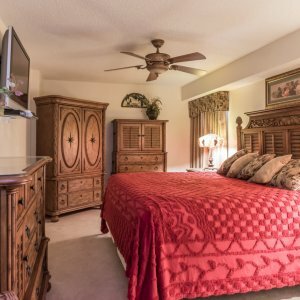 You will not find another like it. 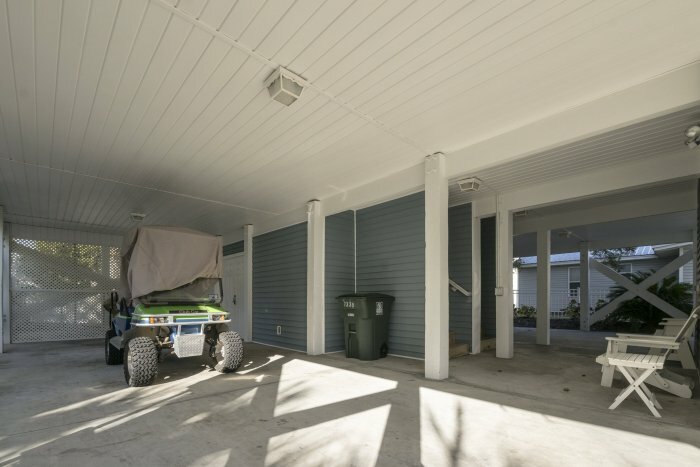 Golf cart included in rental! 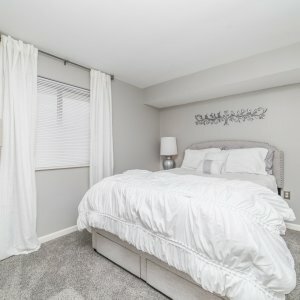 New bedding added. 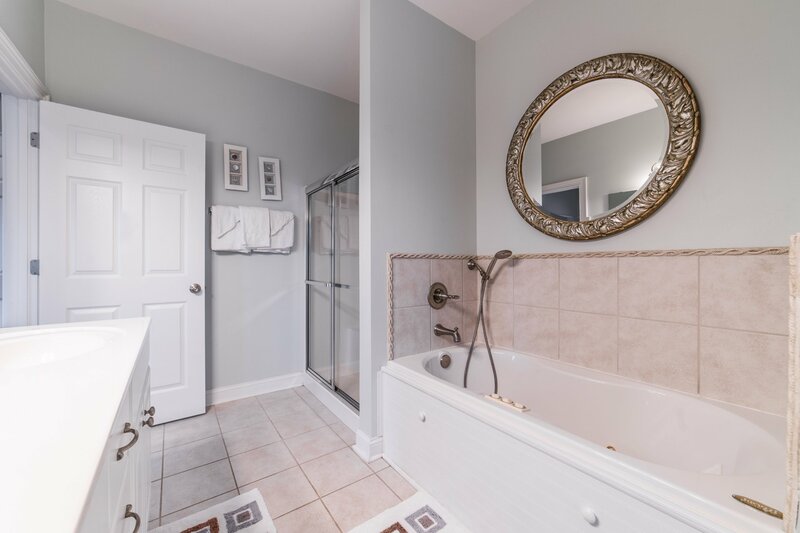 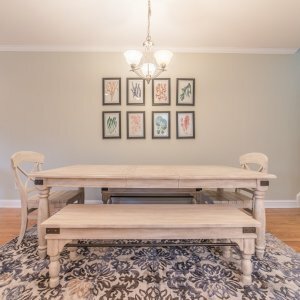 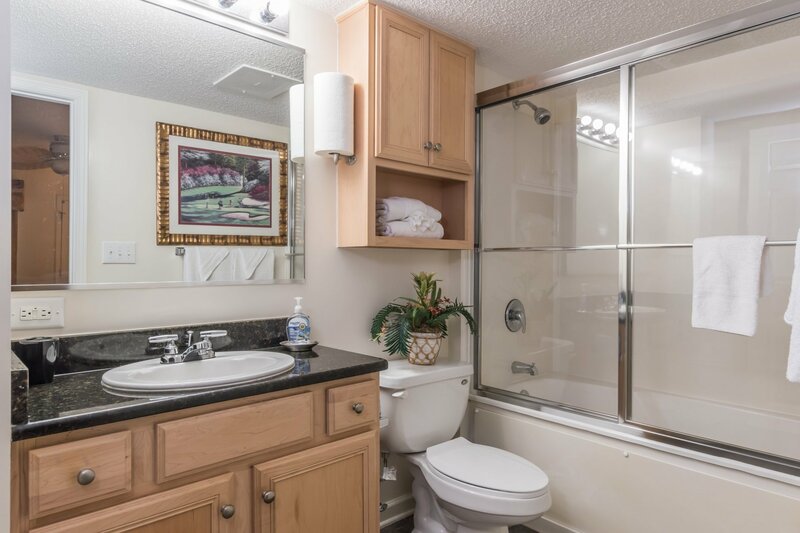 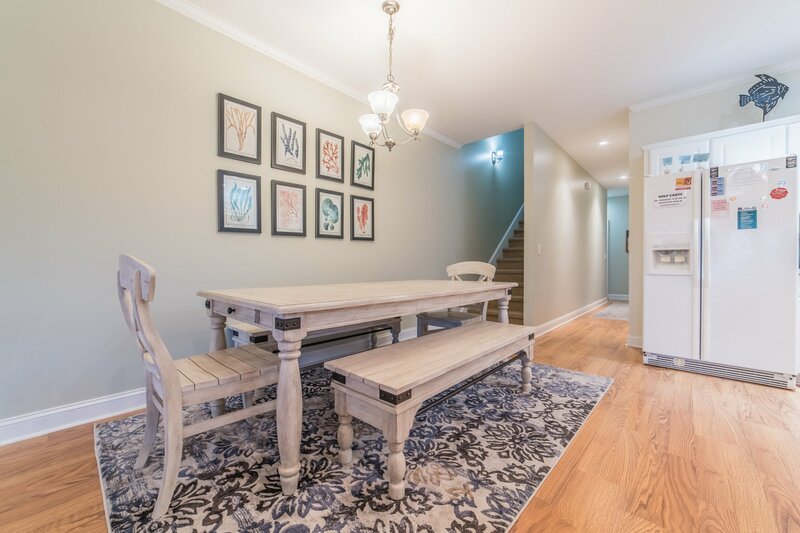 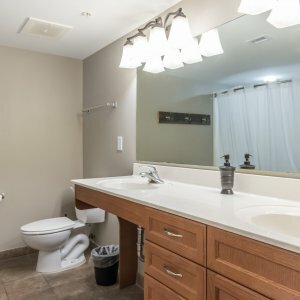 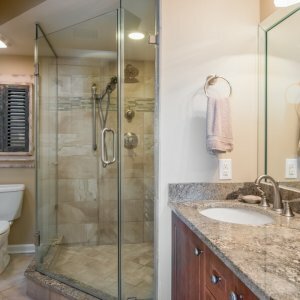 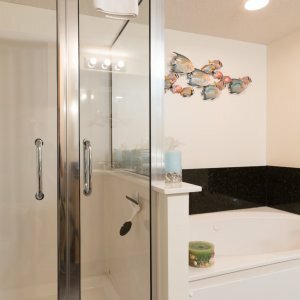 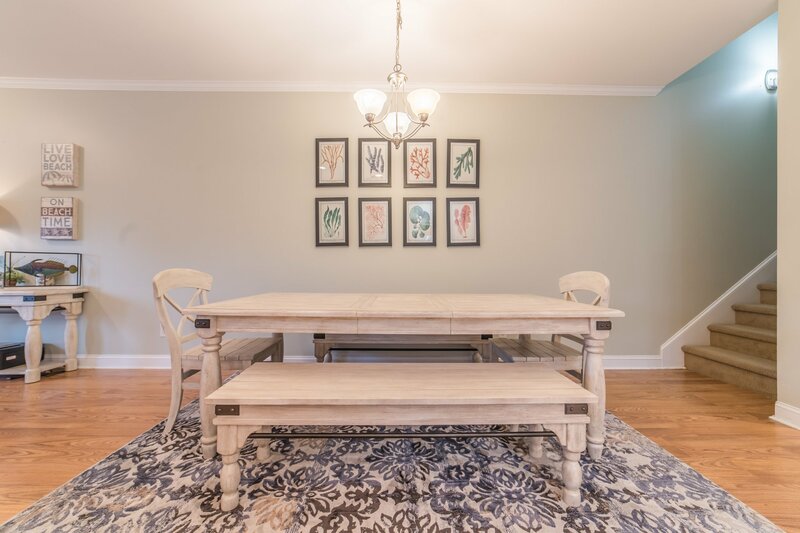 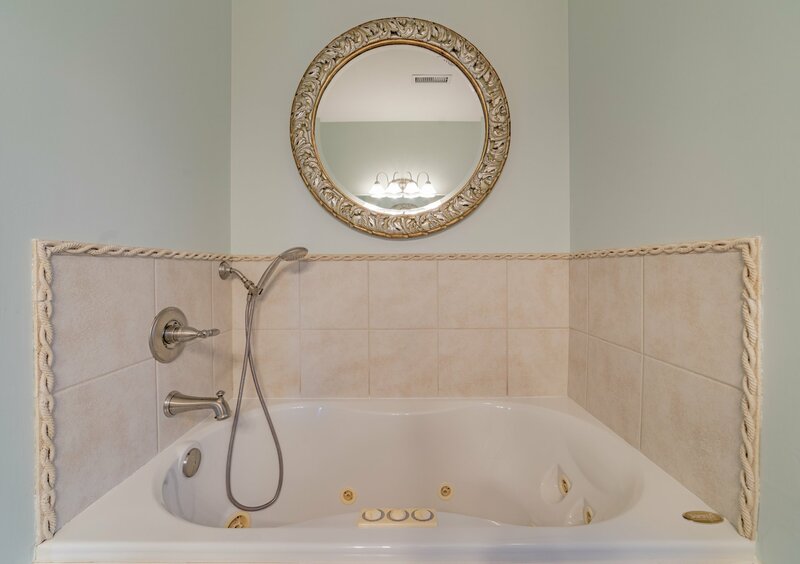 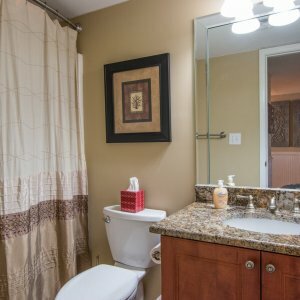 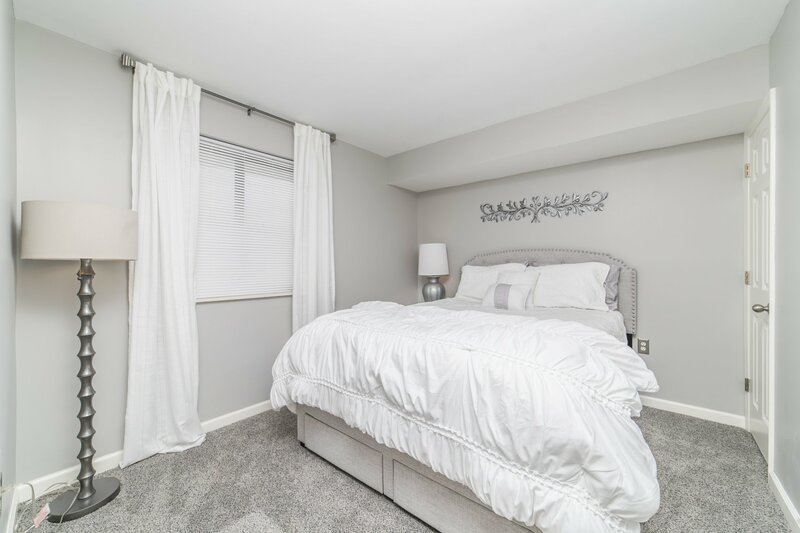 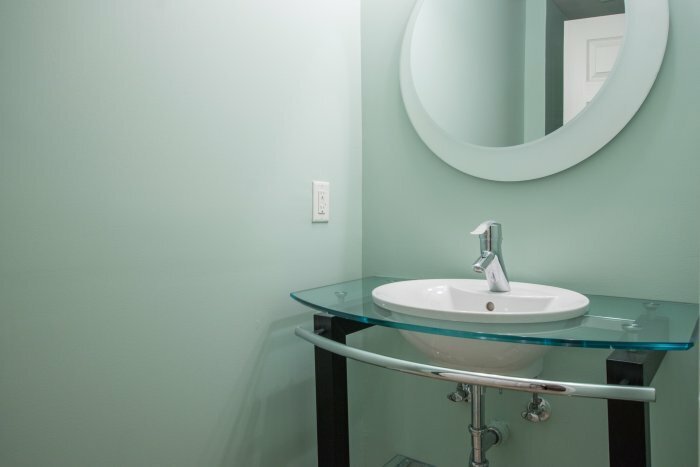 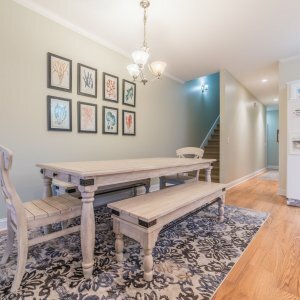 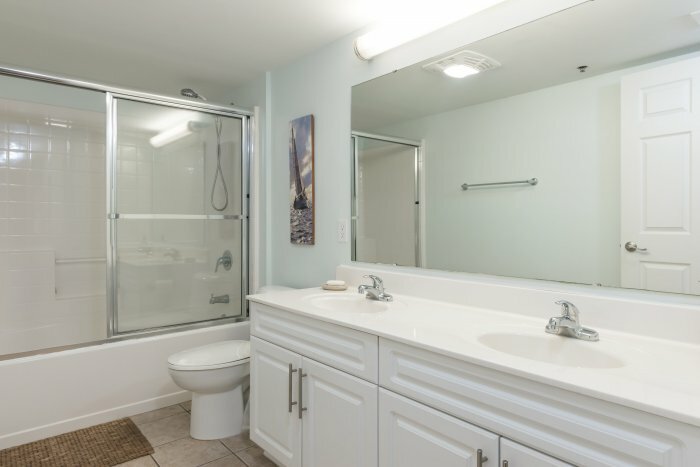 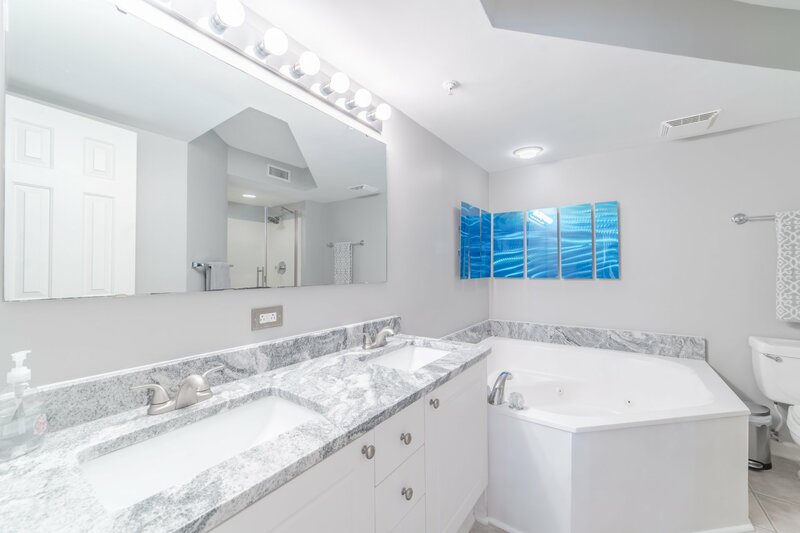 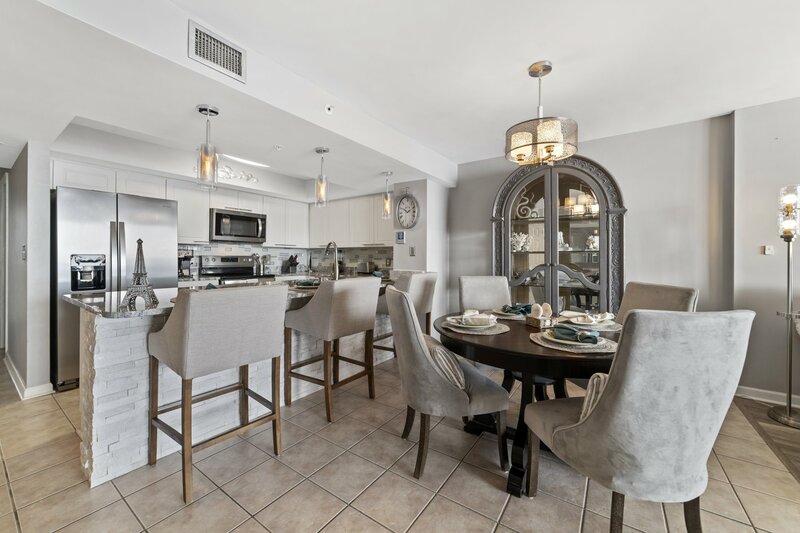 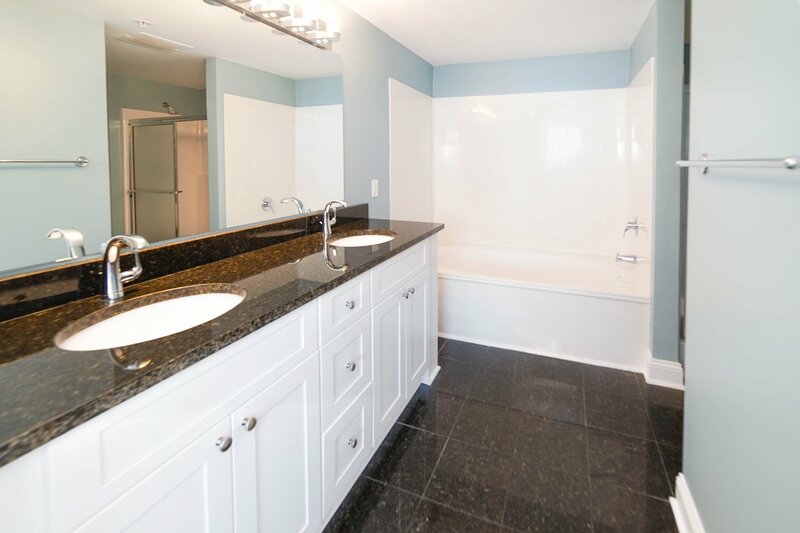 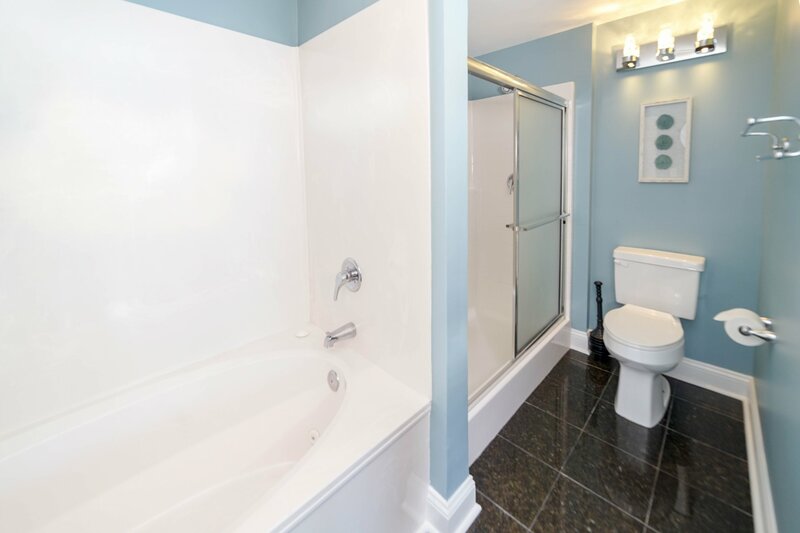 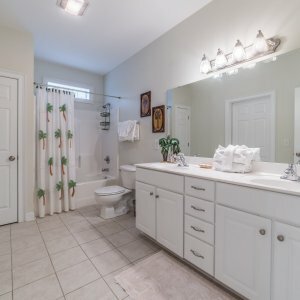 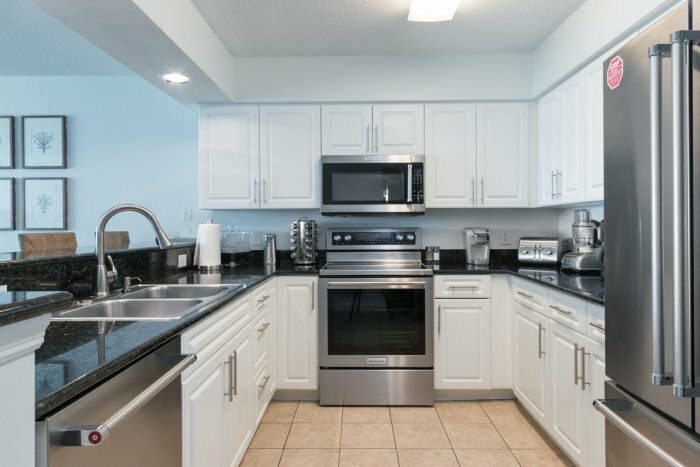 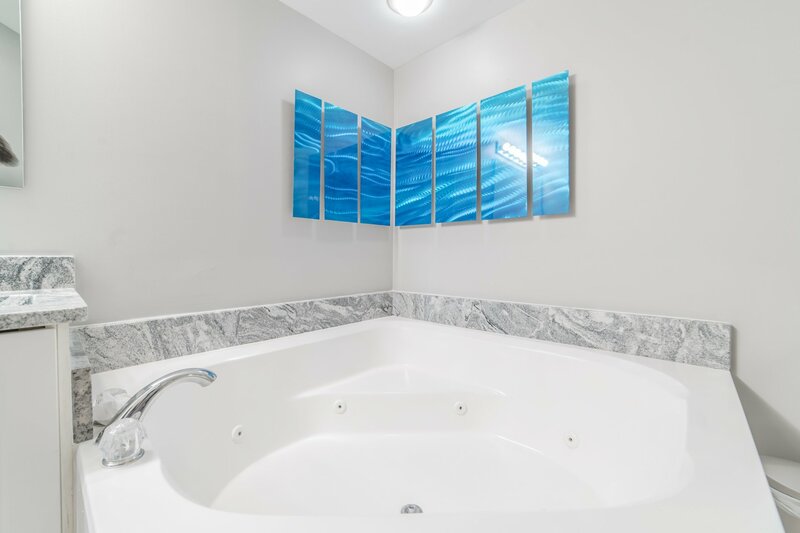 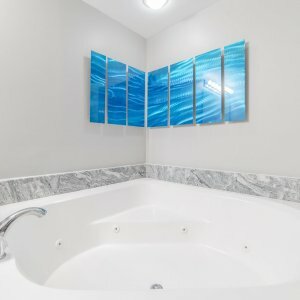 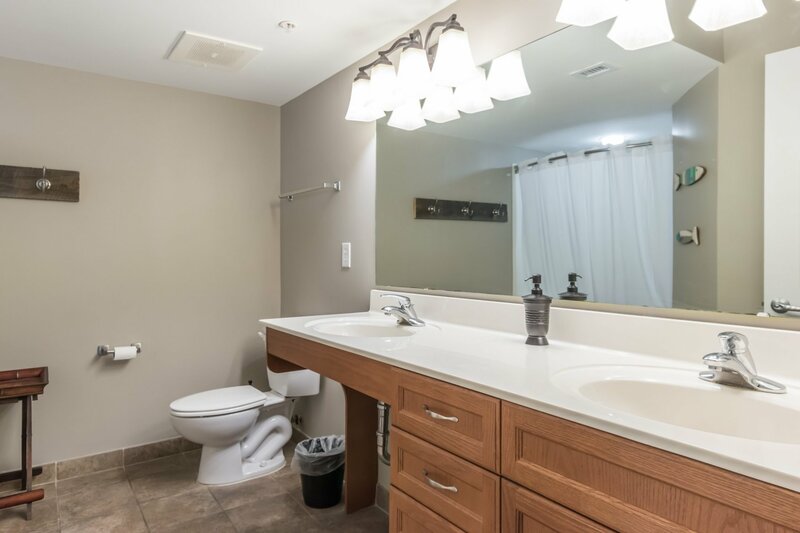 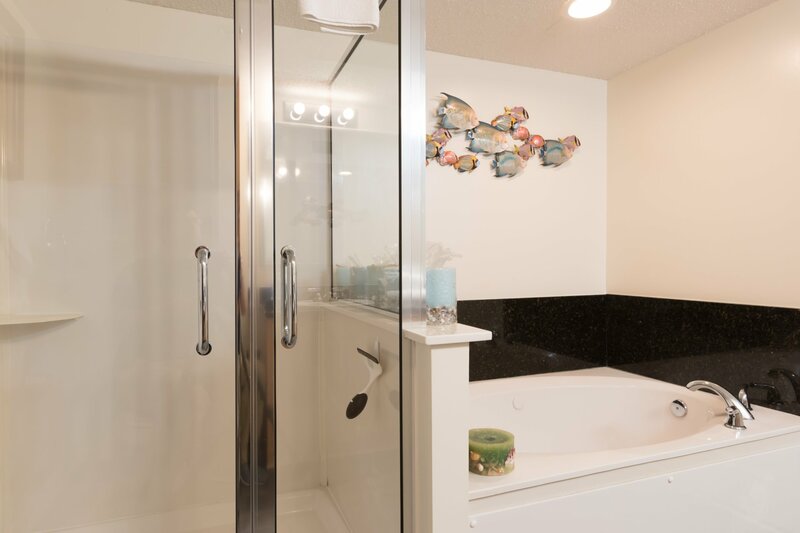 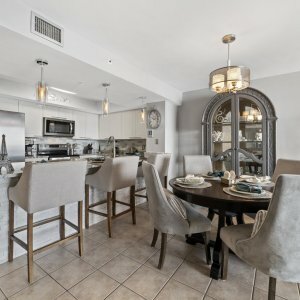 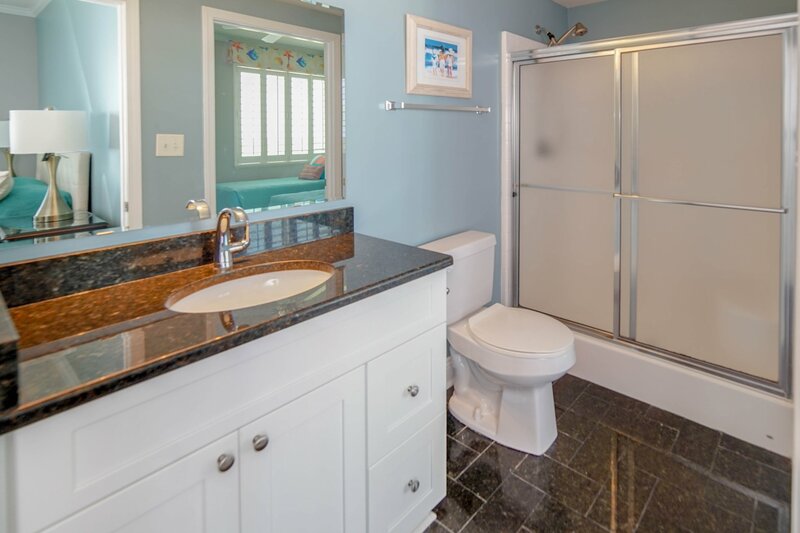 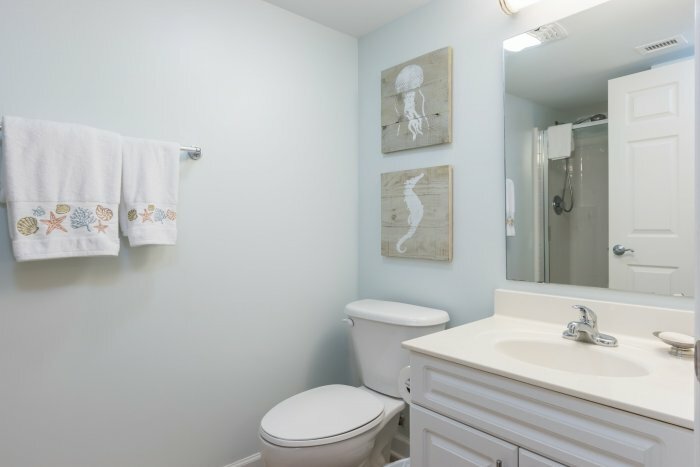 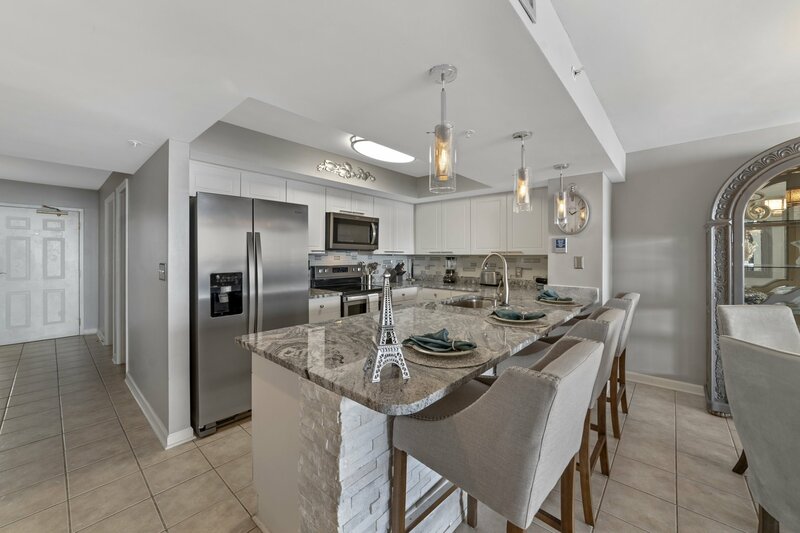 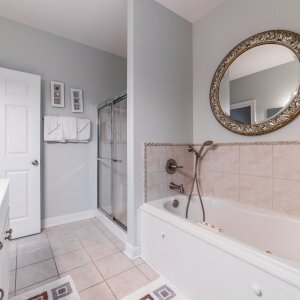 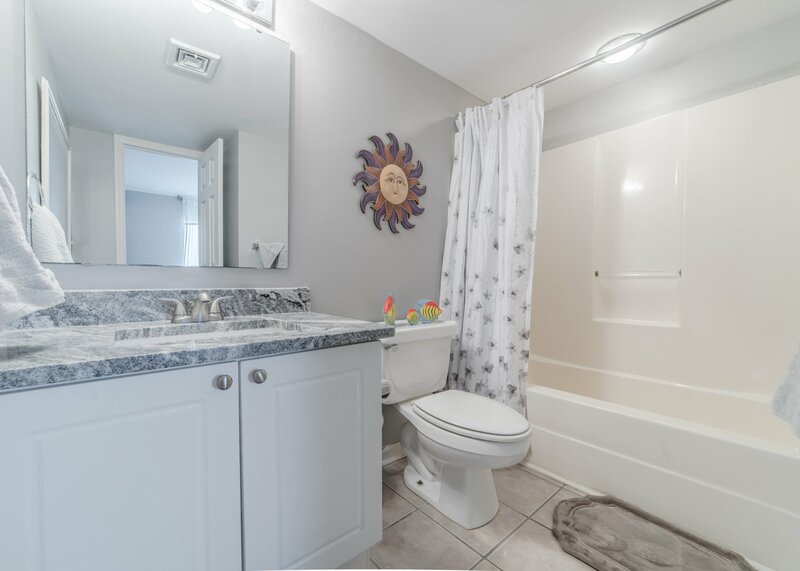 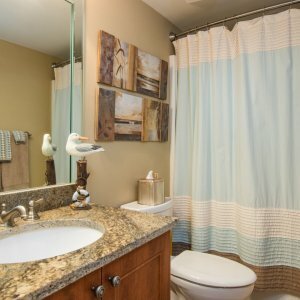 Under new ownership, this gorgeous Elite condo has been fully updated with high-end finishes, gorgeous tile throughout, and has been professionally decorated. 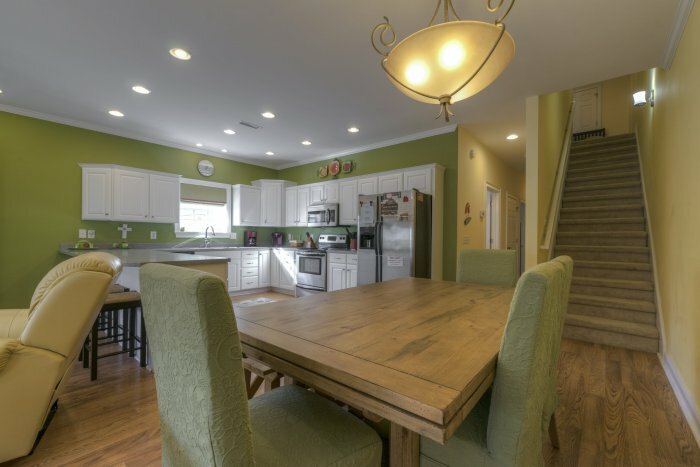 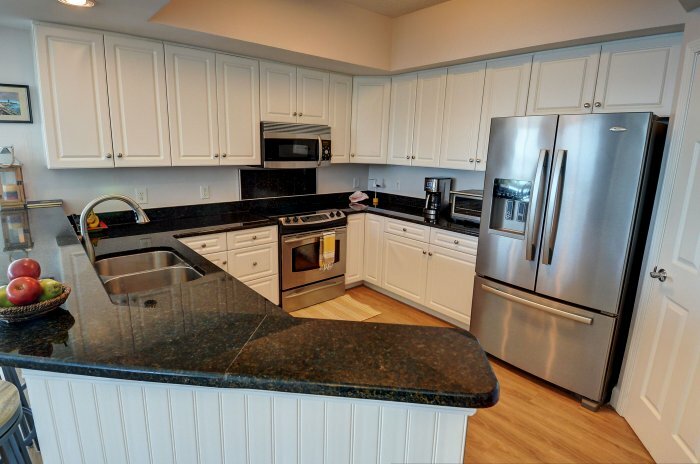 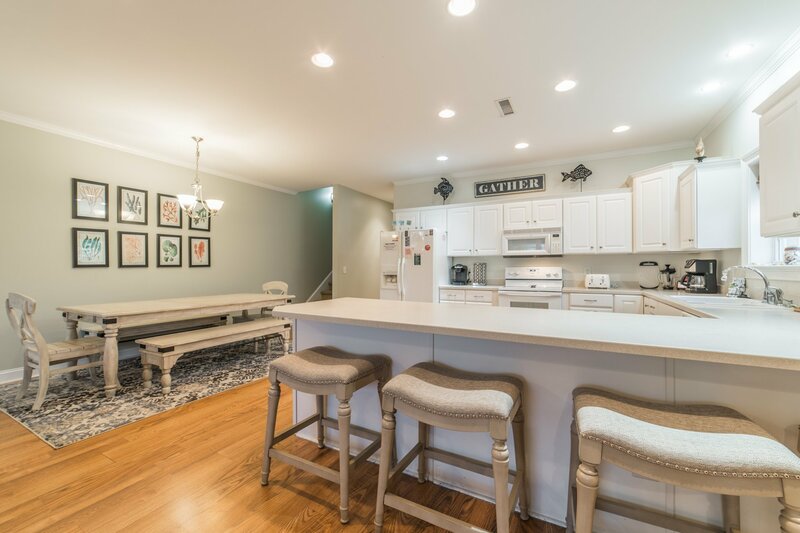 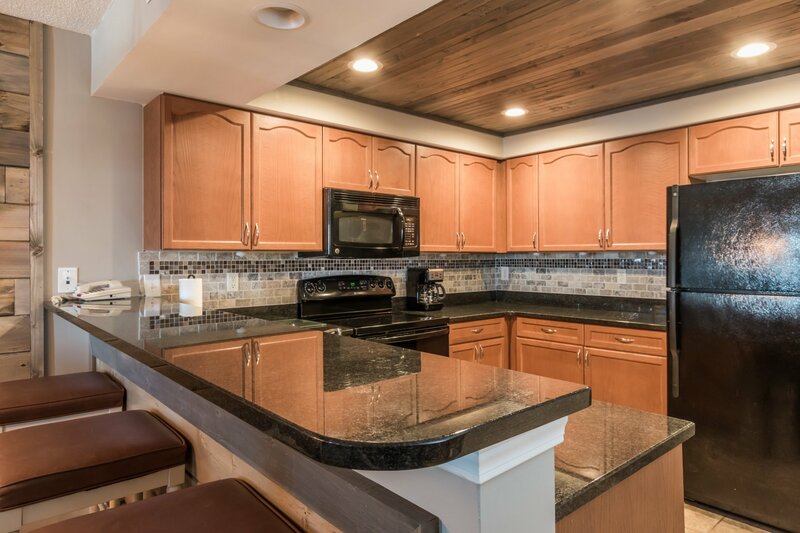 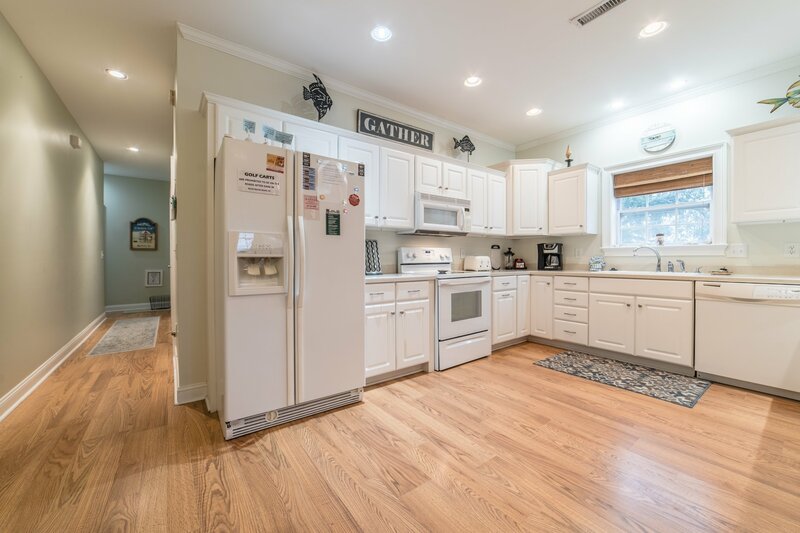 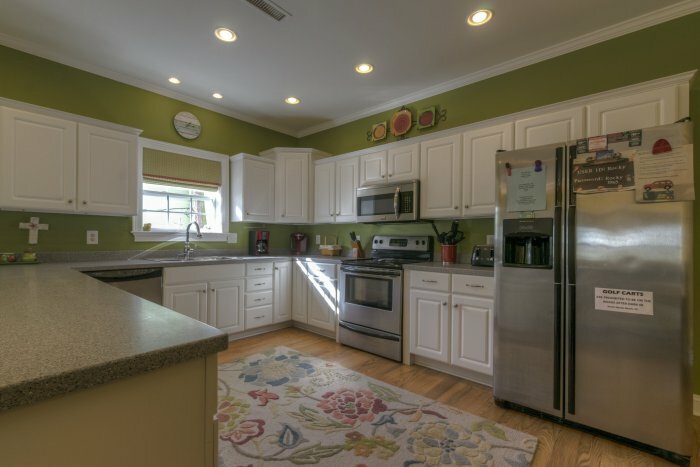 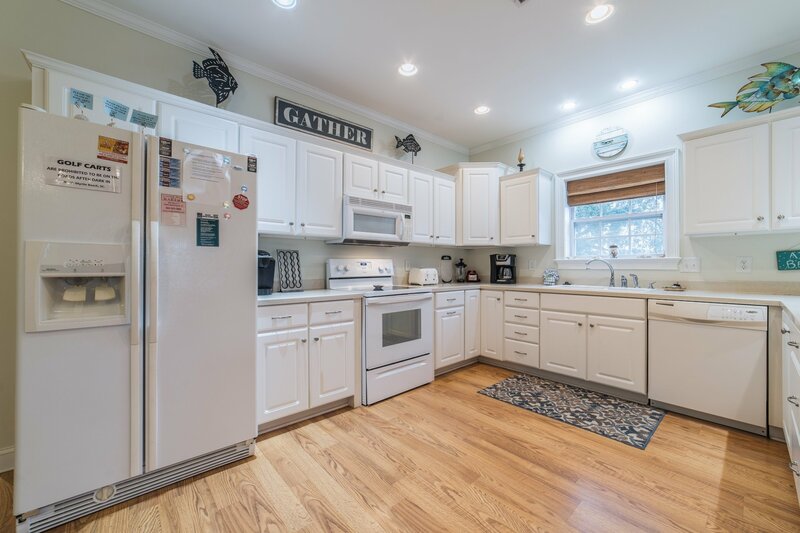 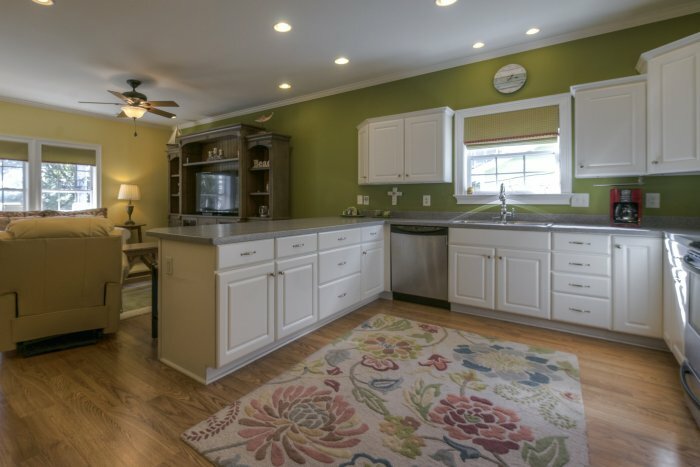 Featuring new granite countertops, custom cabinetry, and stainless steel applainces, the kitchen is a dream! 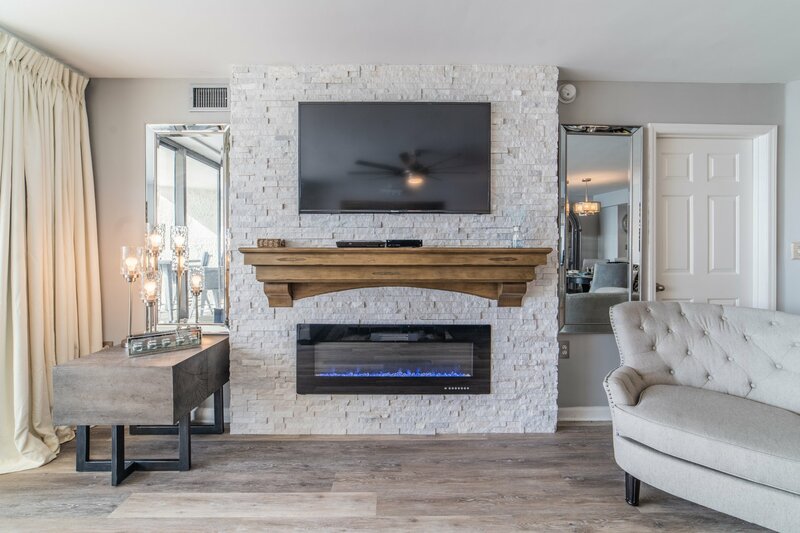 The beautiful leather sofa, loveseat, and recliner, along with the 55-inch 4K Ultra HD Smart TV and 4K Ultra HD Blu-ray player make the living room a comfortable retreat. 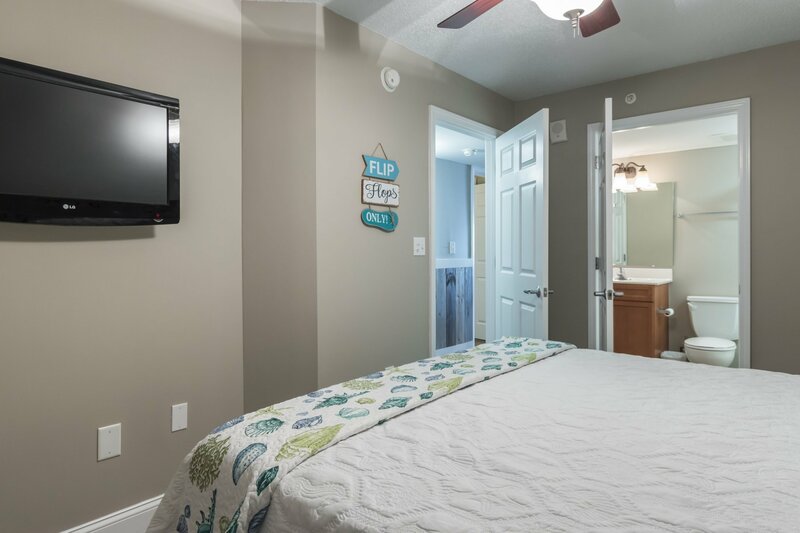 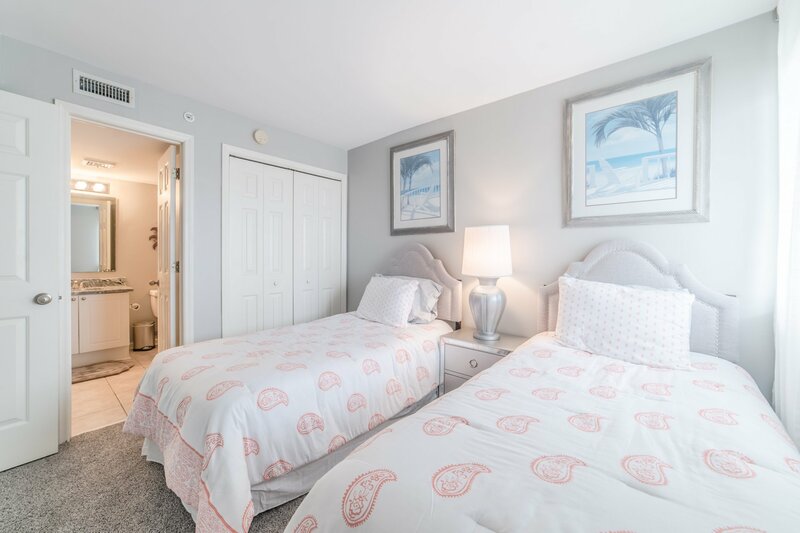 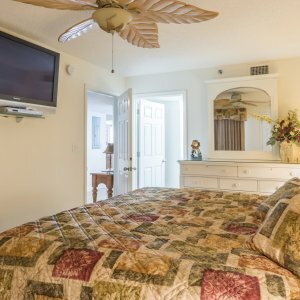 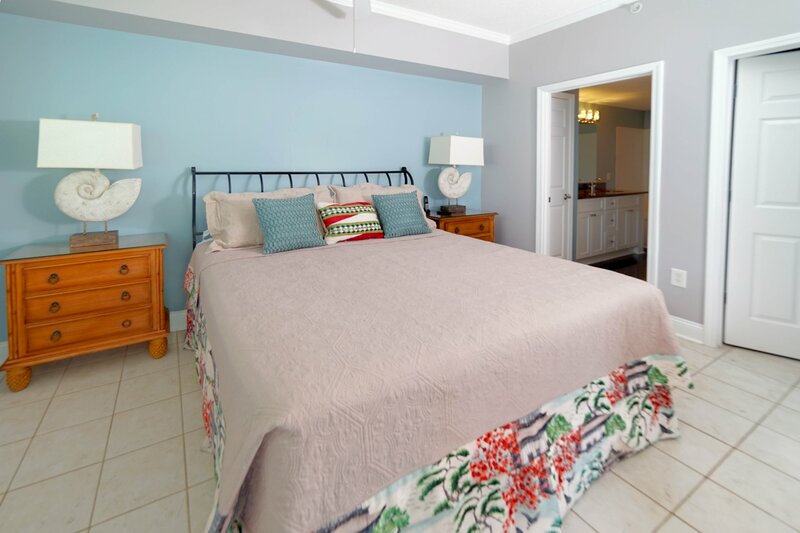 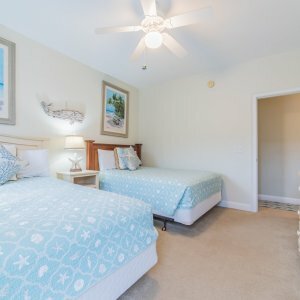 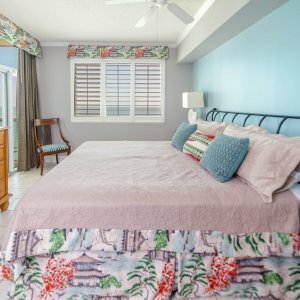 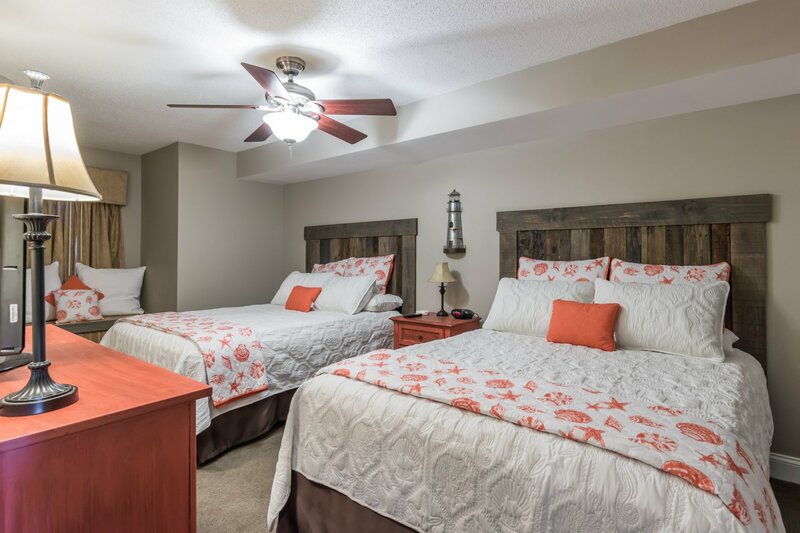 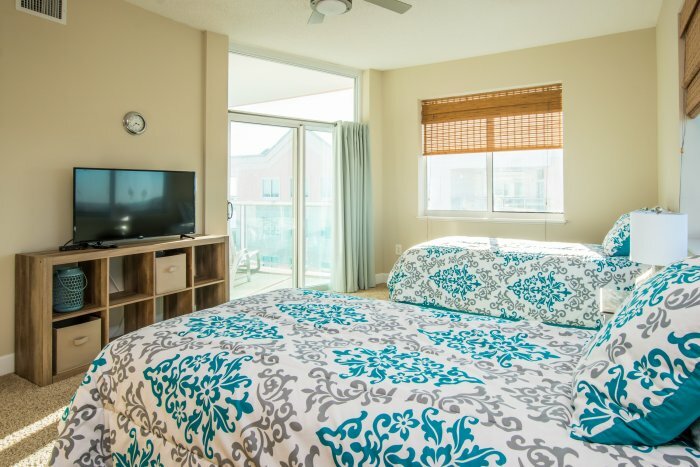 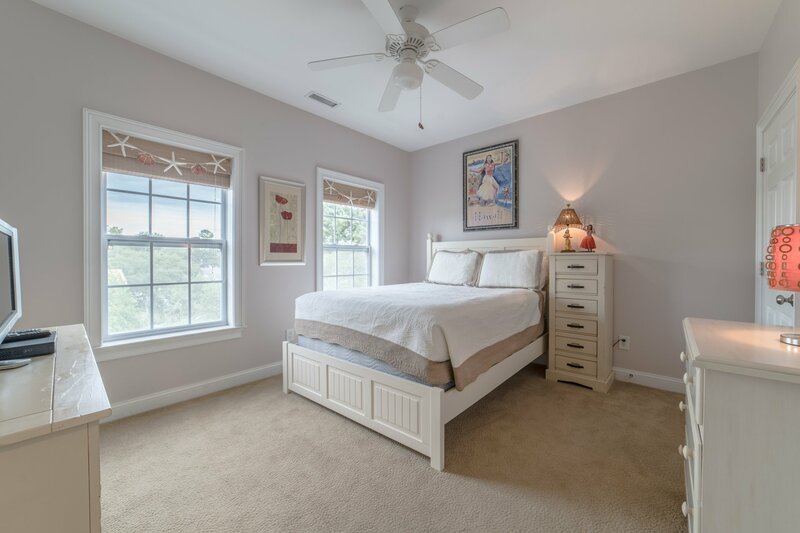 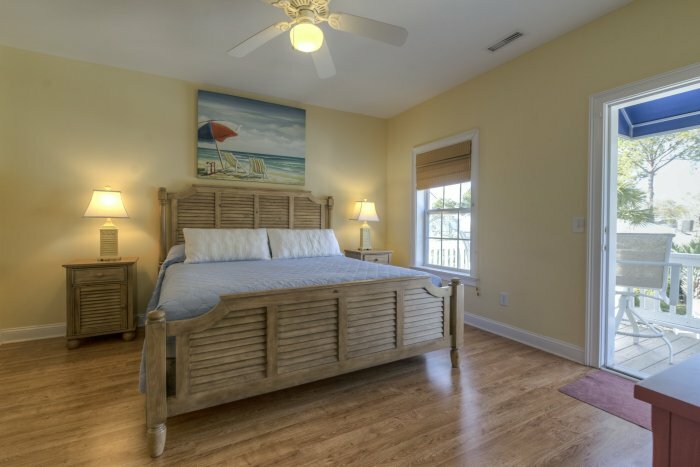 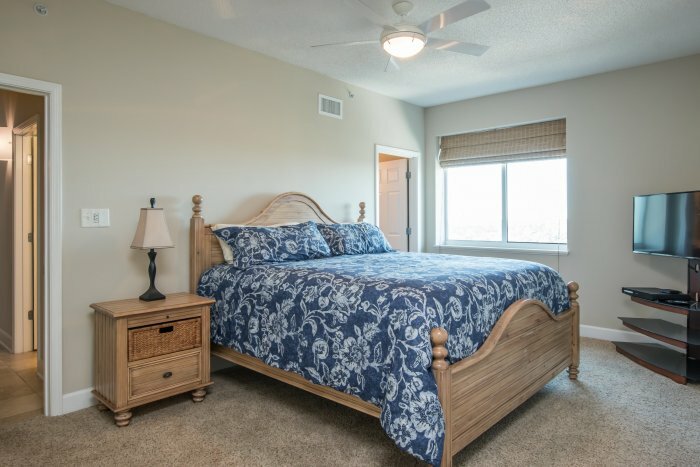 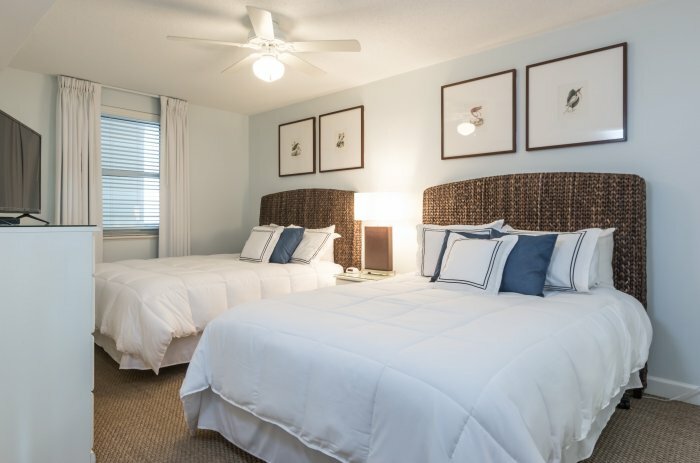 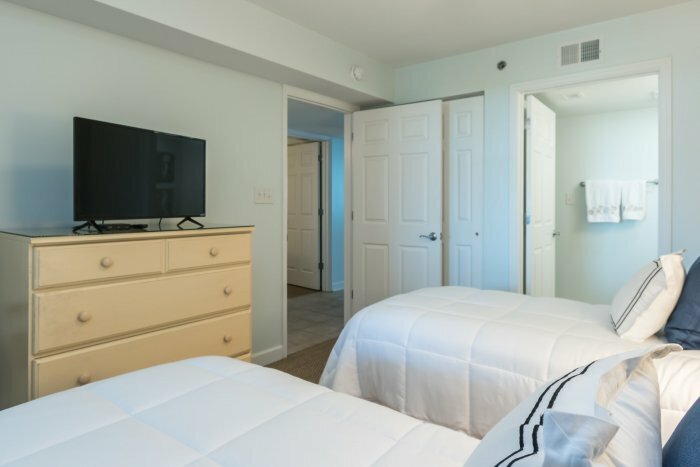 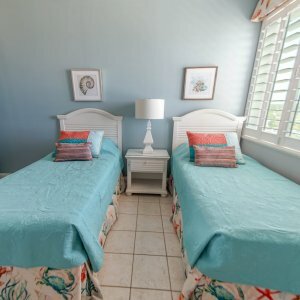 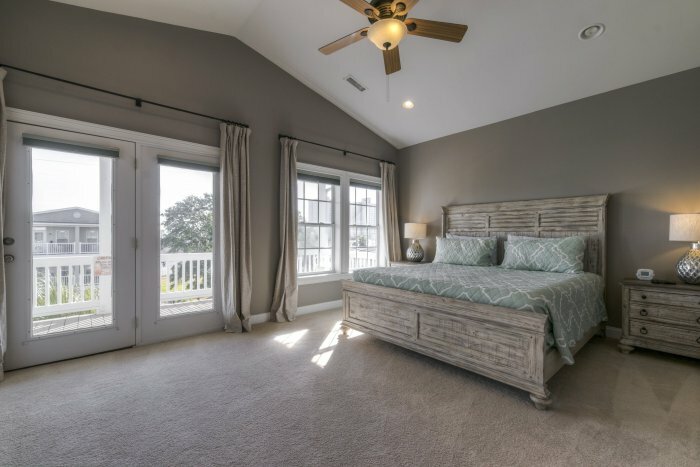 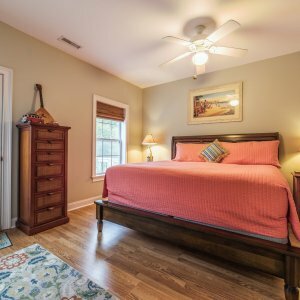 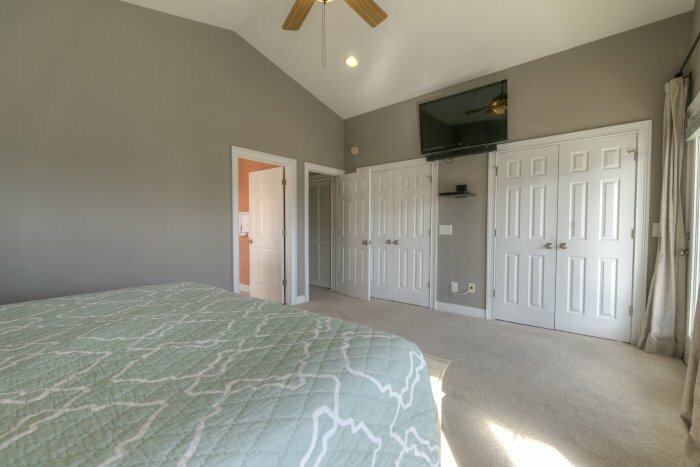 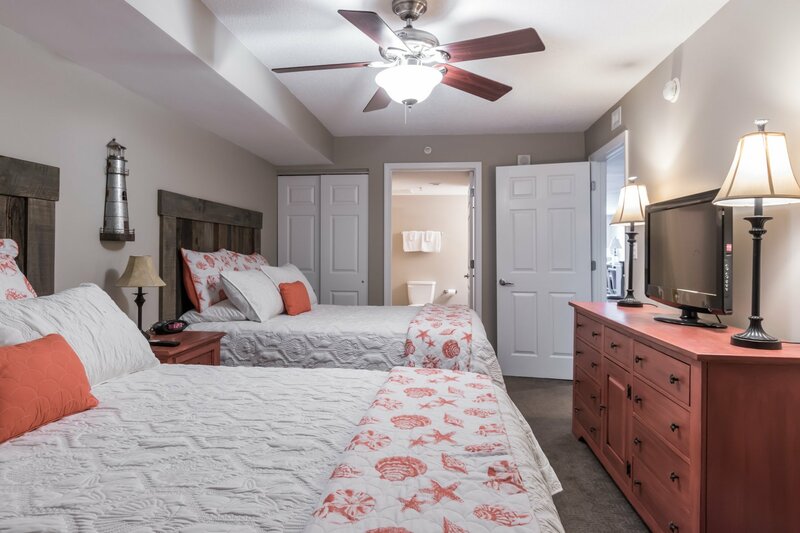 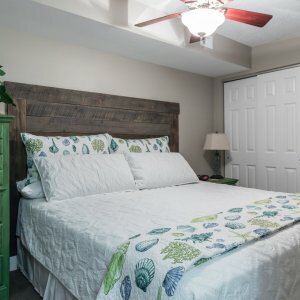 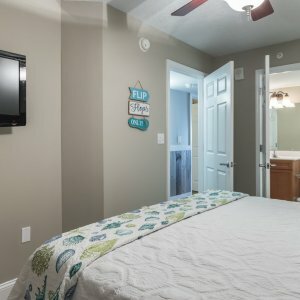 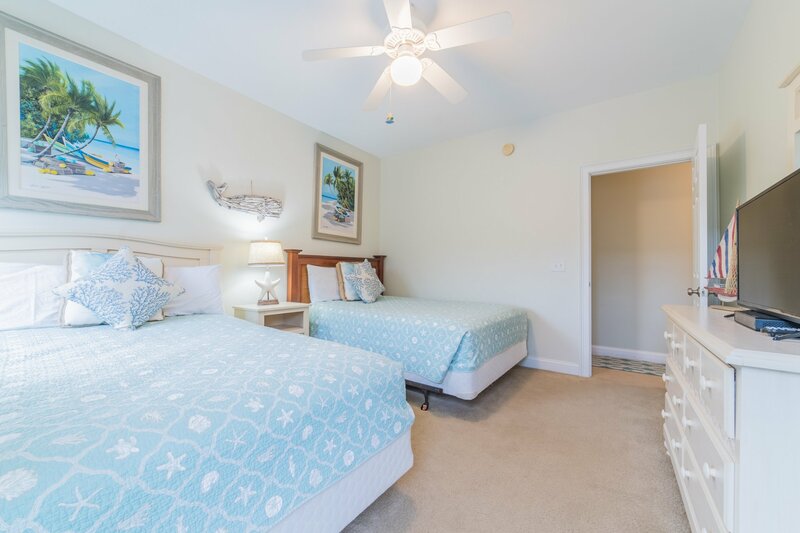 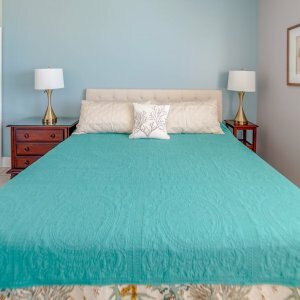 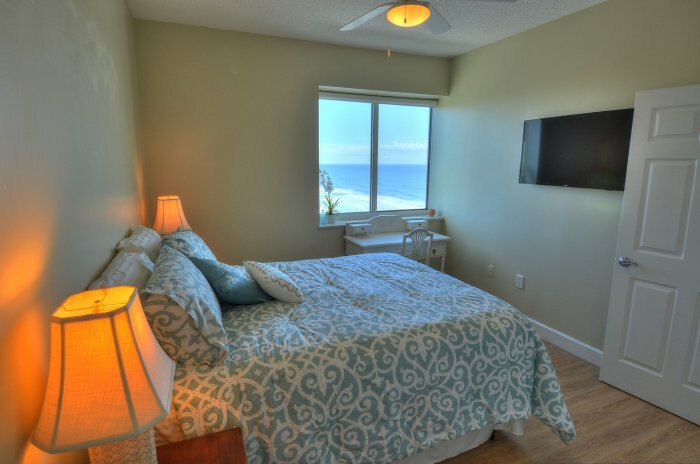 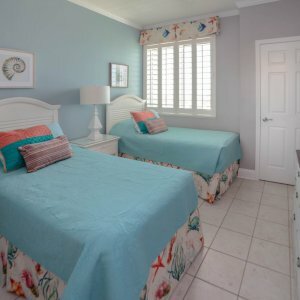 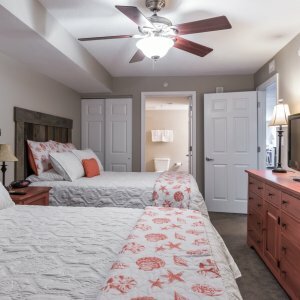 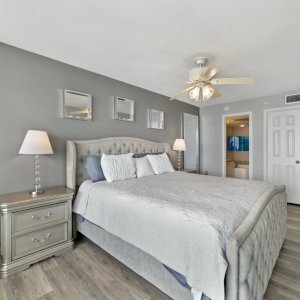 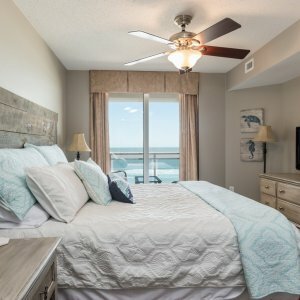 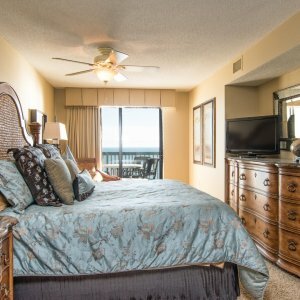 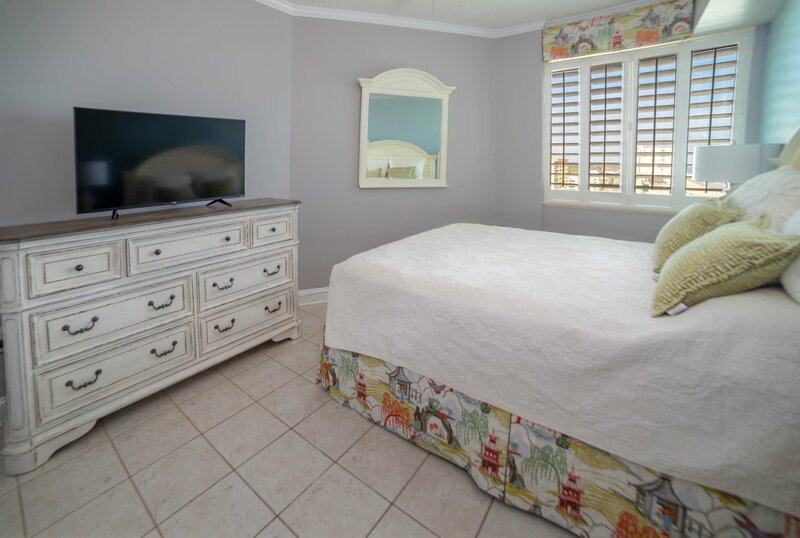 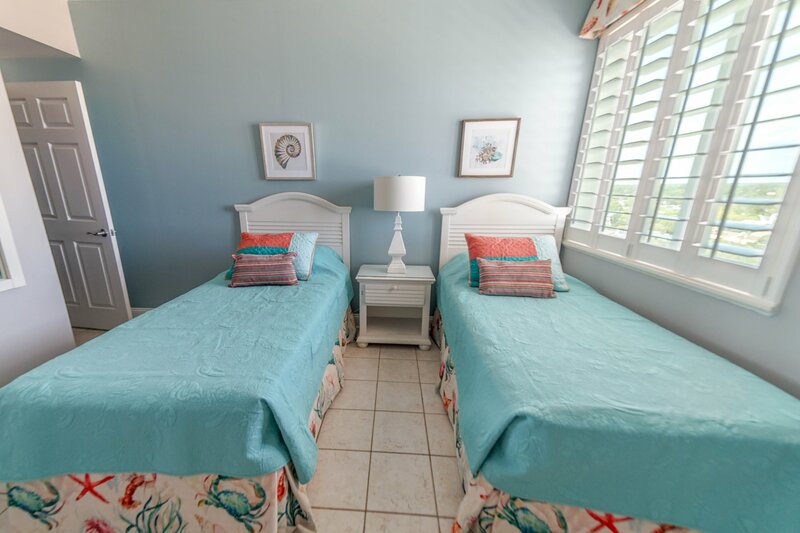 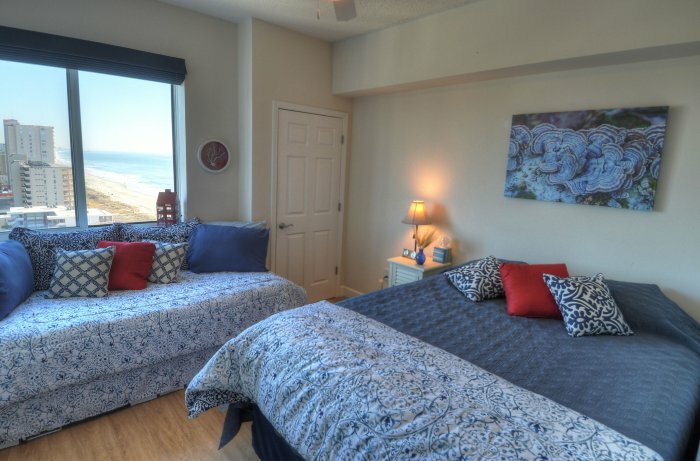 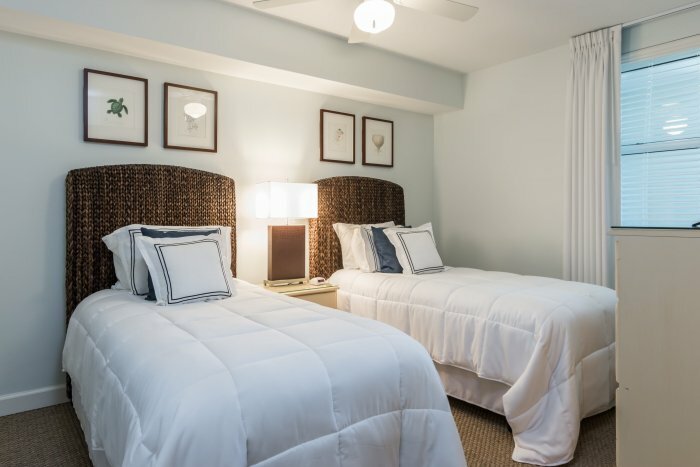 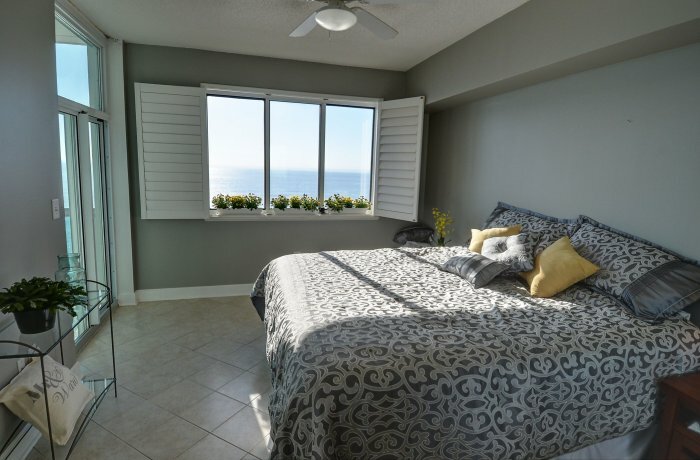 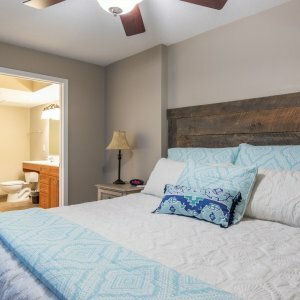 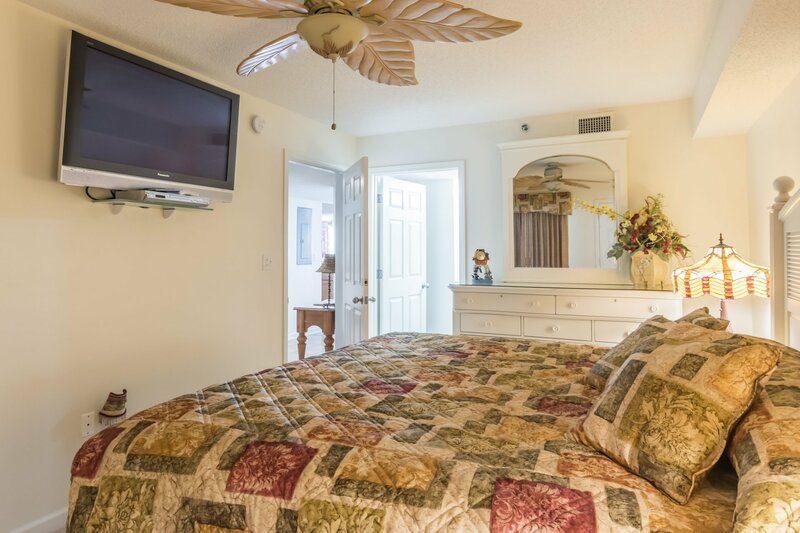 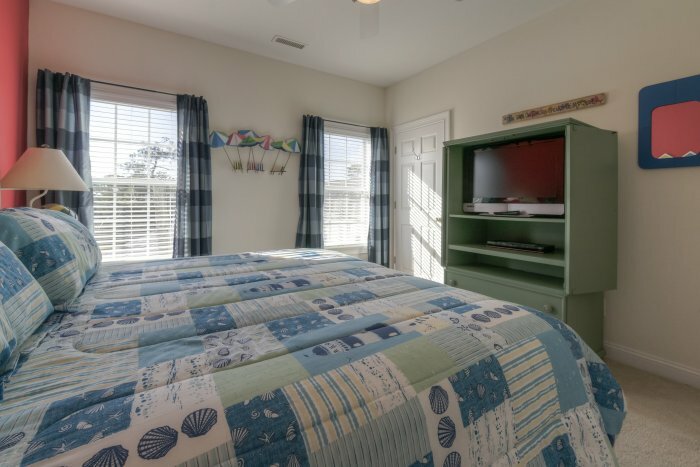 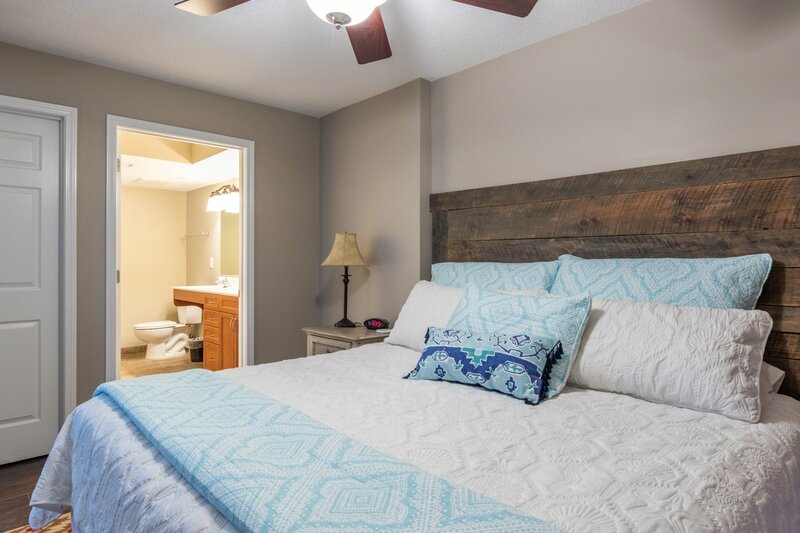 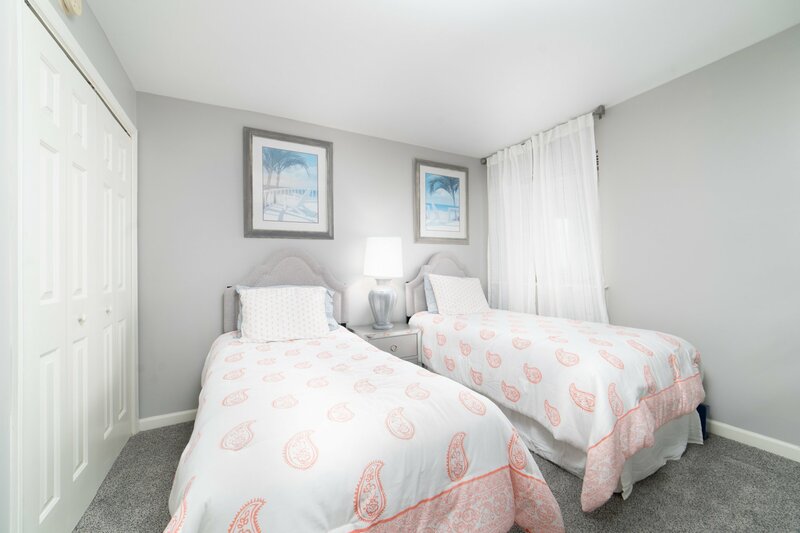 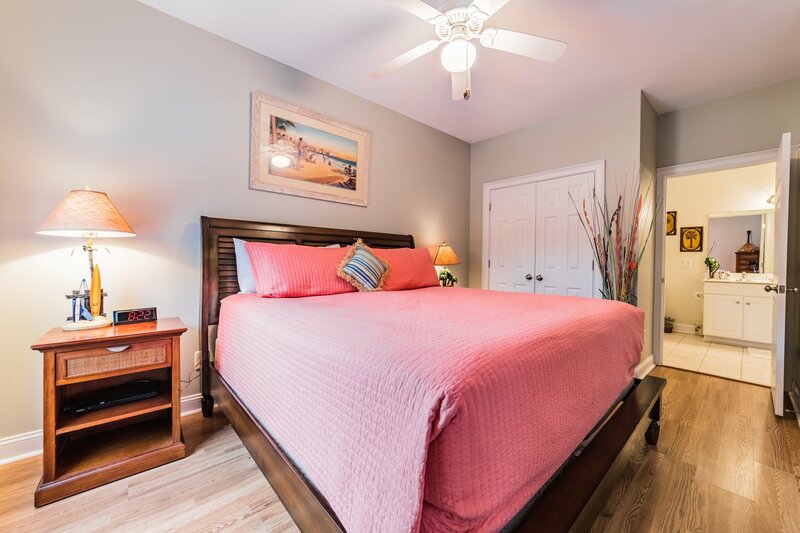 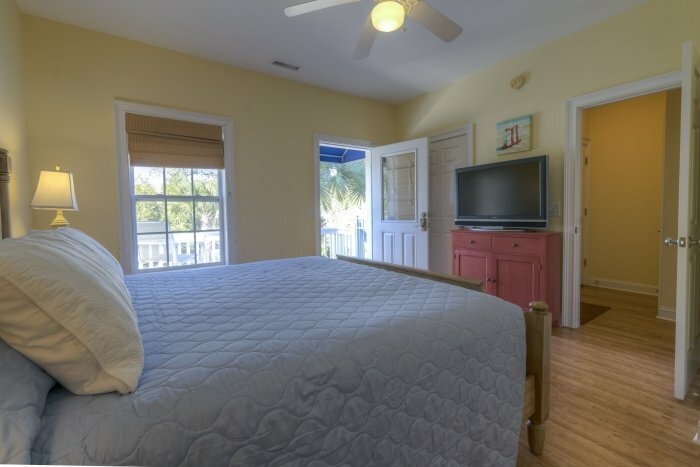 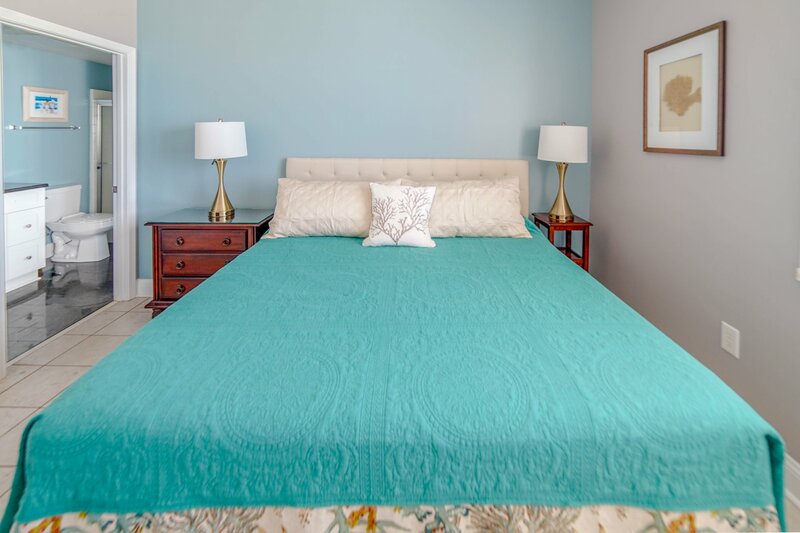 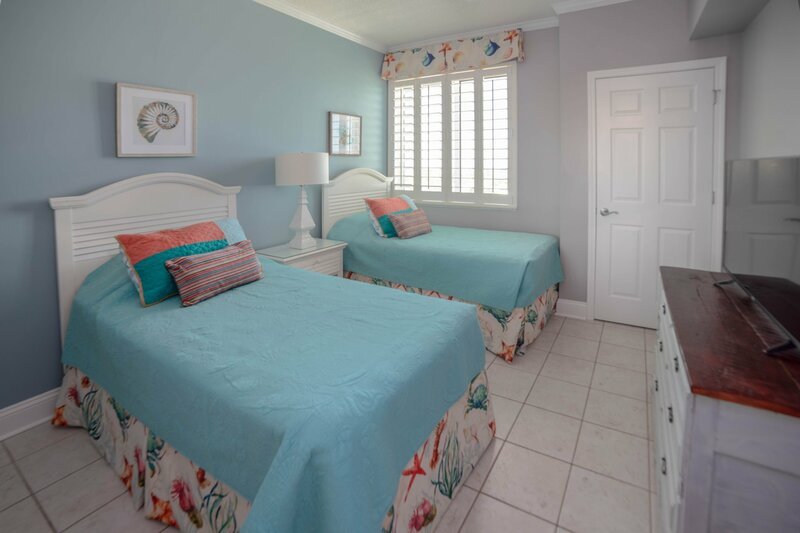 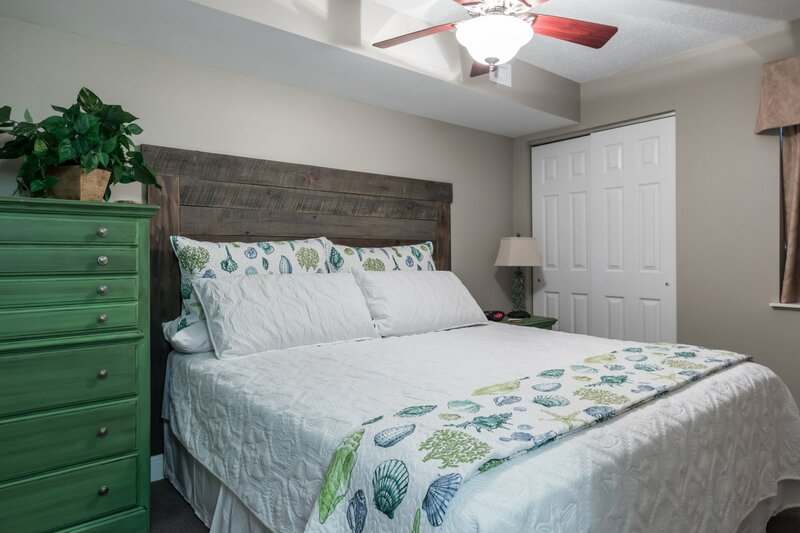 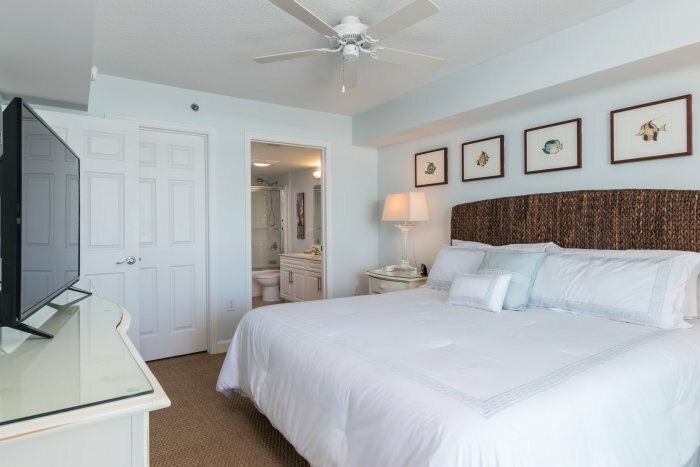 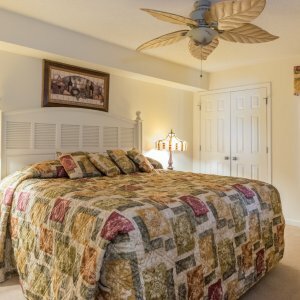 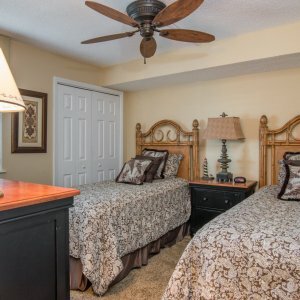 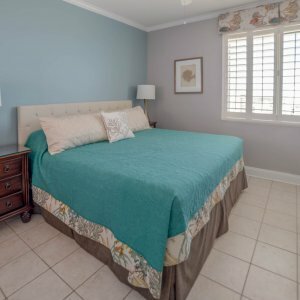 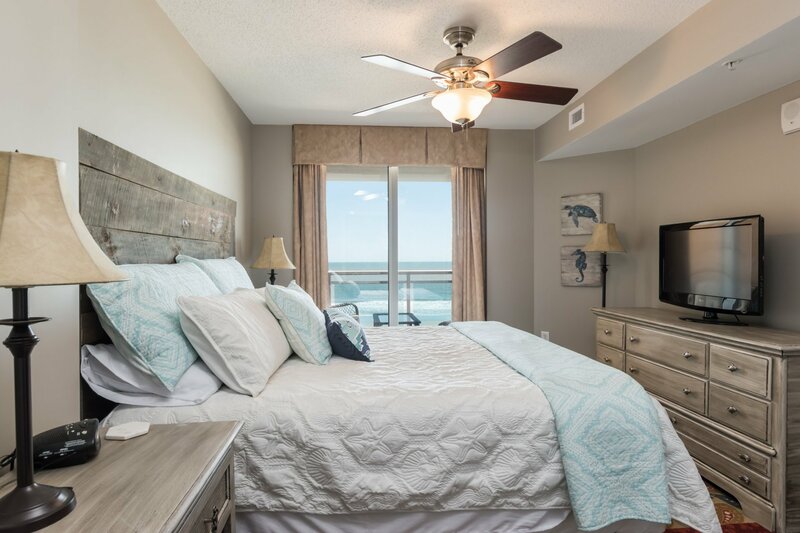 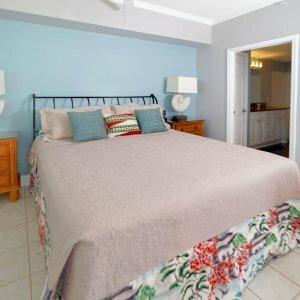 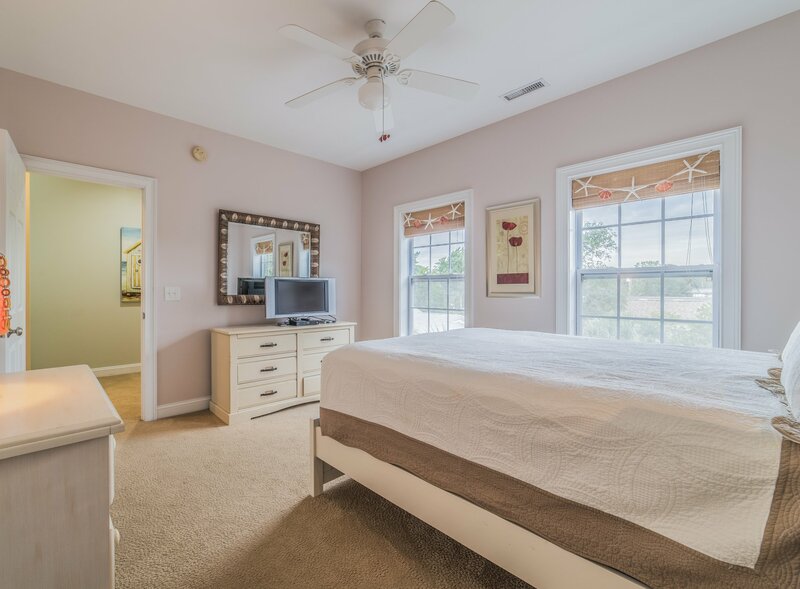 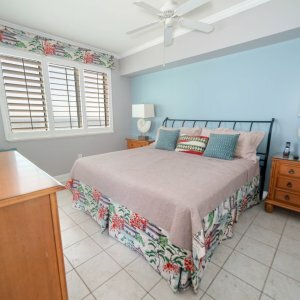 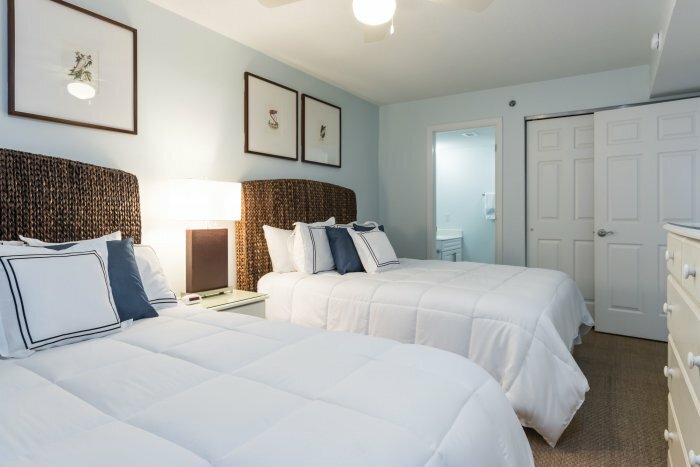 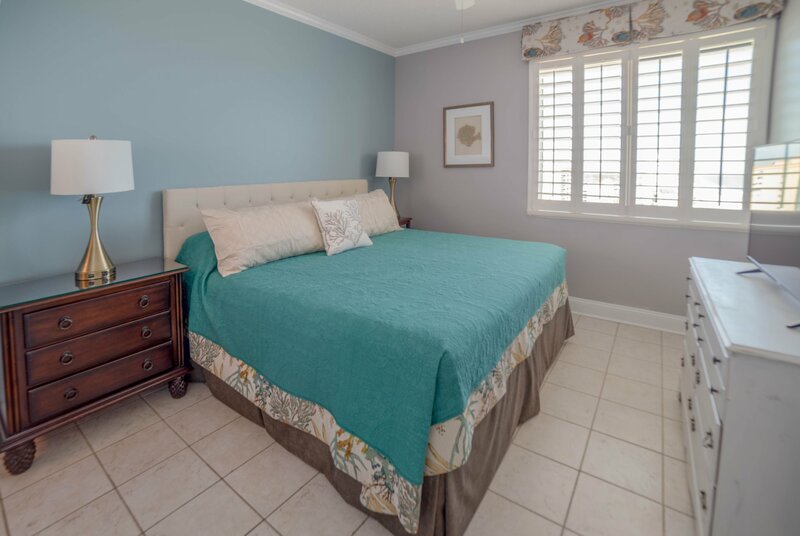 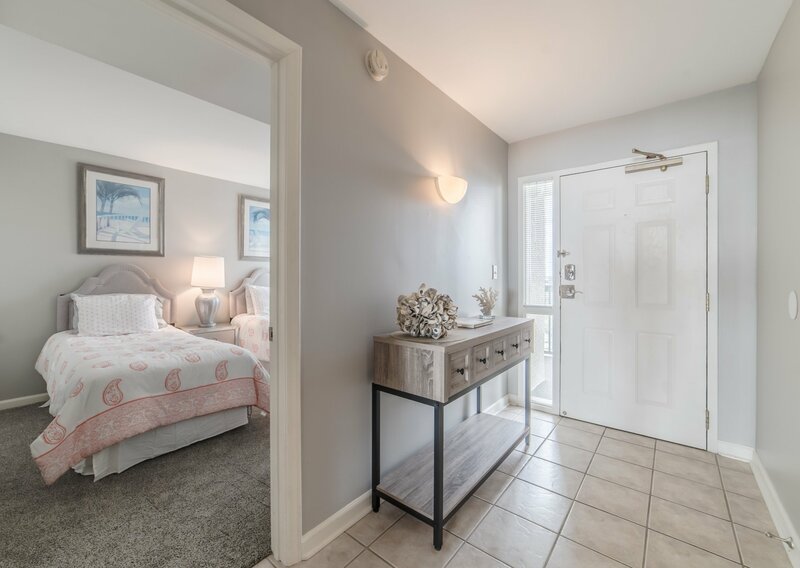 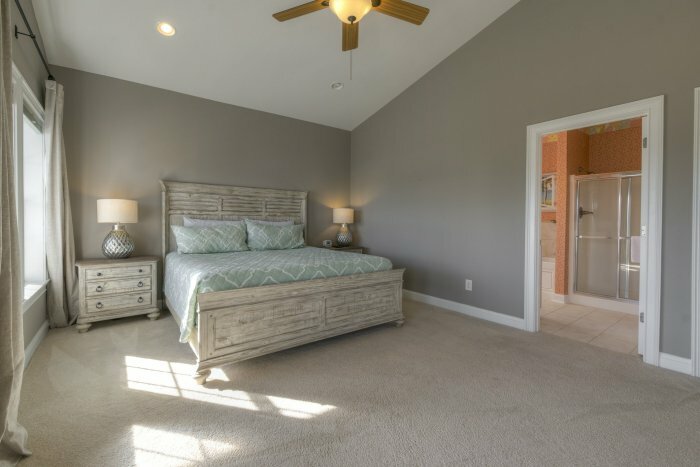 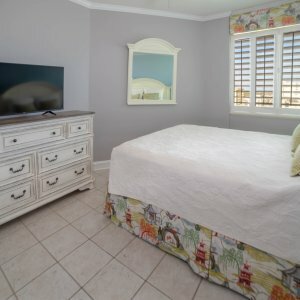 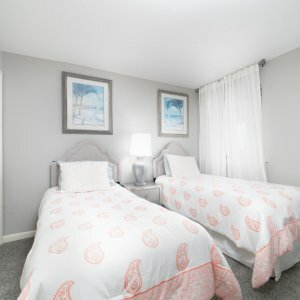 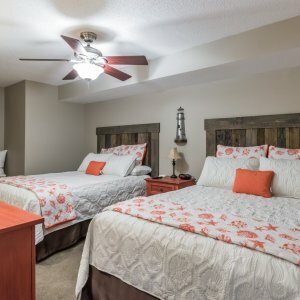 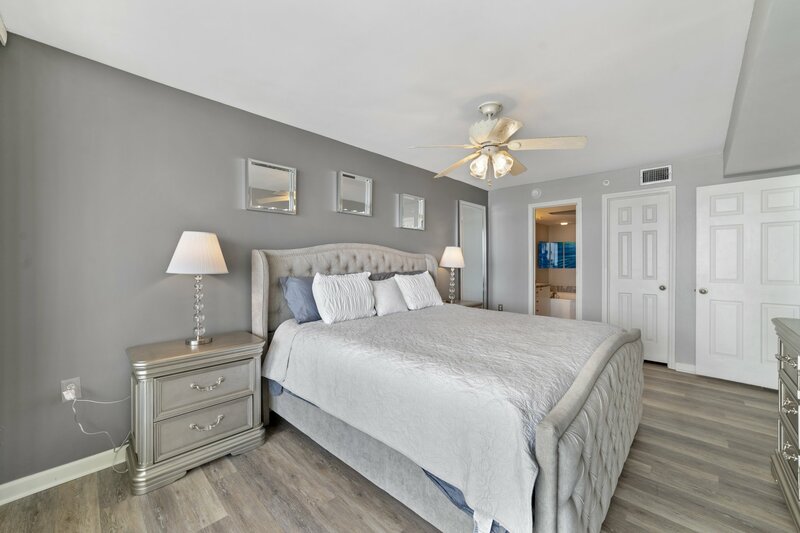 Each bedroom is decorated with soft coastal hues and features high-quality bedding, along with 43-inch 4K Ultra HD Smart TVs with Roku, keeping your comfort in mind. 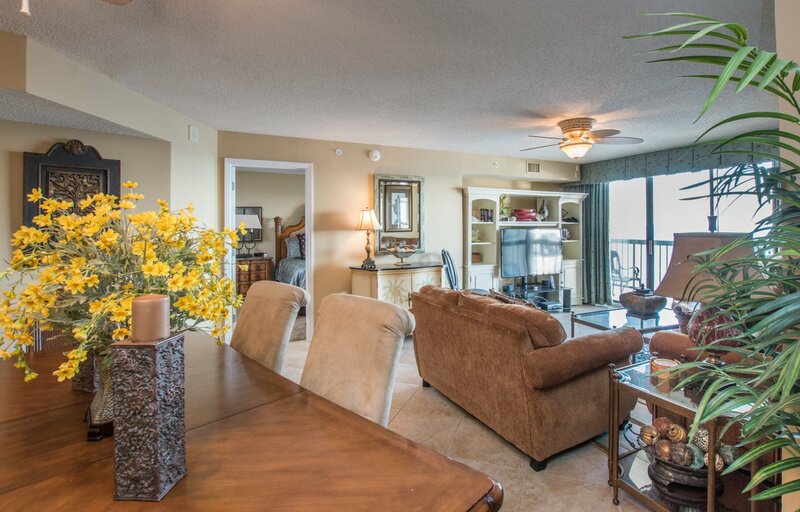 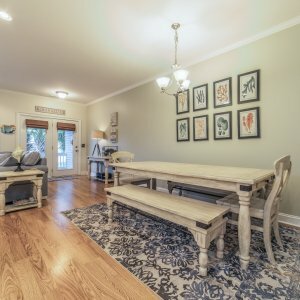 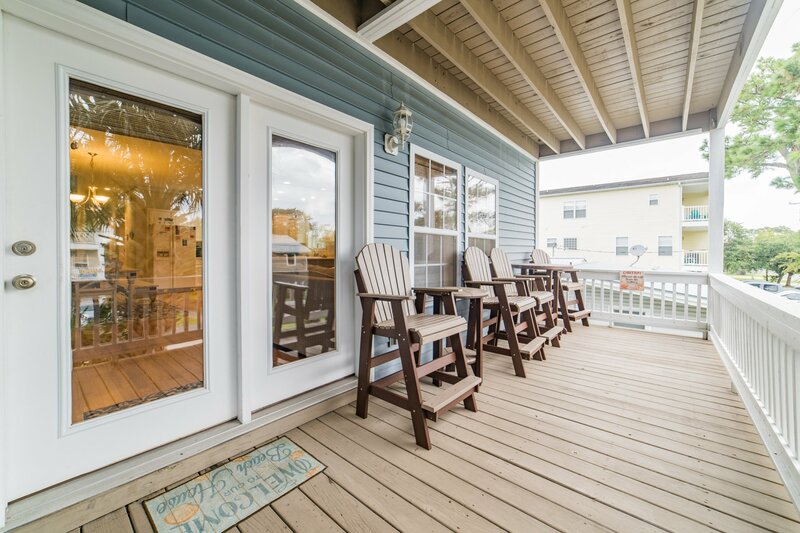 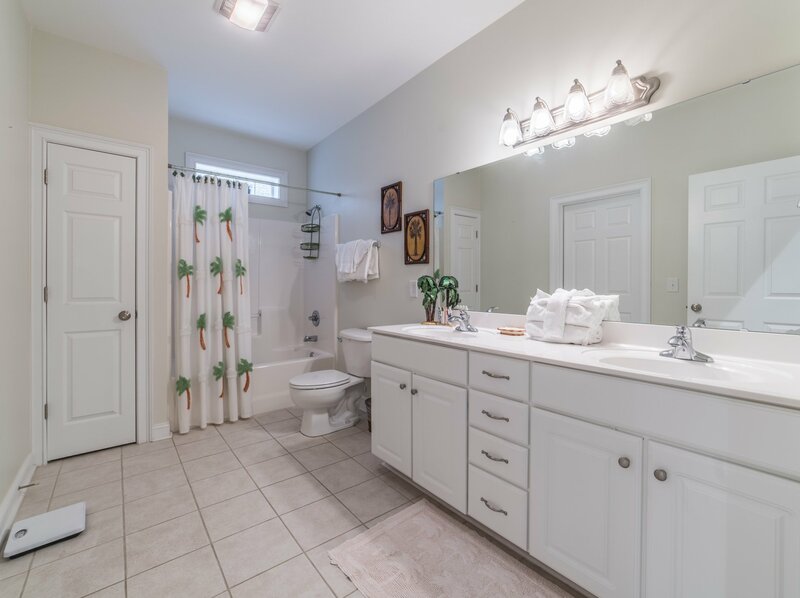 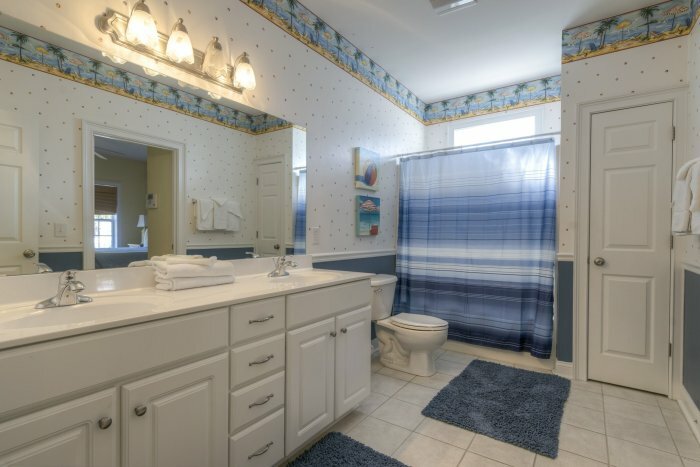 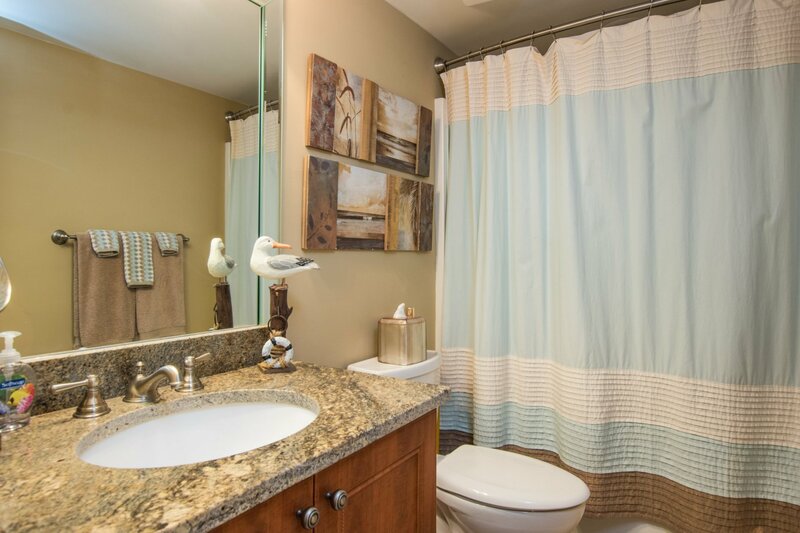 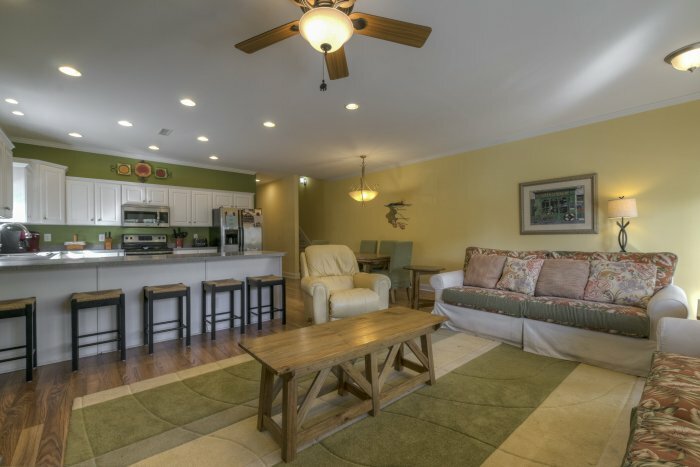 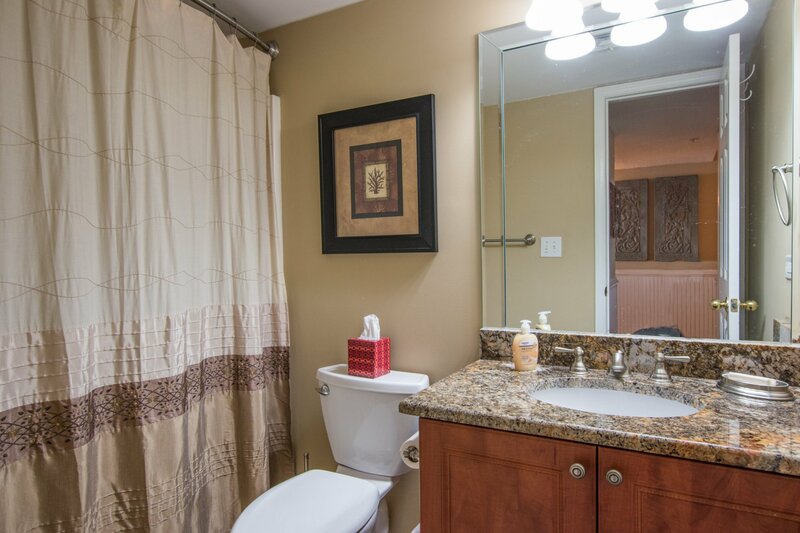 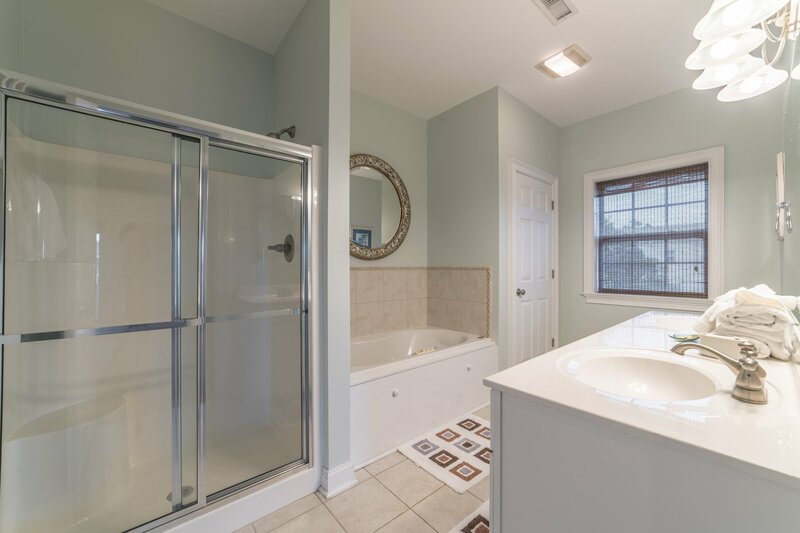 Come enjoy this beautiful condo, and you are sure to return year after year!